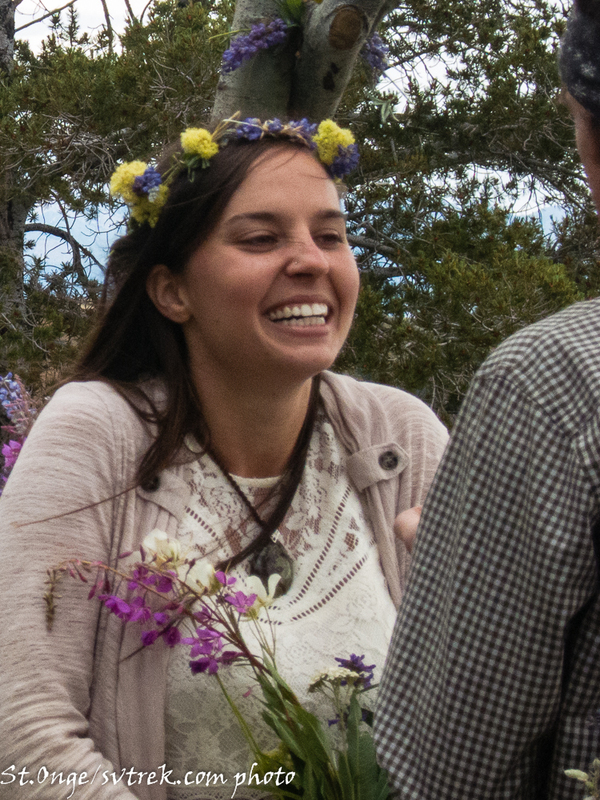 Ah, what a celebration! 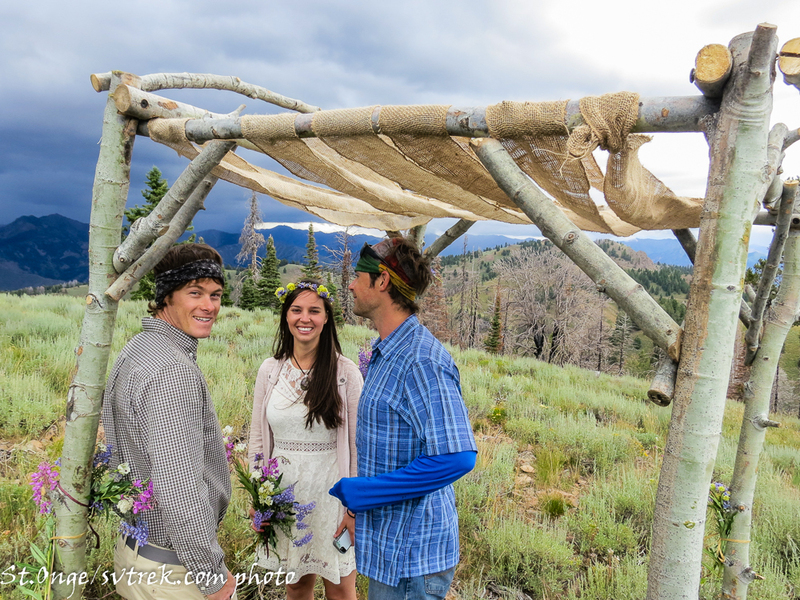 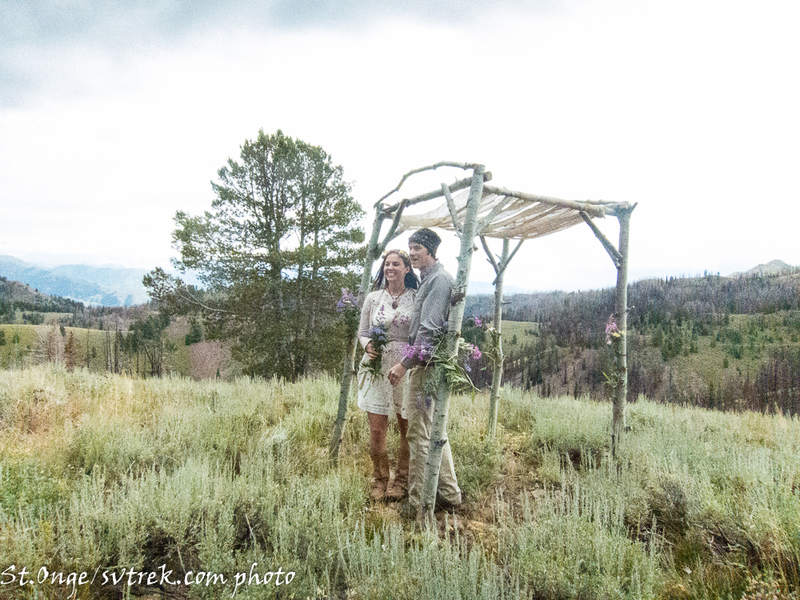 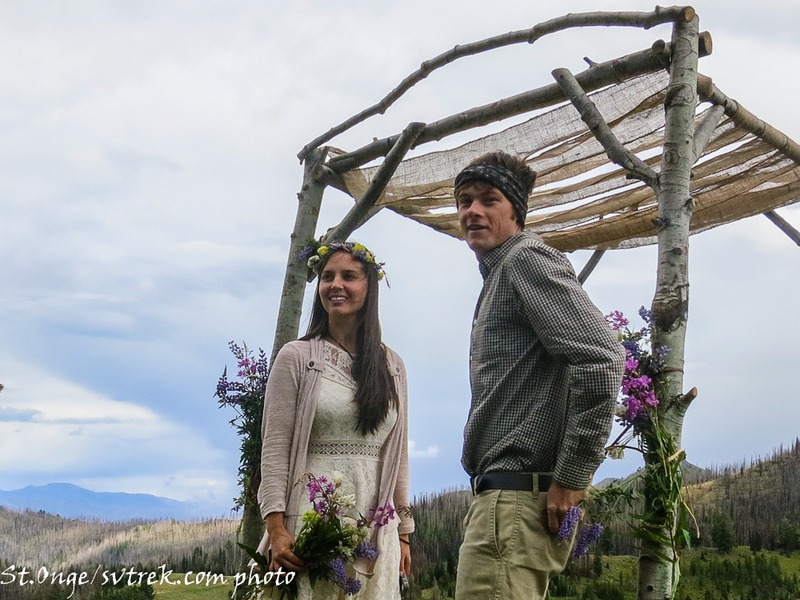 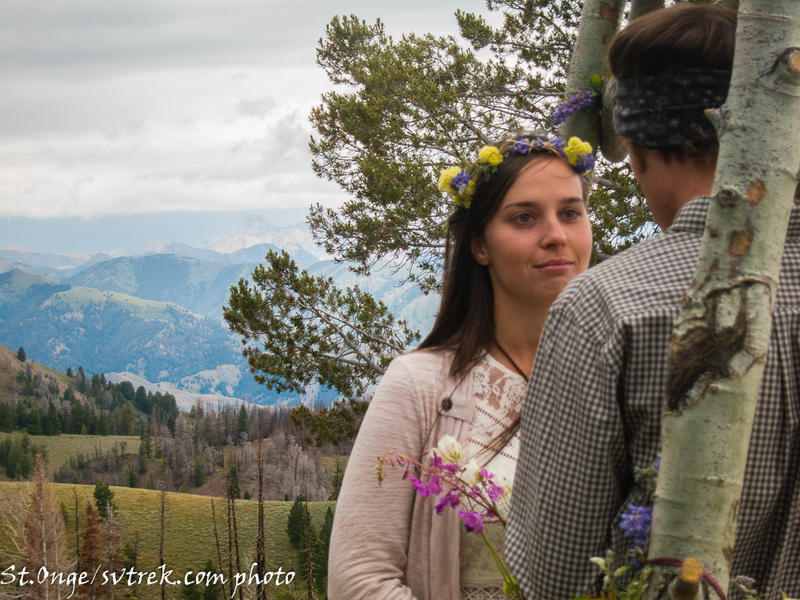 SVT guide, Jonathan Preuss (JP) married his lovely bride, Michelle, on the Coyote Yurts point at 8700’deep in the Smokey Mountains of Central Idaho. 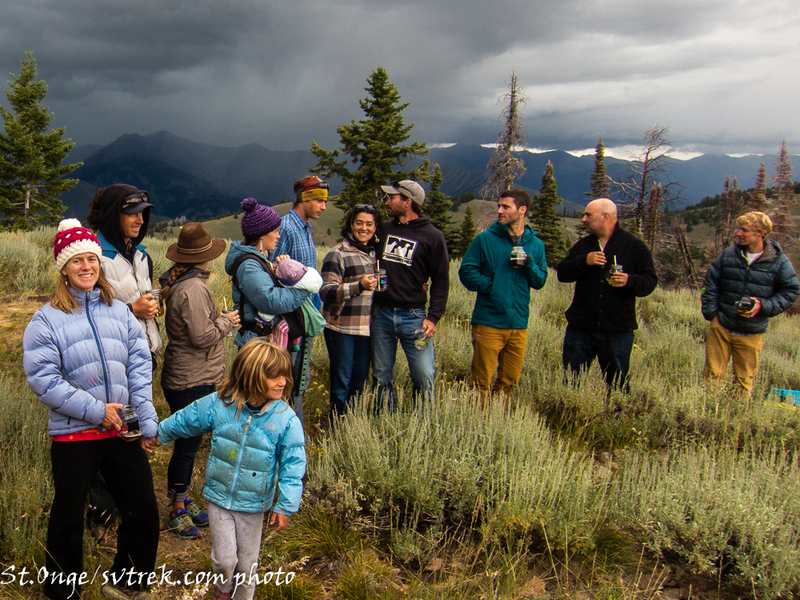 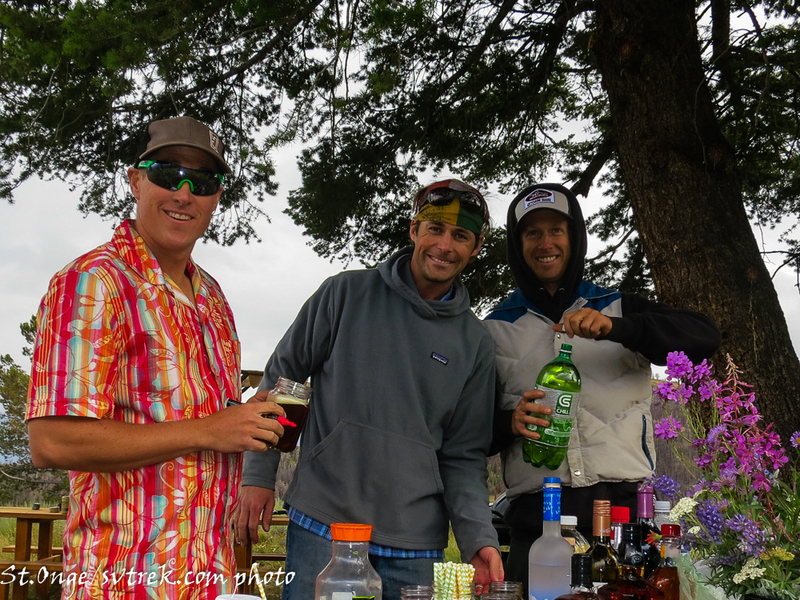 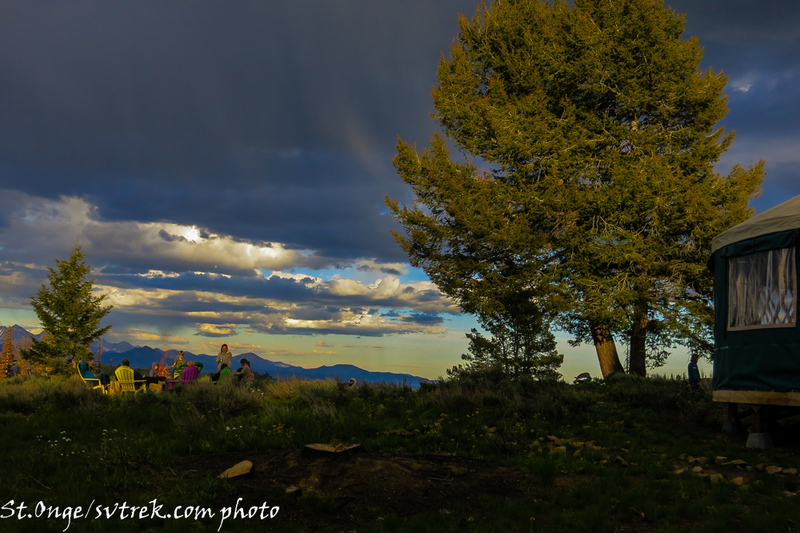 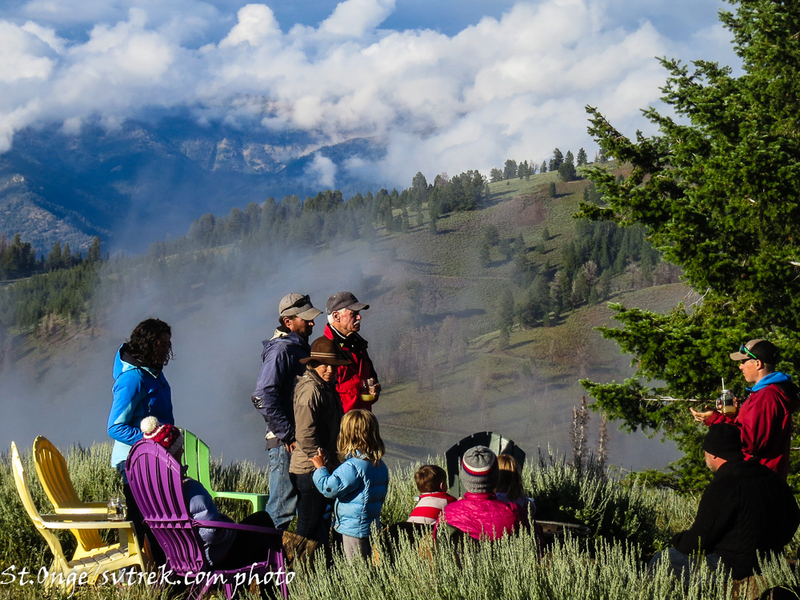 Good friends gathered to embrace the passing hail storms and drink in the beauty and power of the mountains and of LOVE! 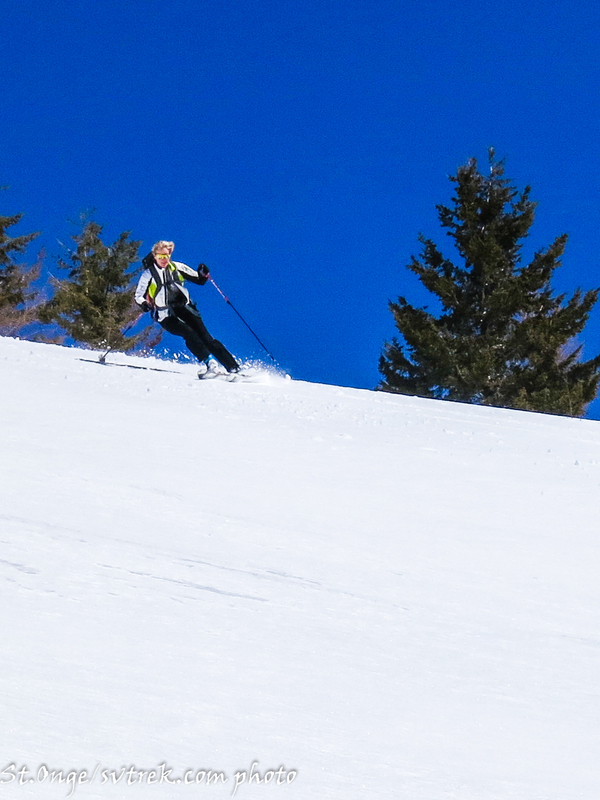 and the sun came out!! 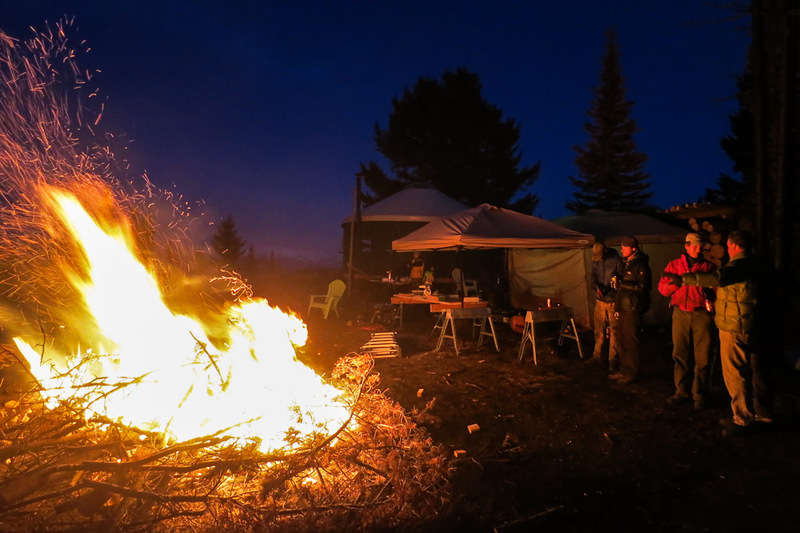 and the Pios lit up…. 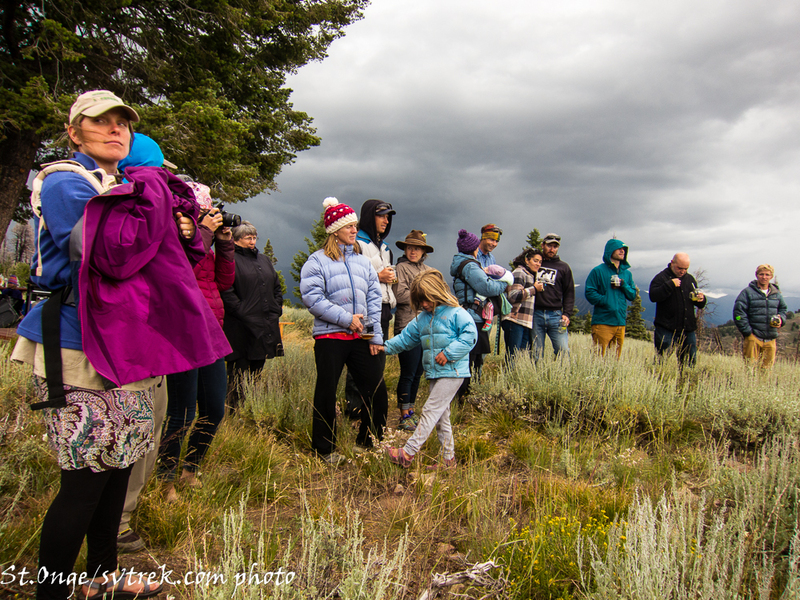 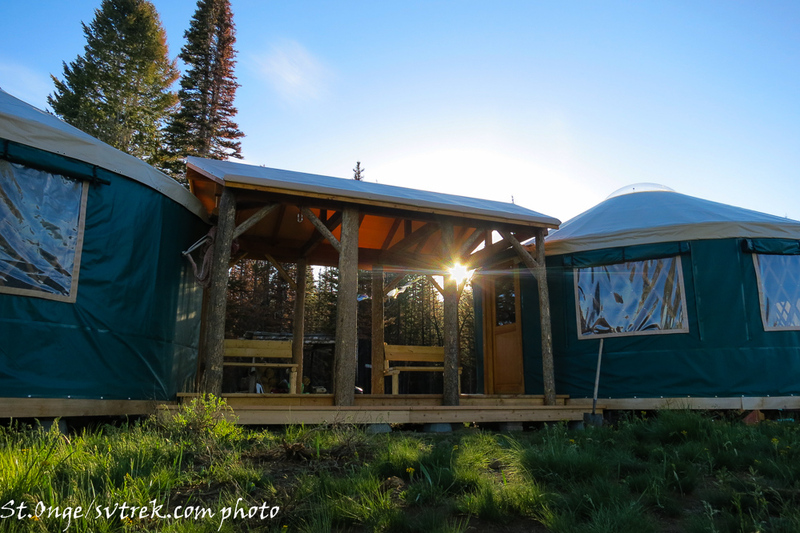 We are just back from celebrating the Summer Solstice on the point at the new Coyote Yurts. 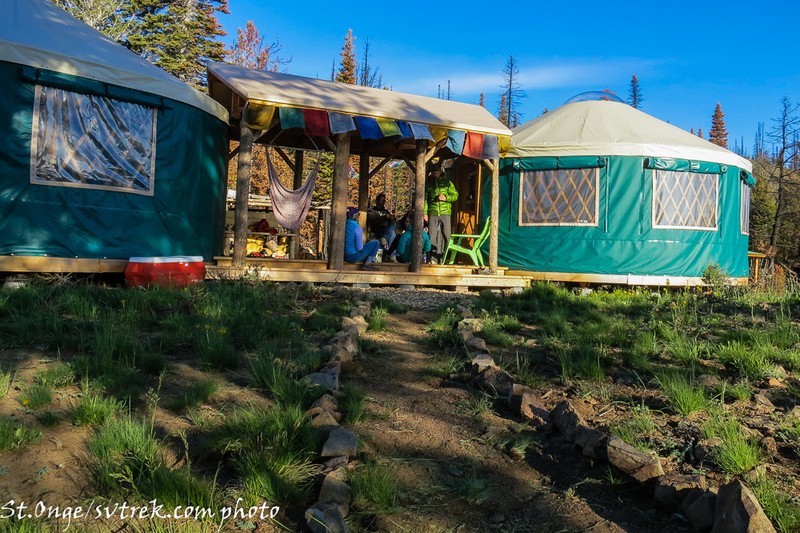 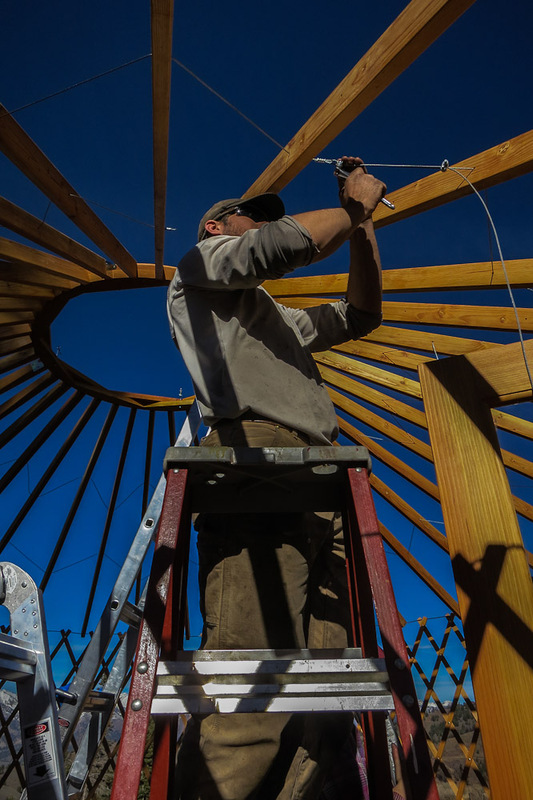 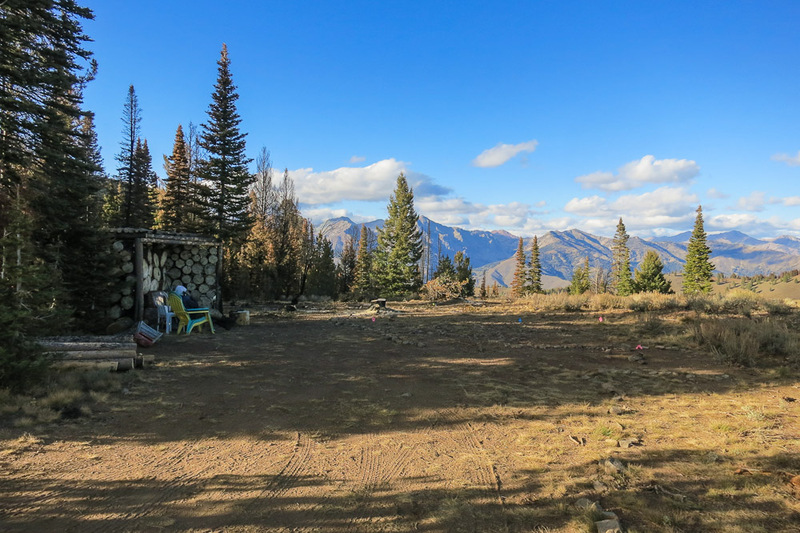 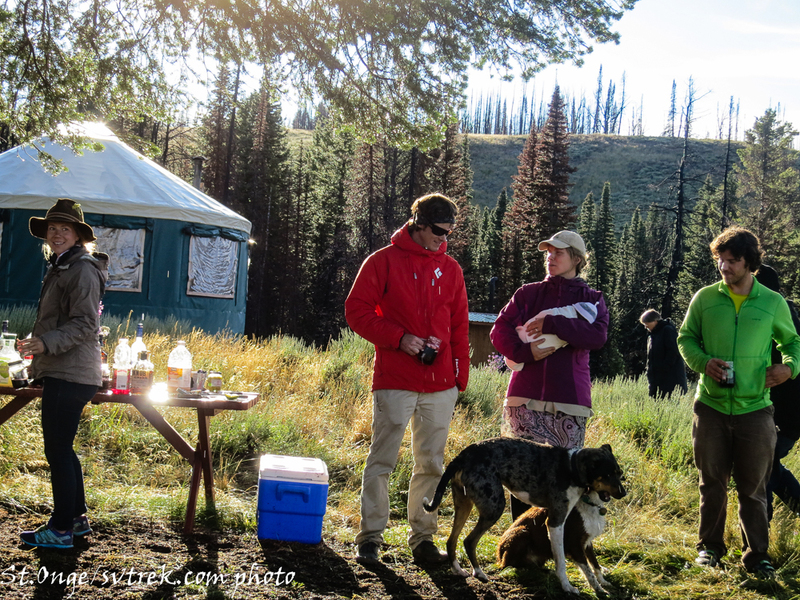 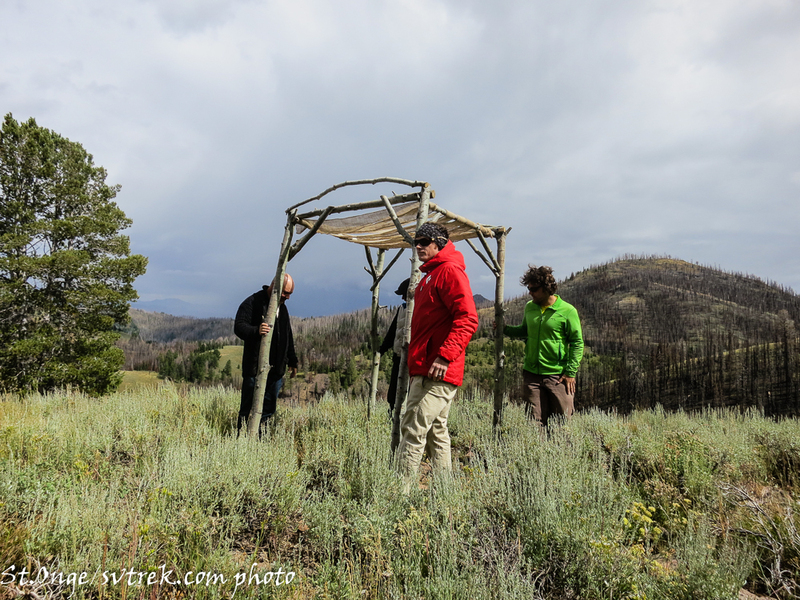 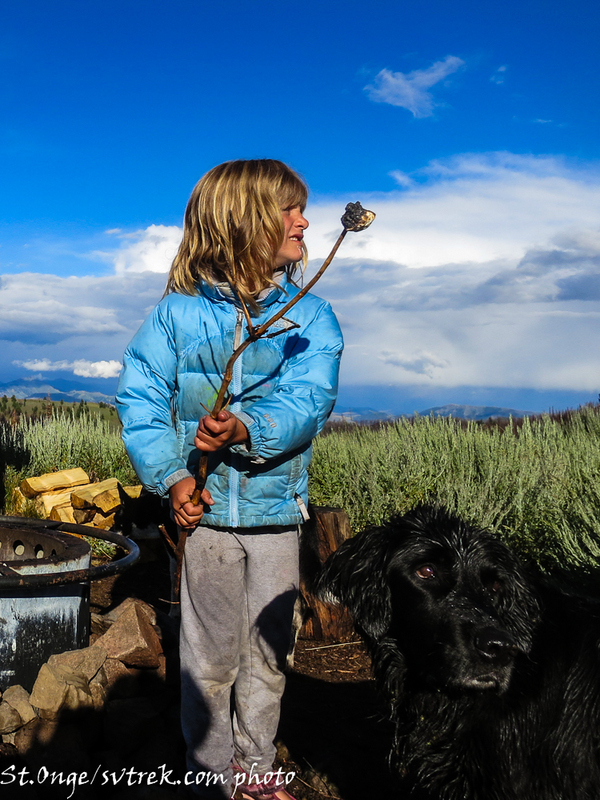 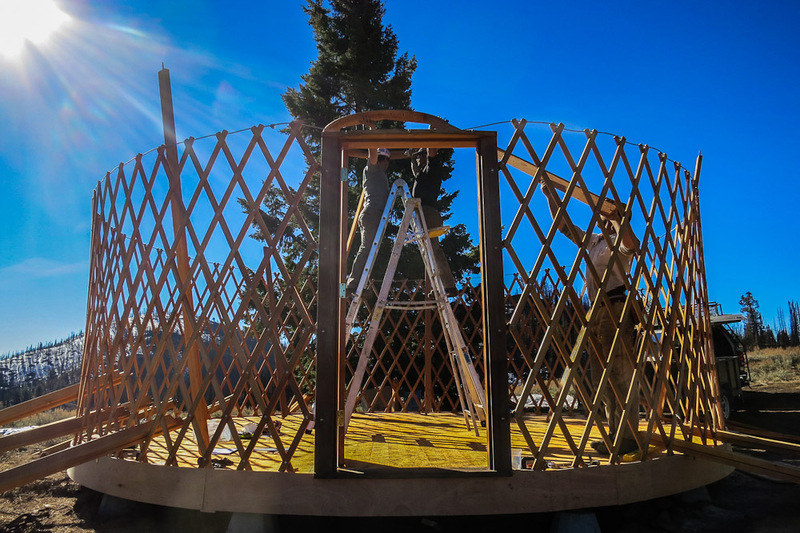 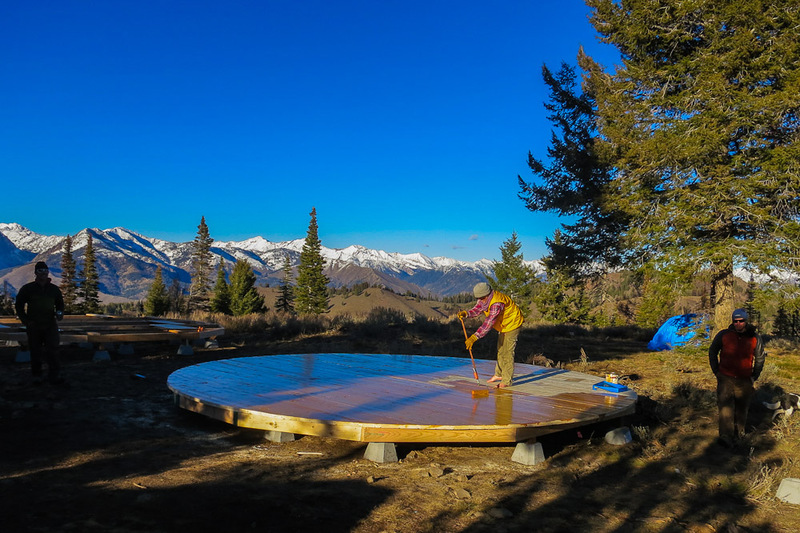 After the Beaver Creek wild fire burned the Coyote Yurts last August, its been quite a journey to bring the Coyote Yurts back to life. 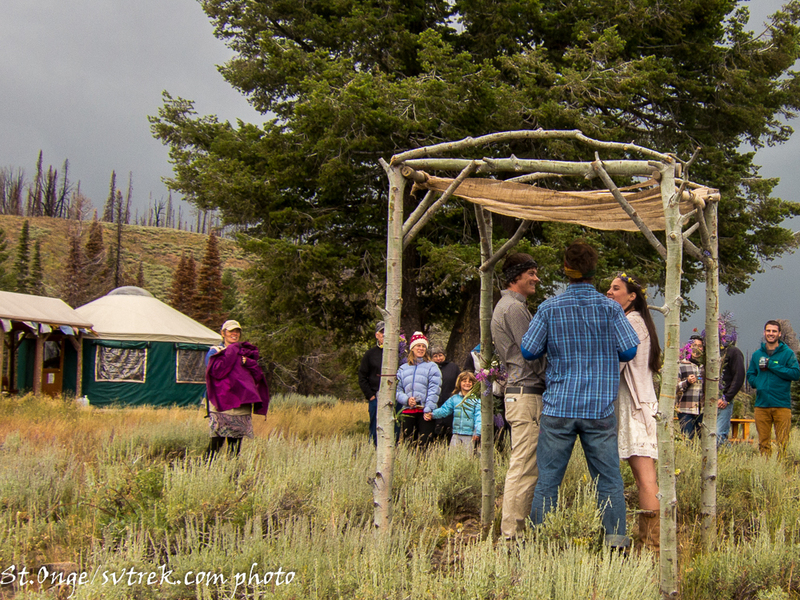 This past weekend marked the final (planned) stage in this process! 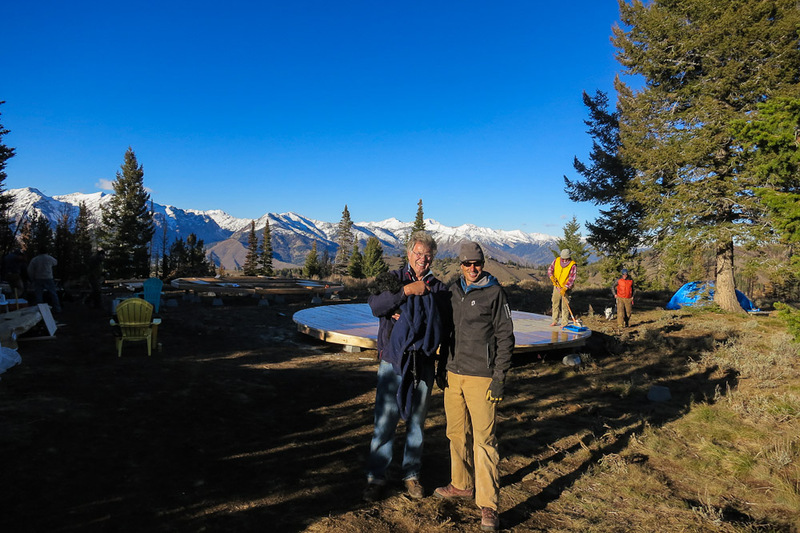 Joe, Niels and Aysha went up a couple days early to finish construction of the outdoor areas including benches and stoop on the deck, picnic table, barbeque, new fire pit and dance floor on the point and a bike corral. 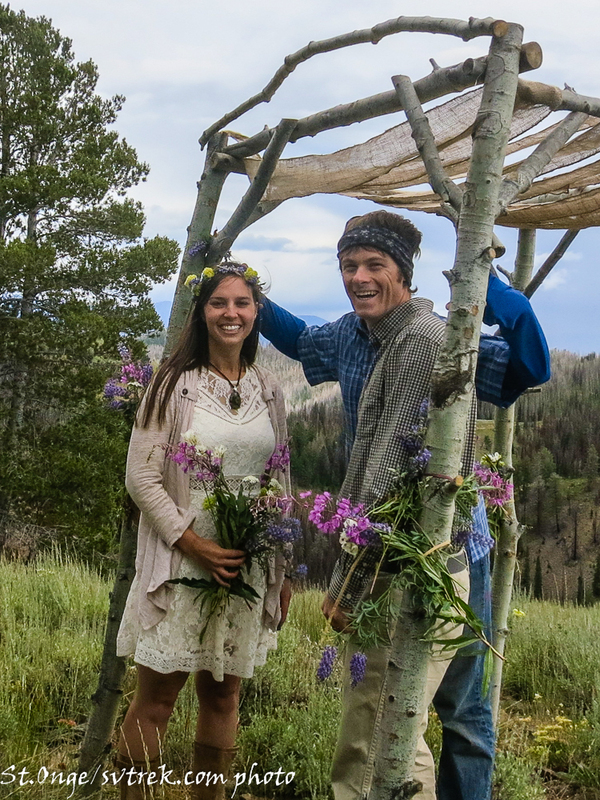 It all turned out beautifully. 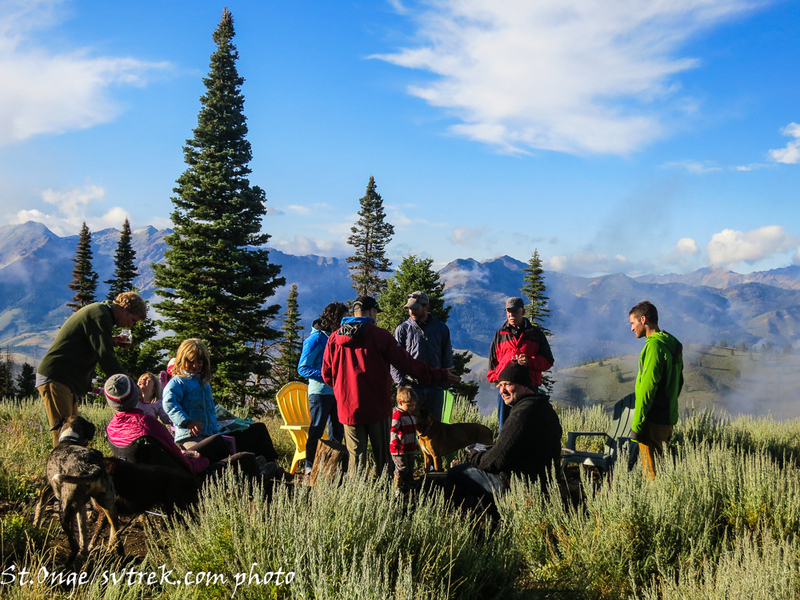 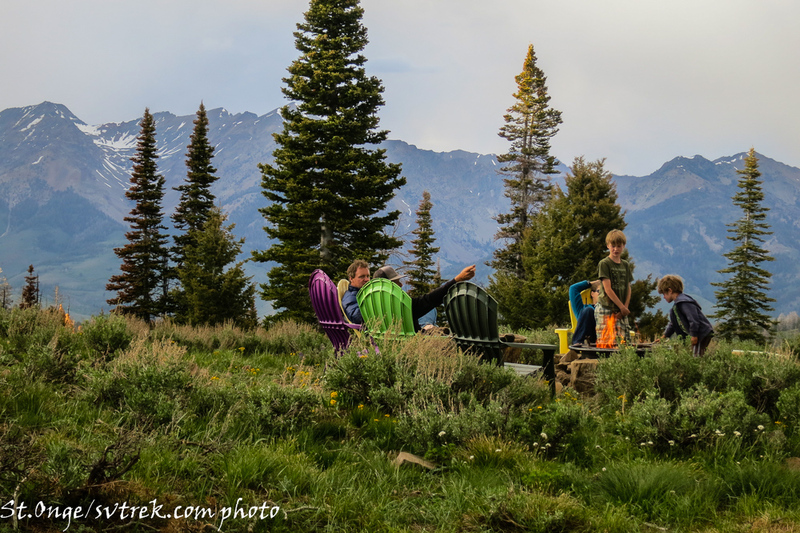 Then it was time for friends and family to converge in this special spot to enjoy the longest day of the year. 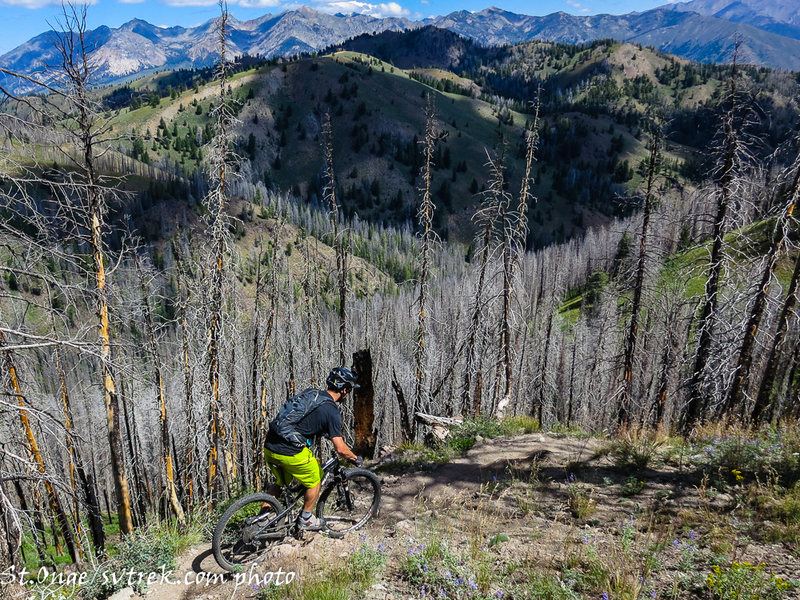 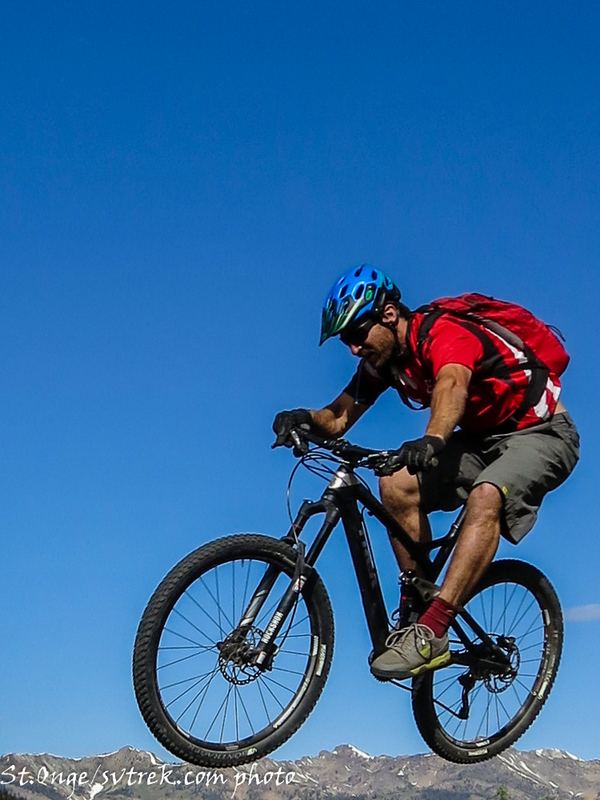 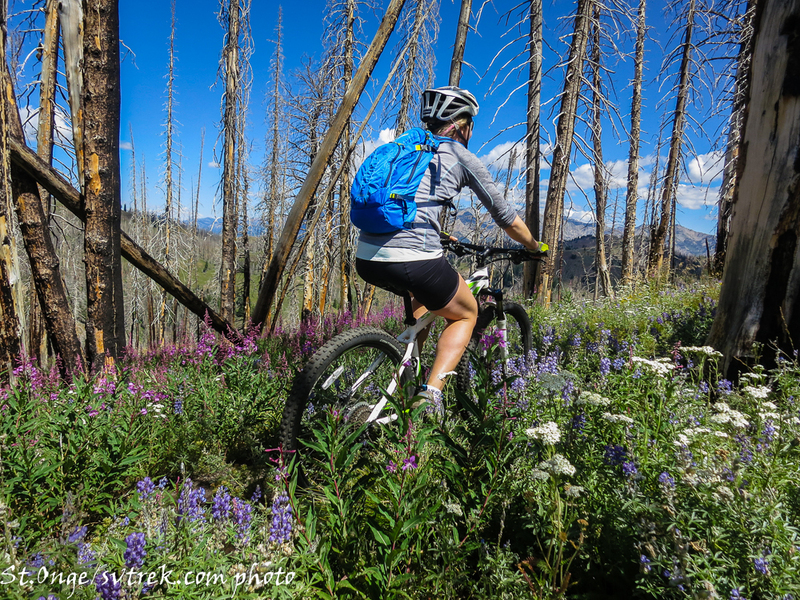 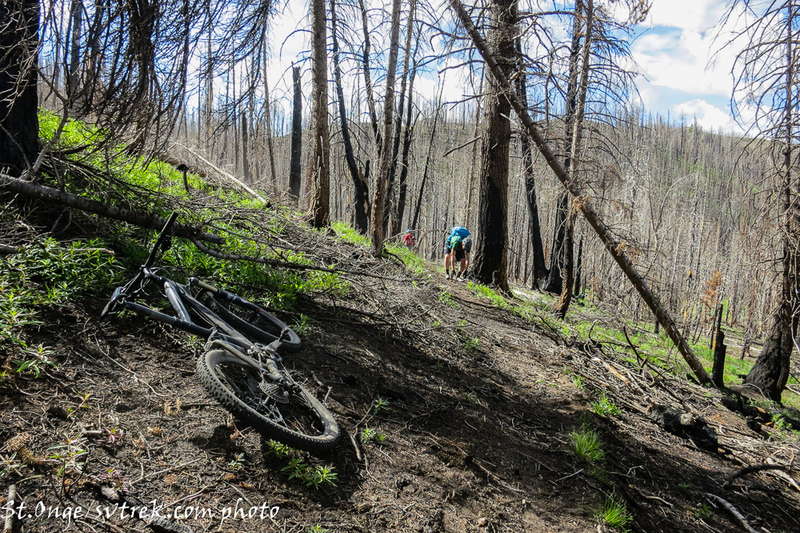 Biking, hiking, dancing, good food and good times! 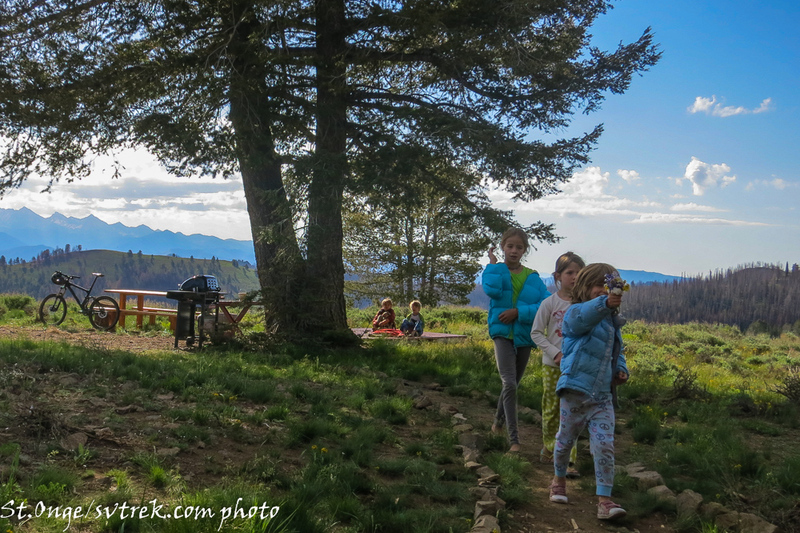 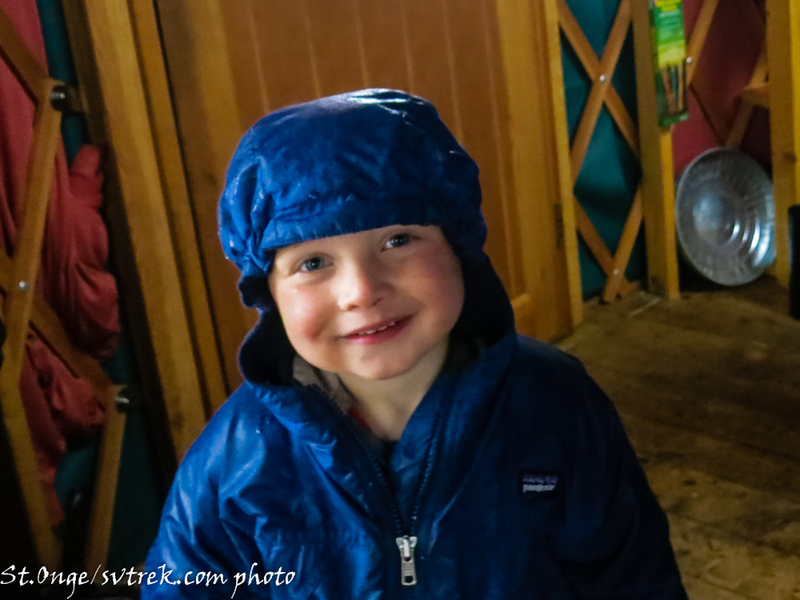 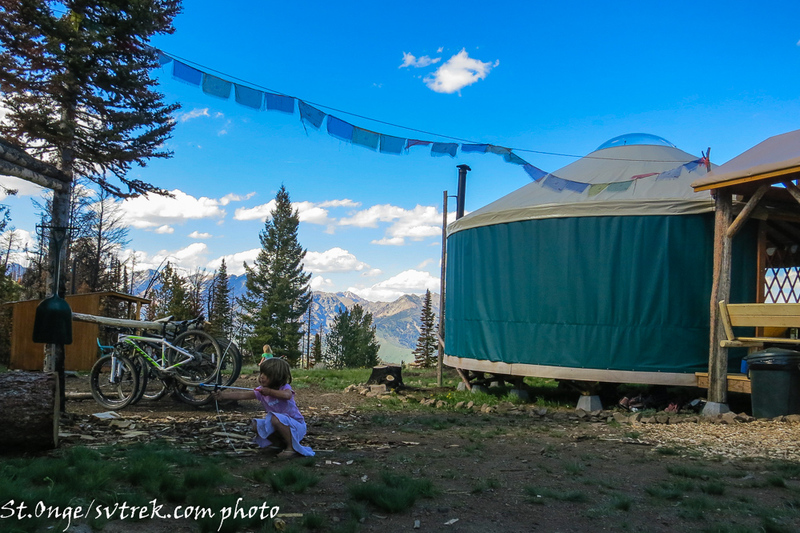 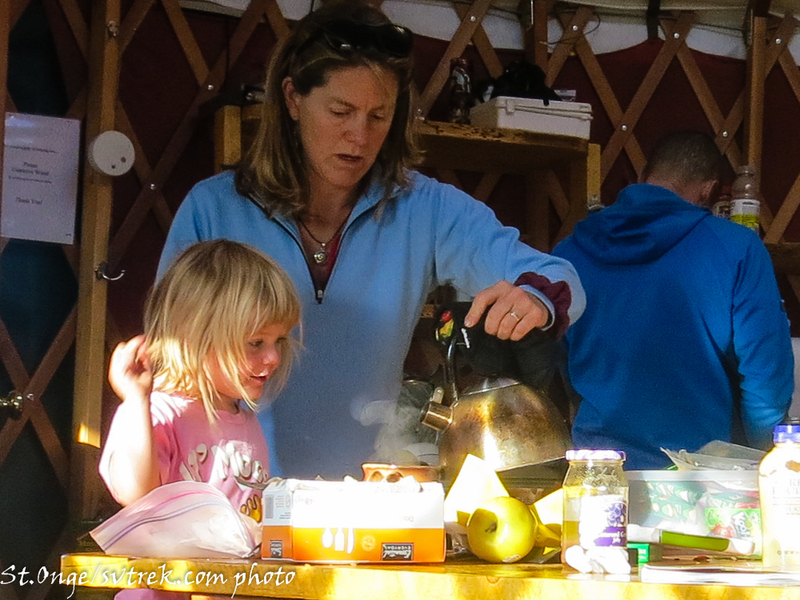 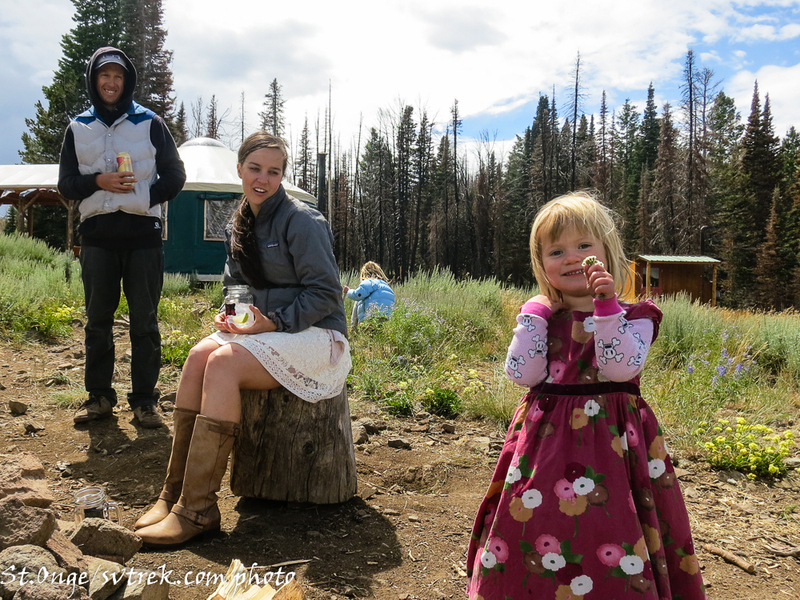 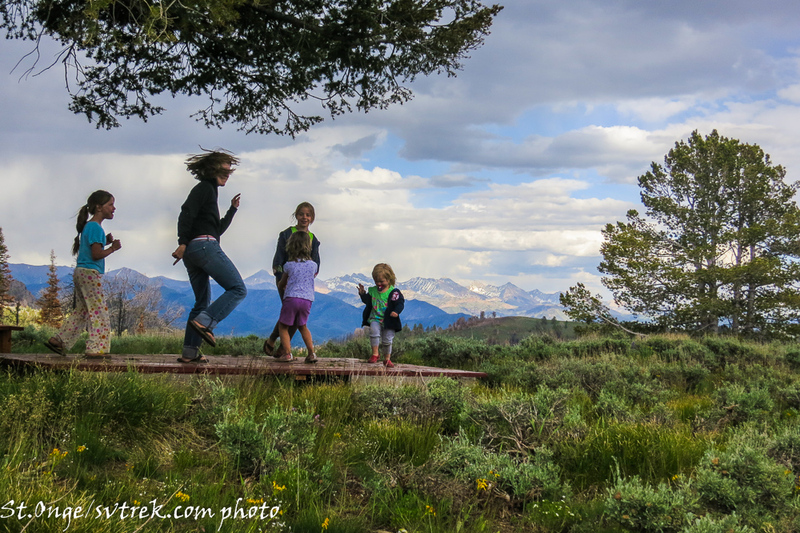 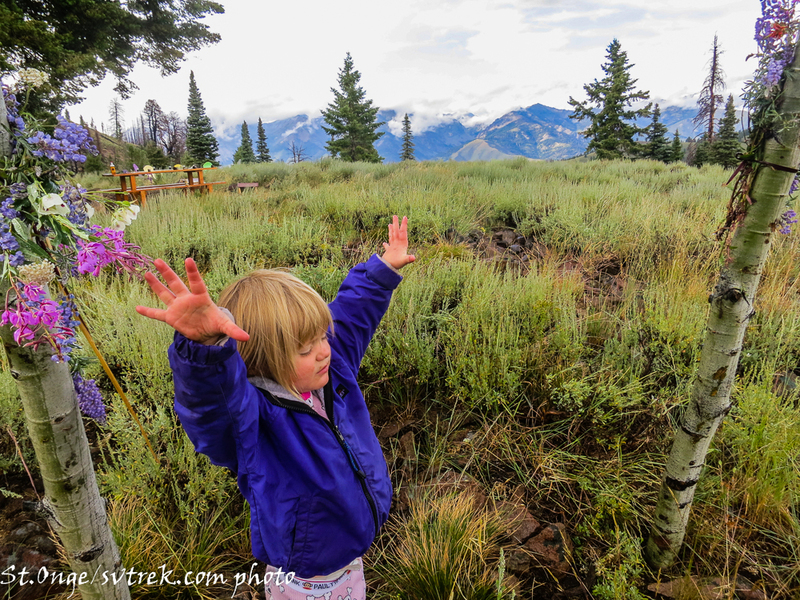 Kids LOVE the yurt experience! 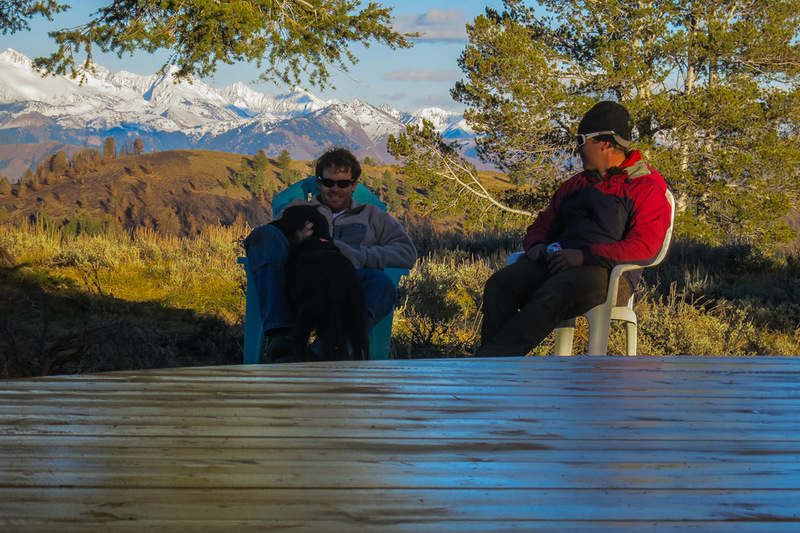 The deck makes for a comfy hang spot any-time of day. 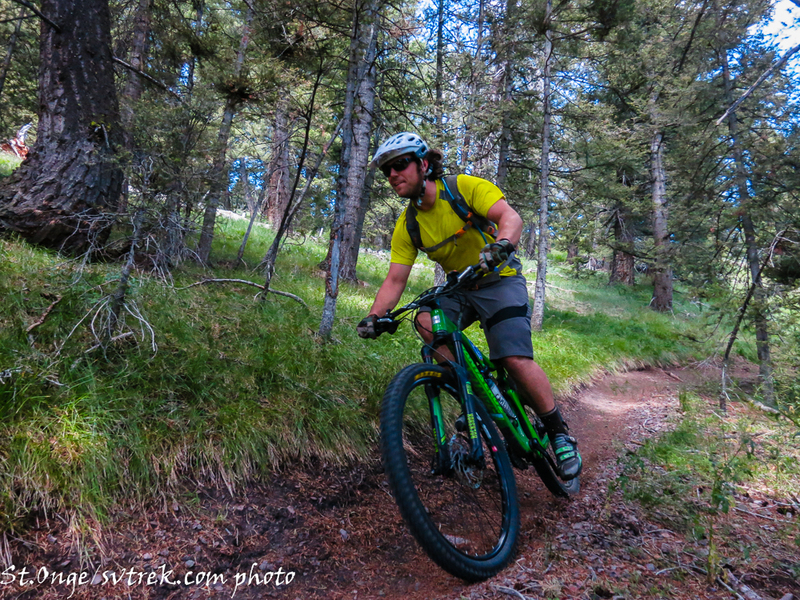 Fox Peak sure is riding nice! 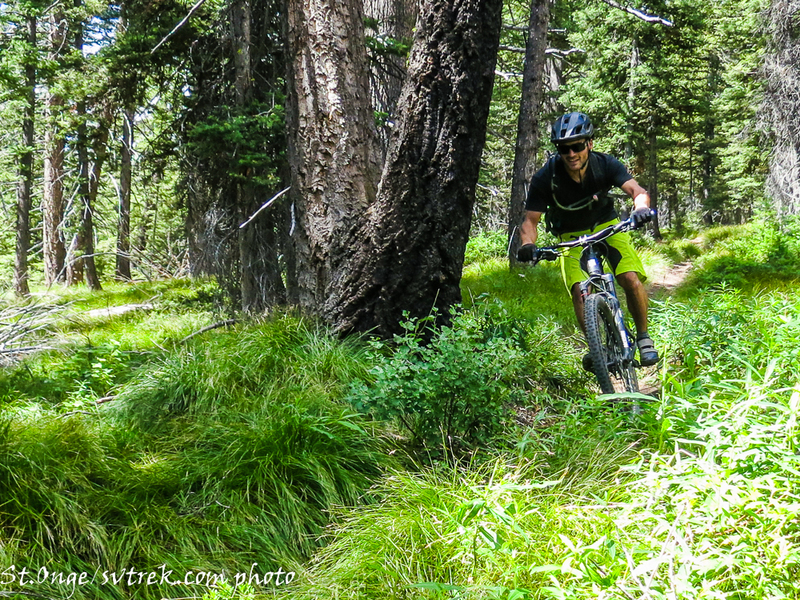 Can’t hold back a smile on these trails! 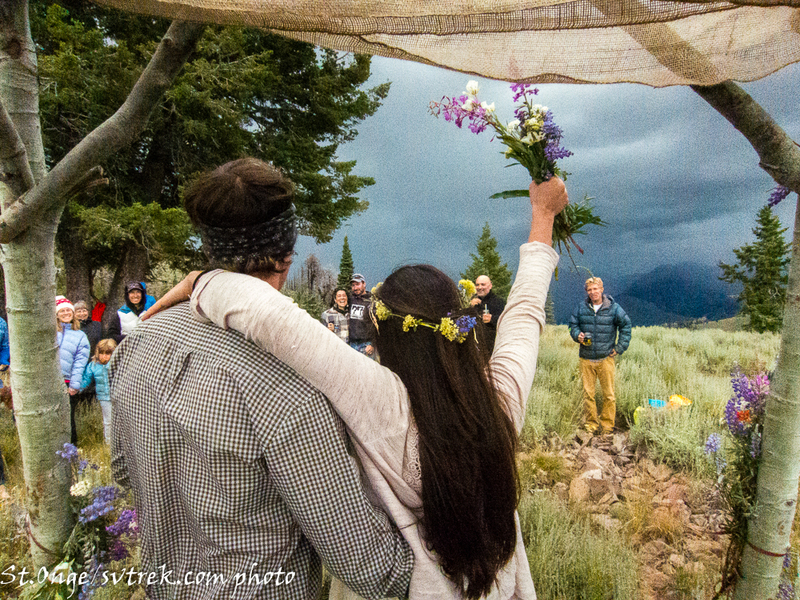 The newlyweds on the point. 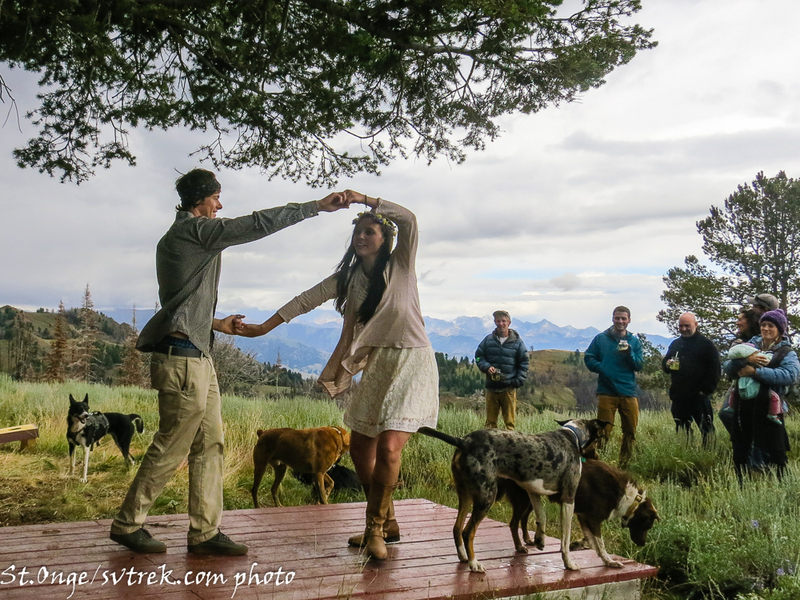 Dance party on the point! 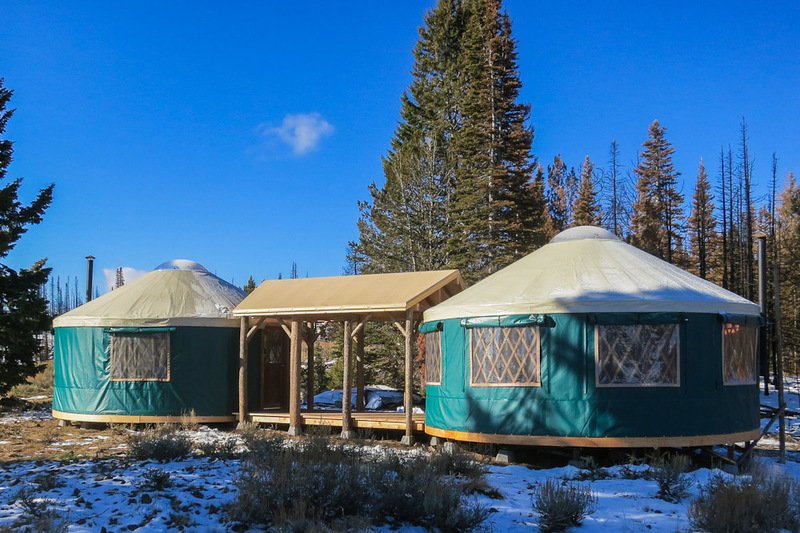 Rising from the flames, the new Coyote Yurts! 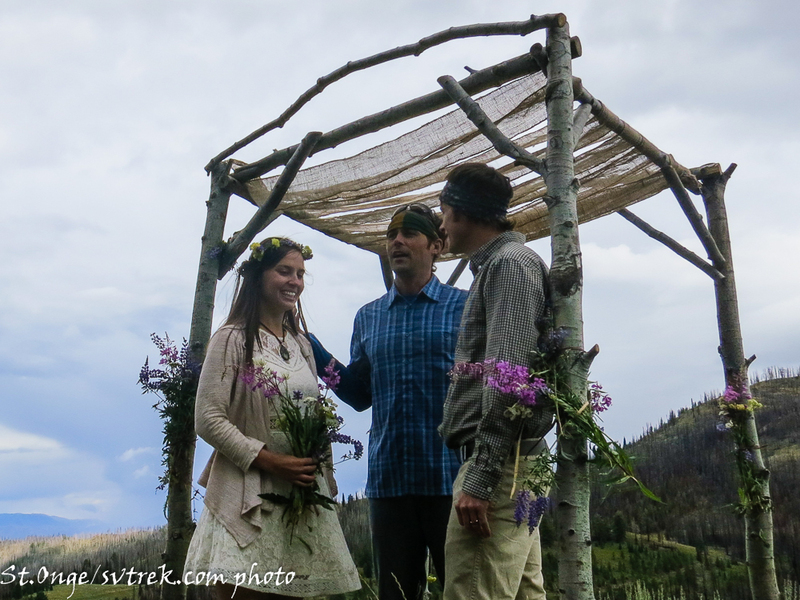 We Did It!! 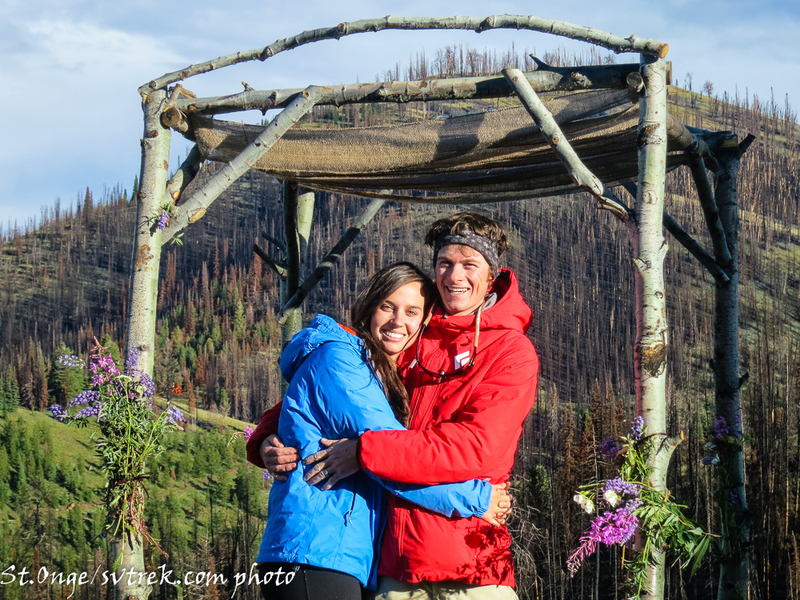 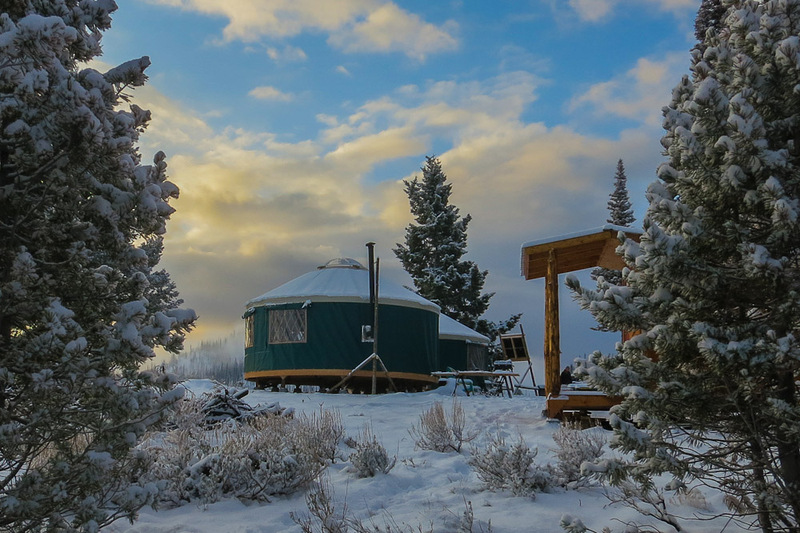 Less than two months after the Beaver Creek Fire incinerated the Coyote Yurts, we have built a beautiful new Coyote. 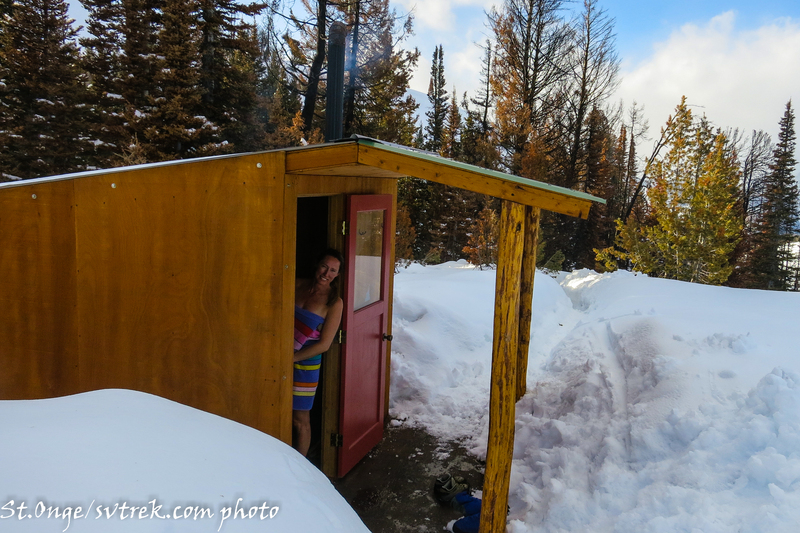 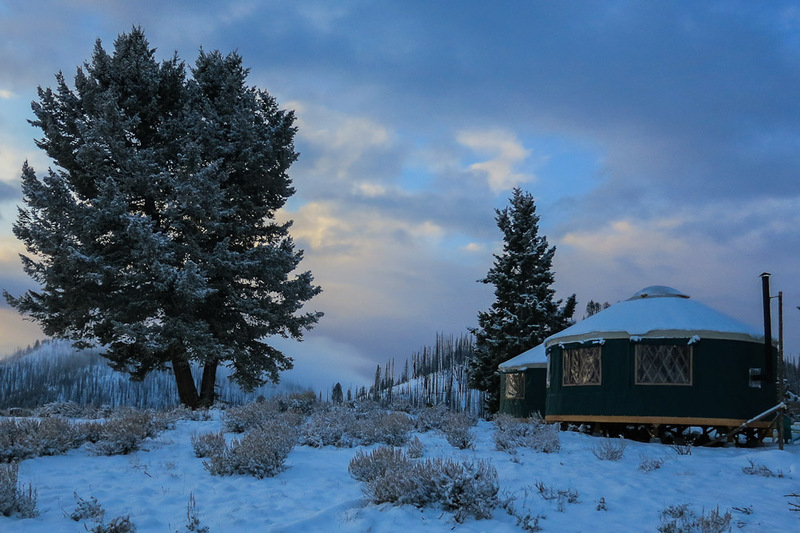 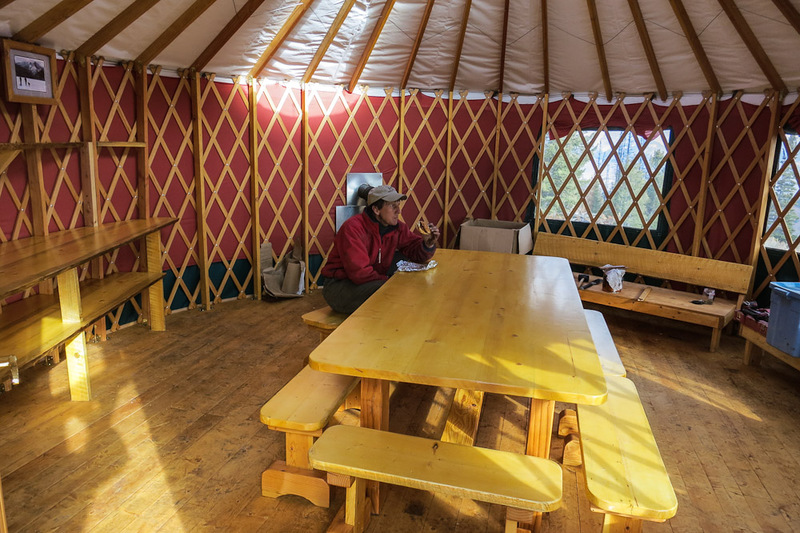 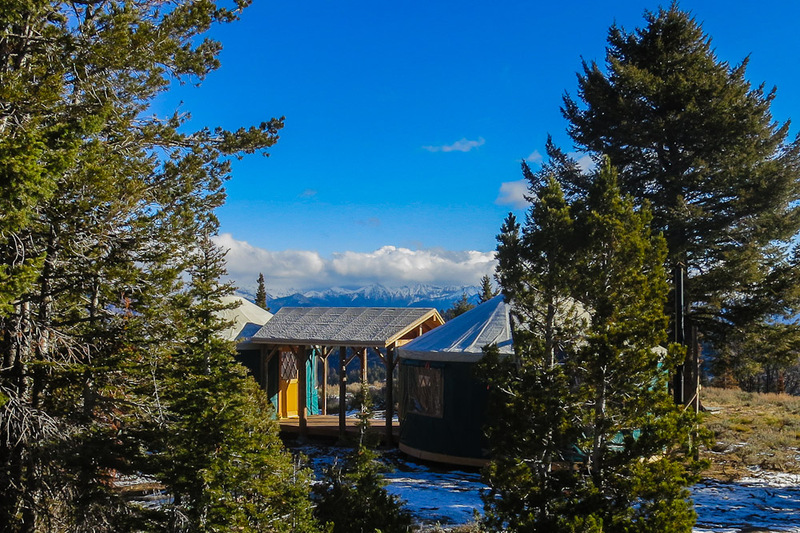 Two yurts connected by a covered breezeway, new sauna and outhouse are ready for backcountry travelers. 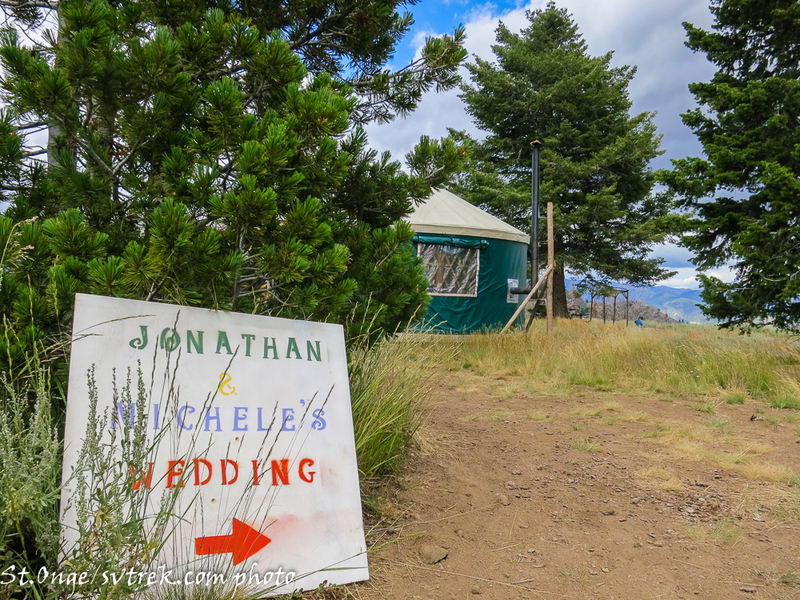 This situation was extreme. 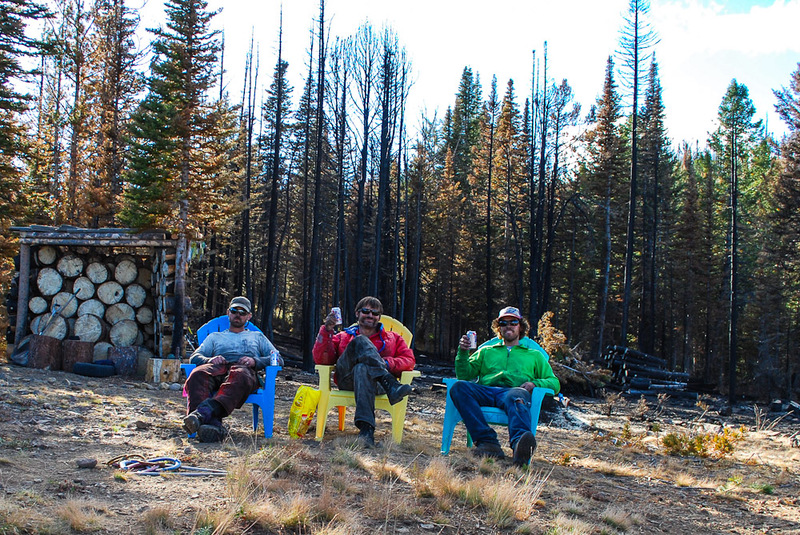 There was the worry and anticipation of a major wild fire burning around three of our huts. 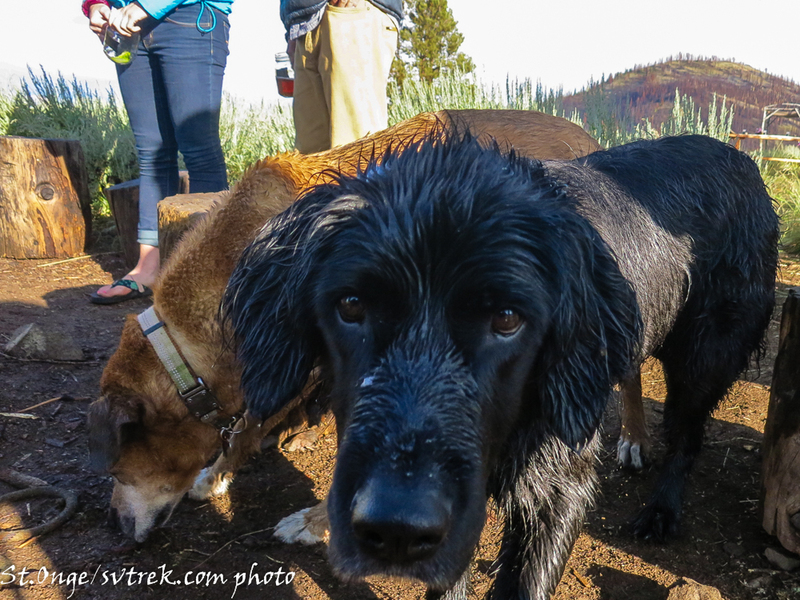 The confirmation that Coyote was gone was rough. 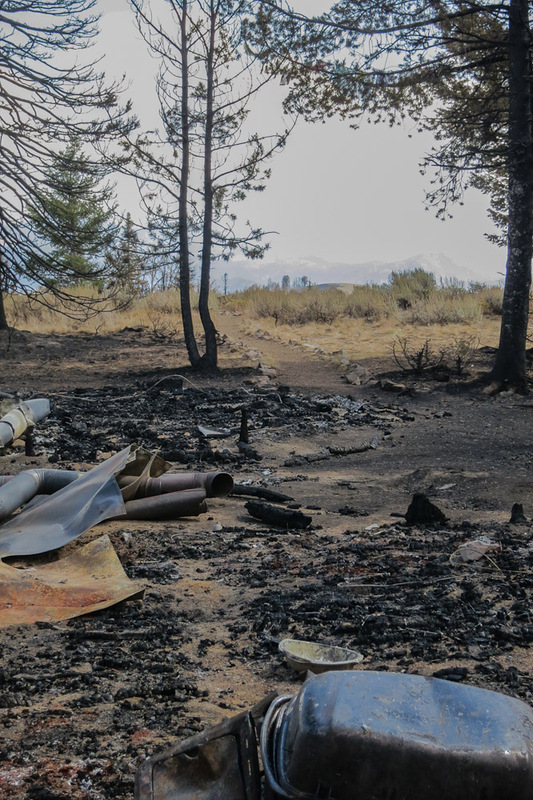 On our first visit to where the yurts were, the fire was still burning and the shock of the impact of the fire on a place we know and love was heavy. 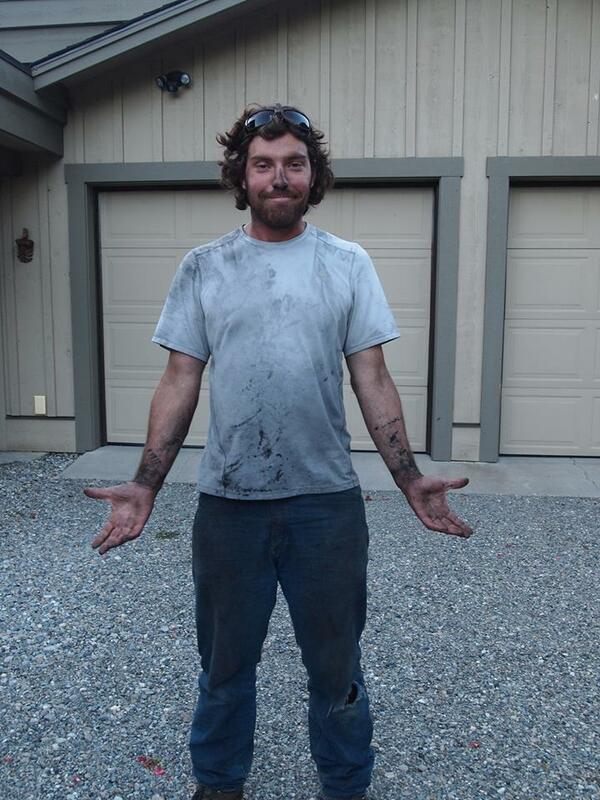 But it was the recognition that it is all OK. 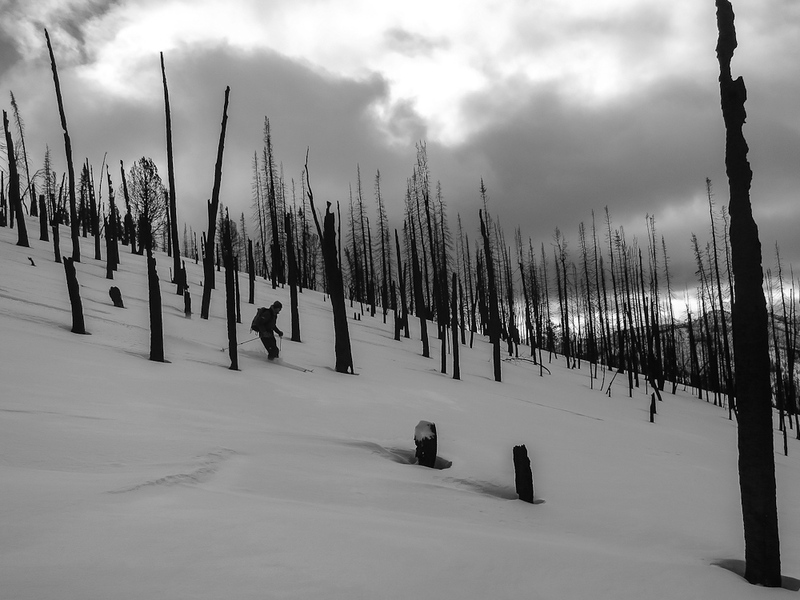 These mountains and forest depend on fire. 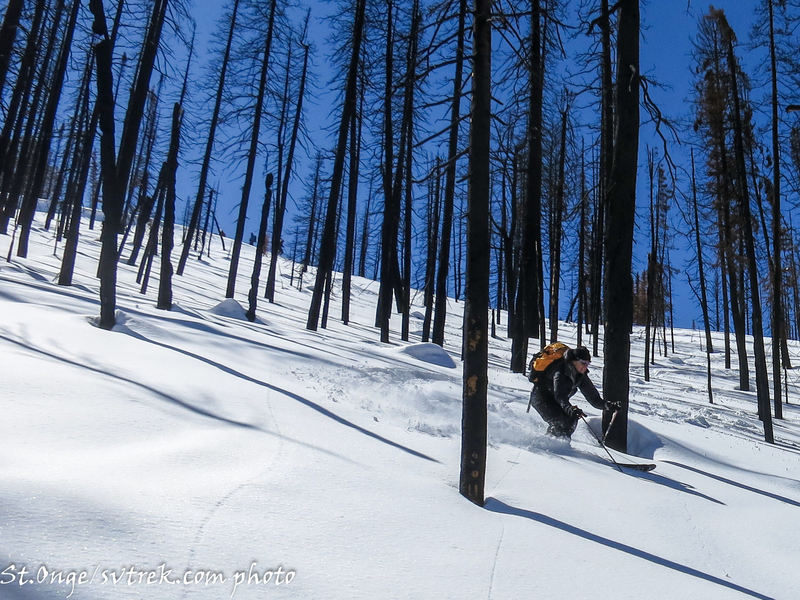 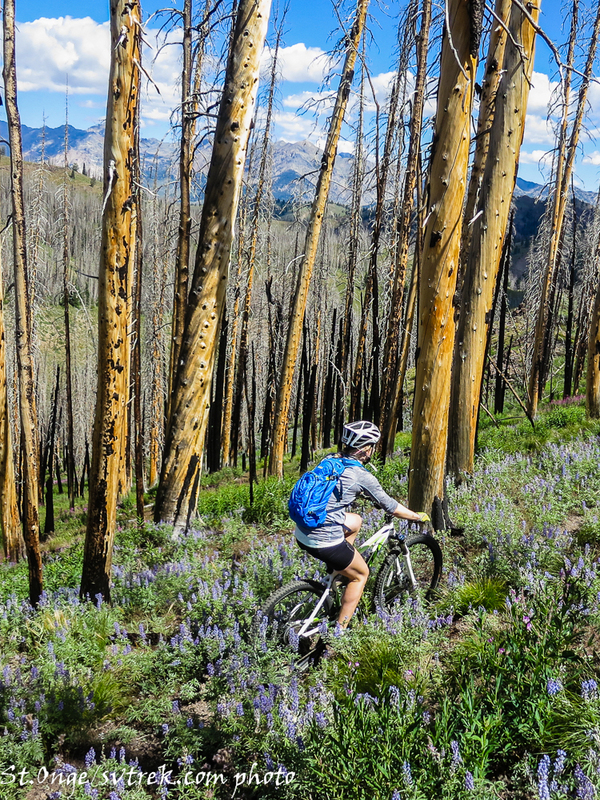 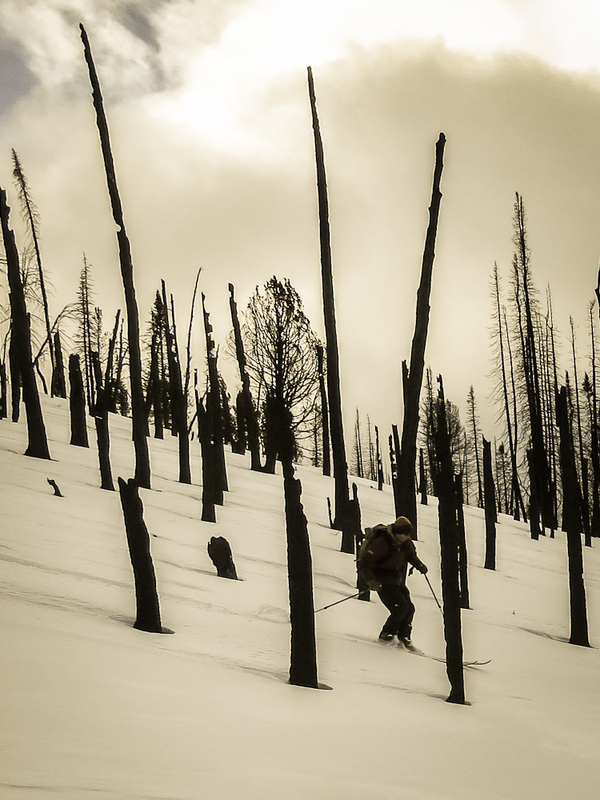 We can rebuild, the skiing will be phenomenal and the burned forest will bloom again soon. 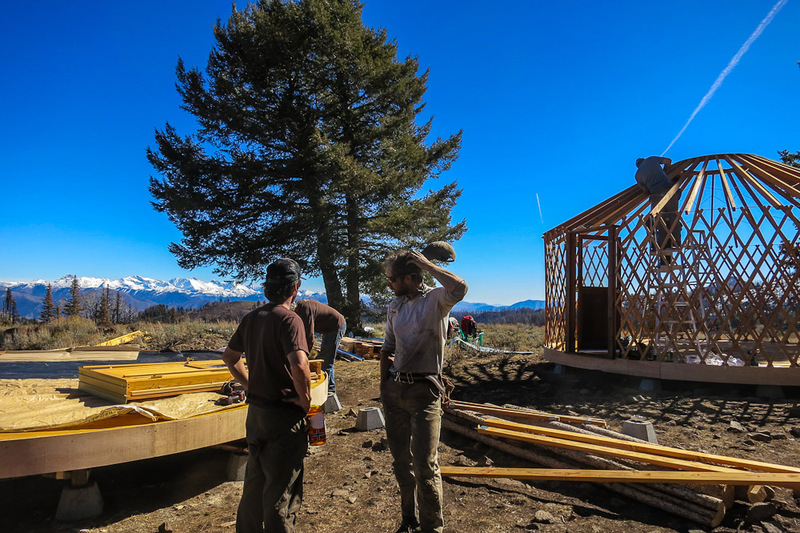 It will just take hard work, some money and time. 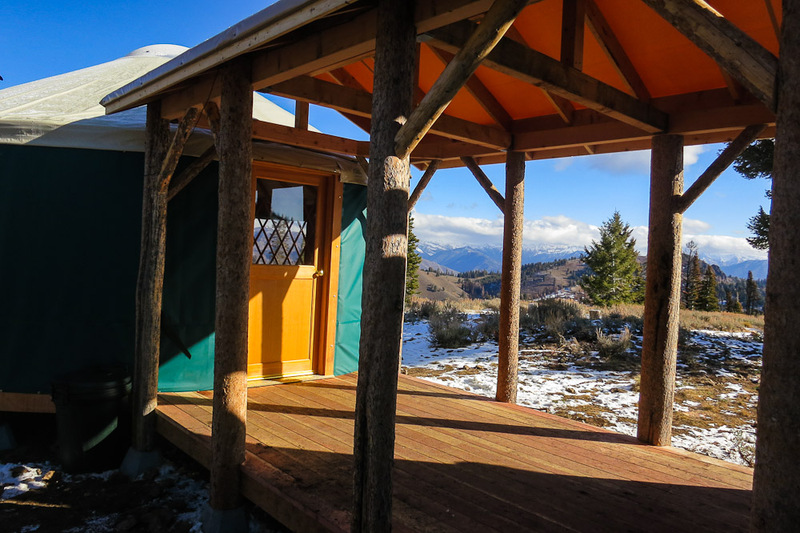 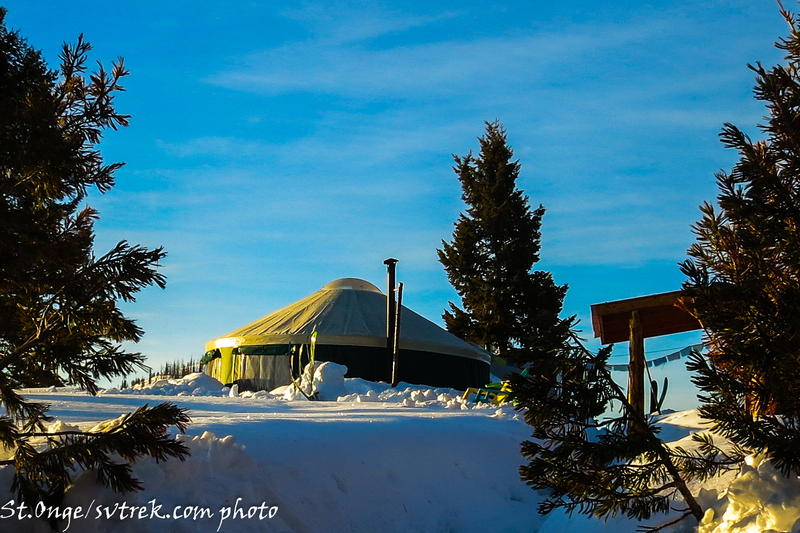 In a two week push and cold snowy weather broken by spectacular blue sky days we built the new Coyote yurts. 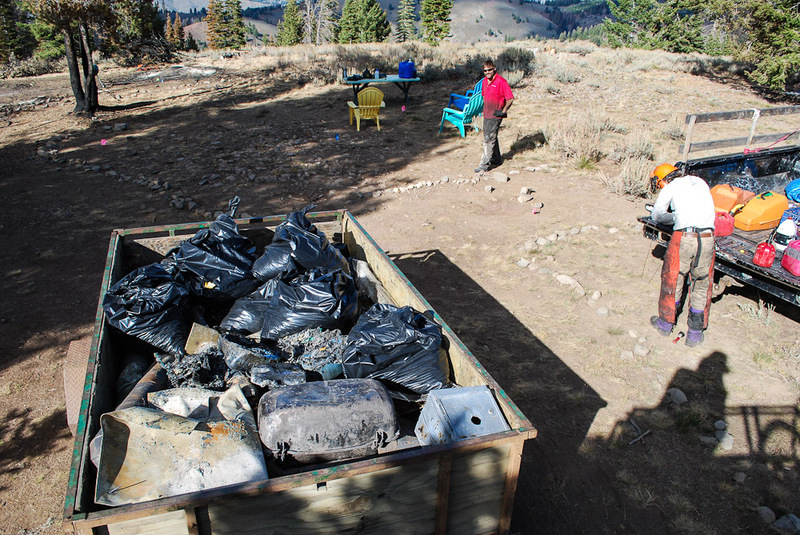 This effort truly took a village to realize, and THANK YOU to all who helped! 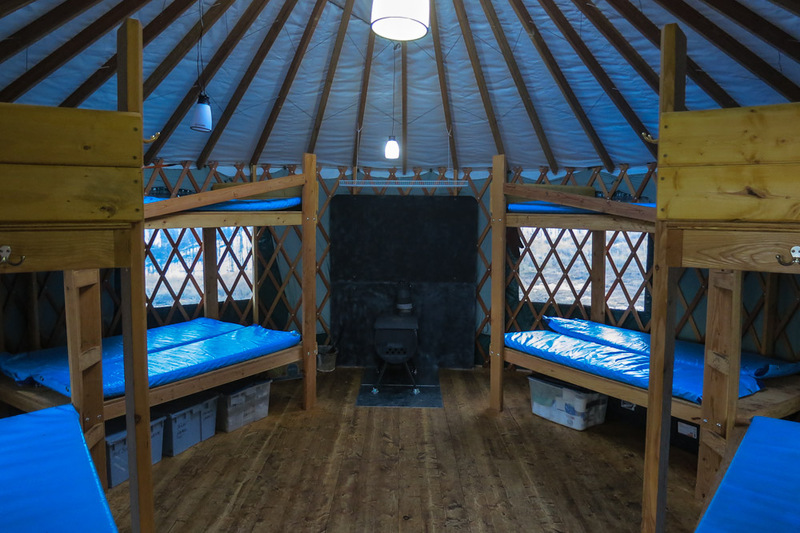 The new Coyote is a unique and beautiful hut and we hope it is enjoyed by many in the years to come! 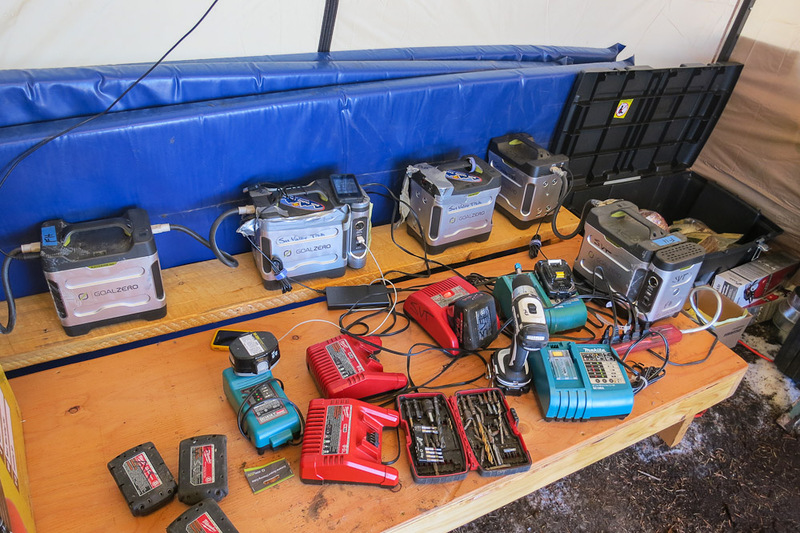 The tools and the power, thanks to Goal Zero! 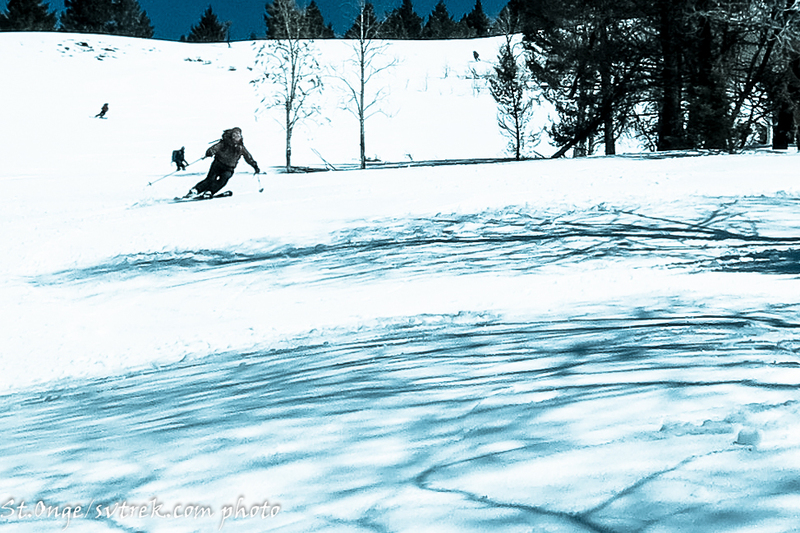 Pato, the man, the duck, the legend. 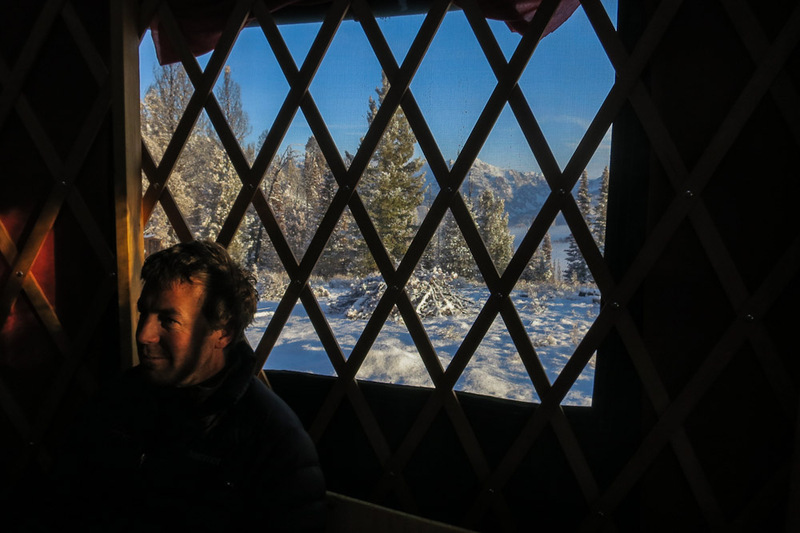 Sean, zen and the art of yurt. 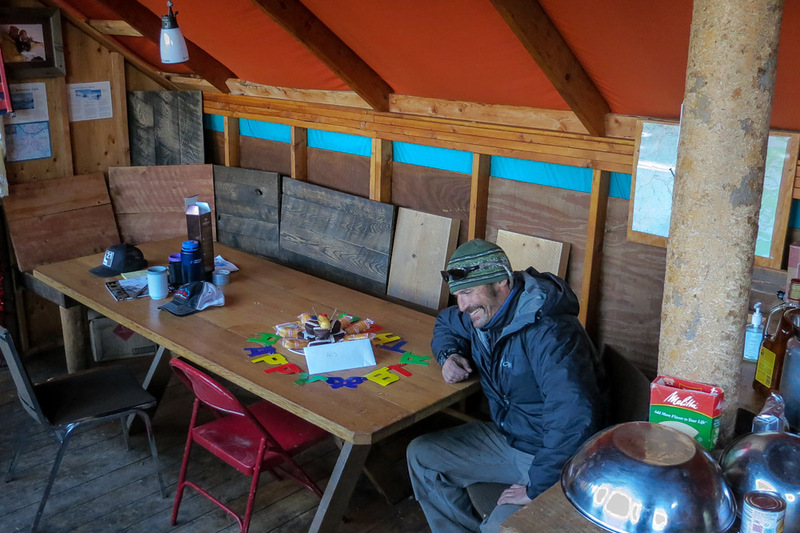 The master enjoying the 1st meal at the beautiful table. 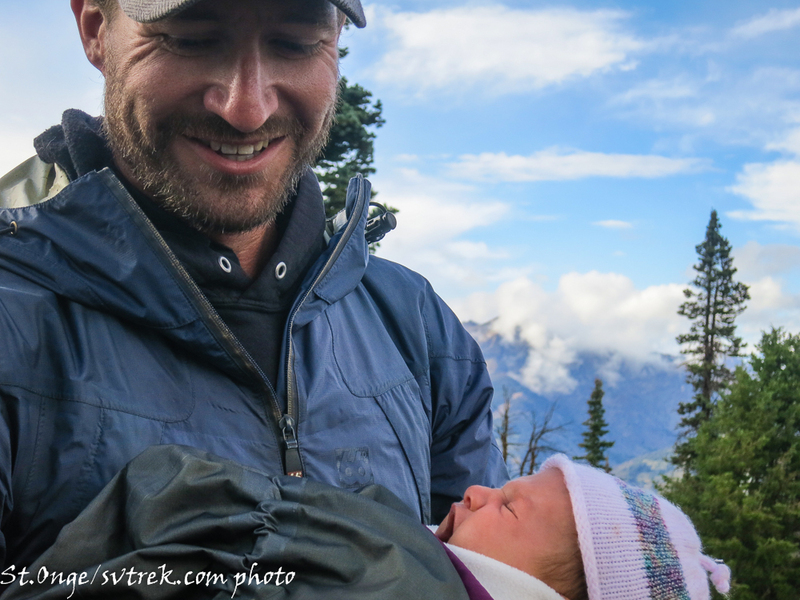 mountain guide, builder, pinch hitter and stud. 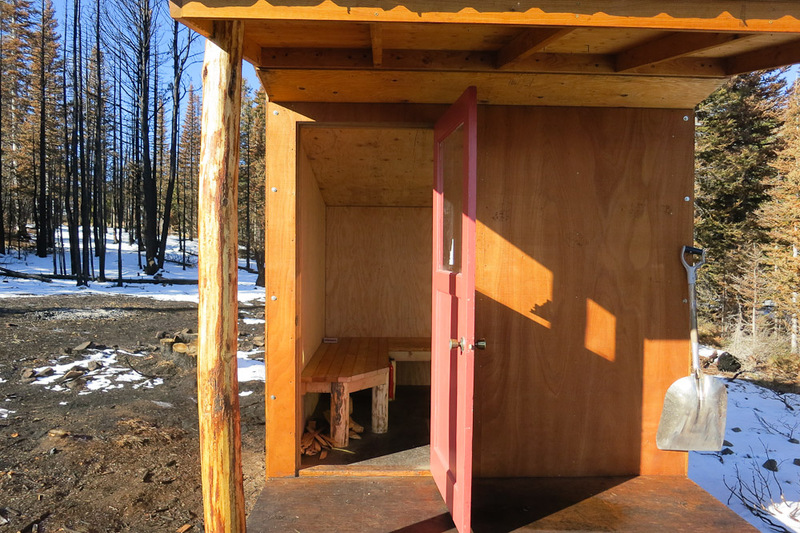 Thank You Bozo for building a beautiful Sauna! 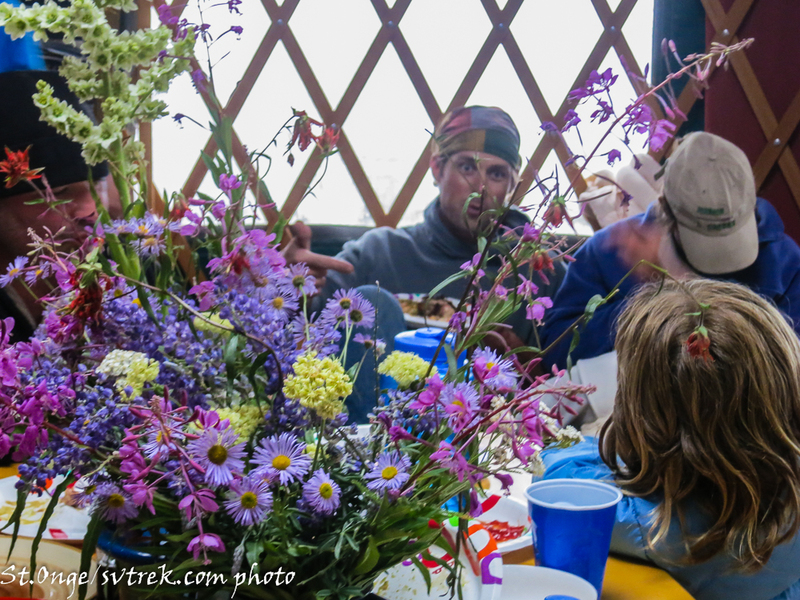 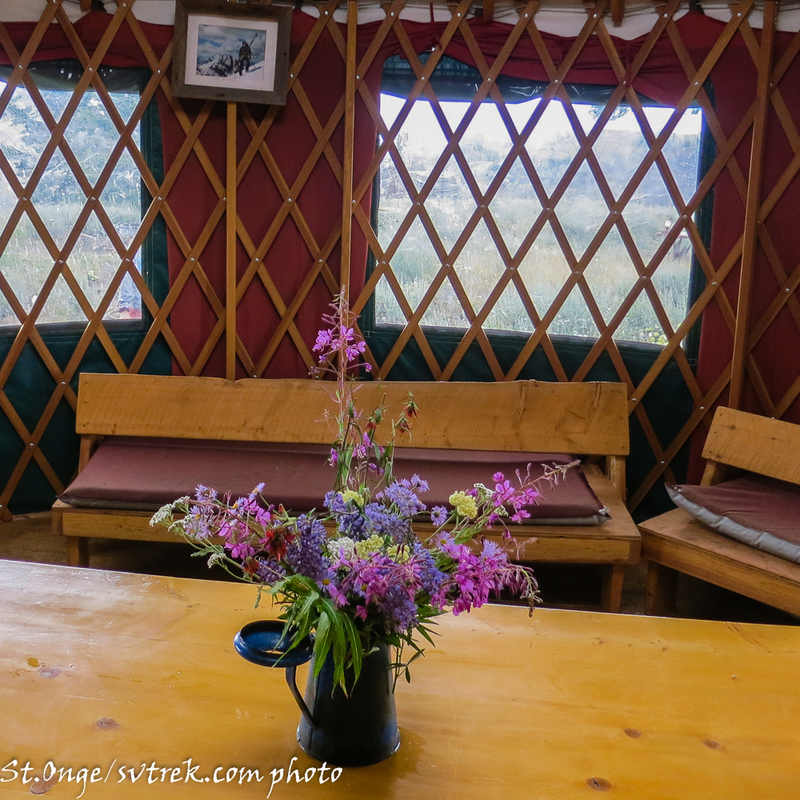 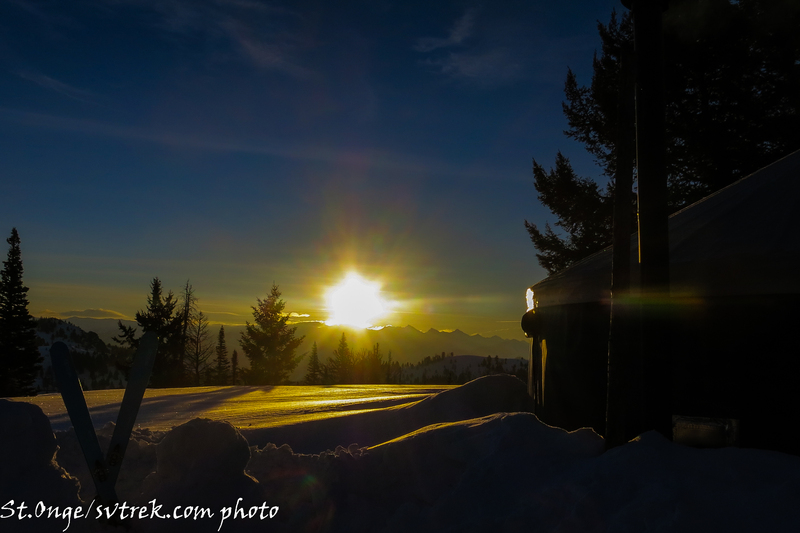 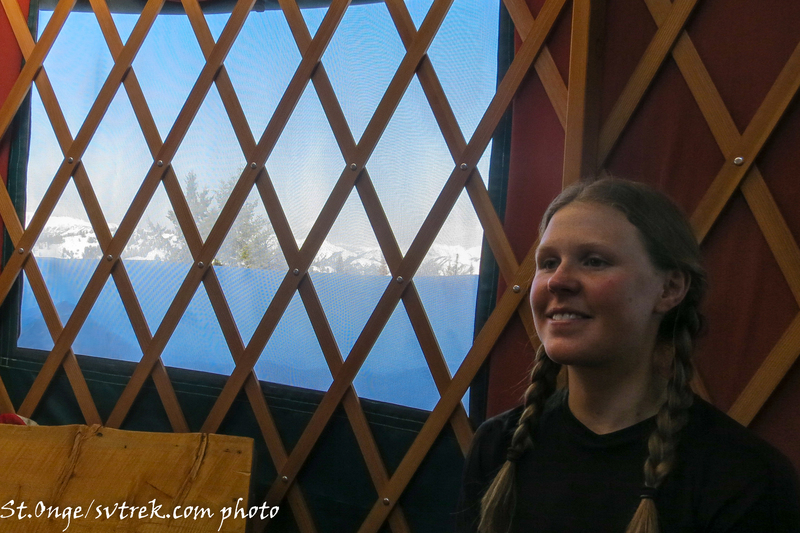 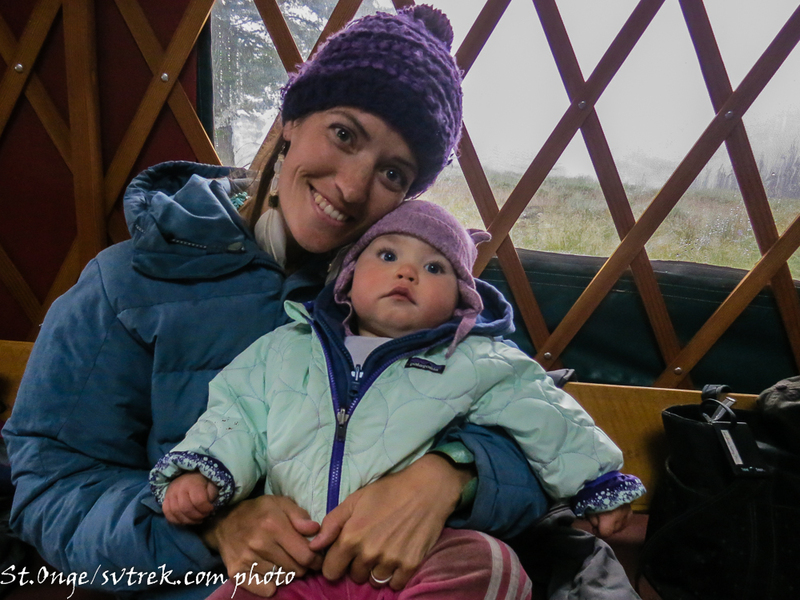 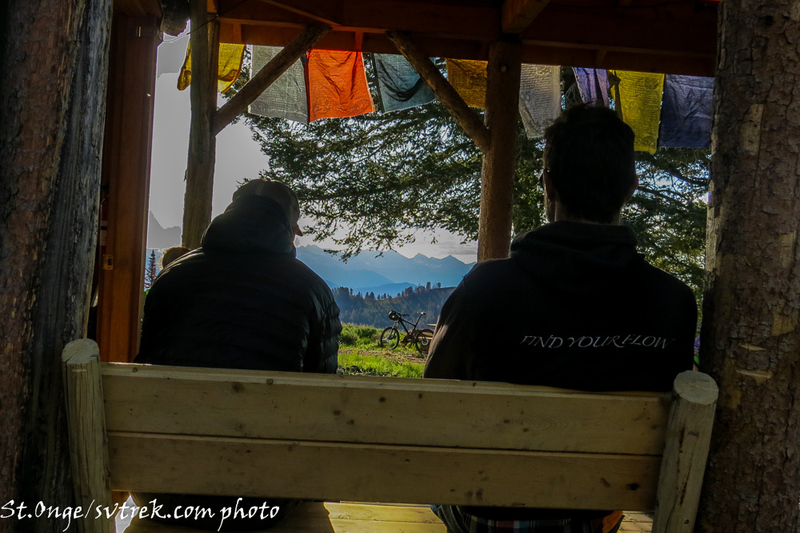 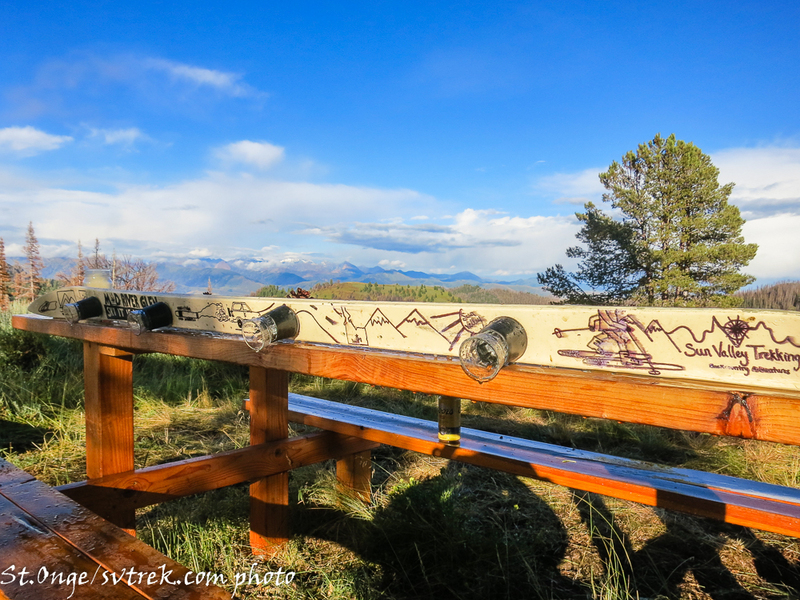 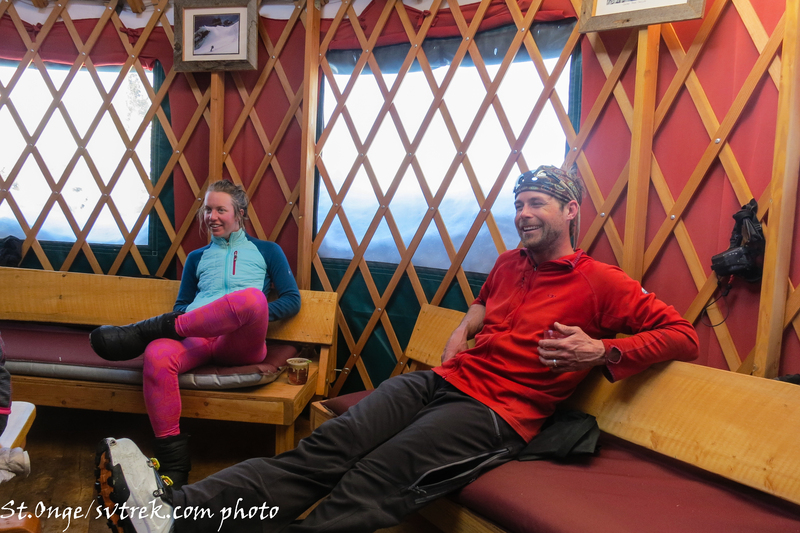 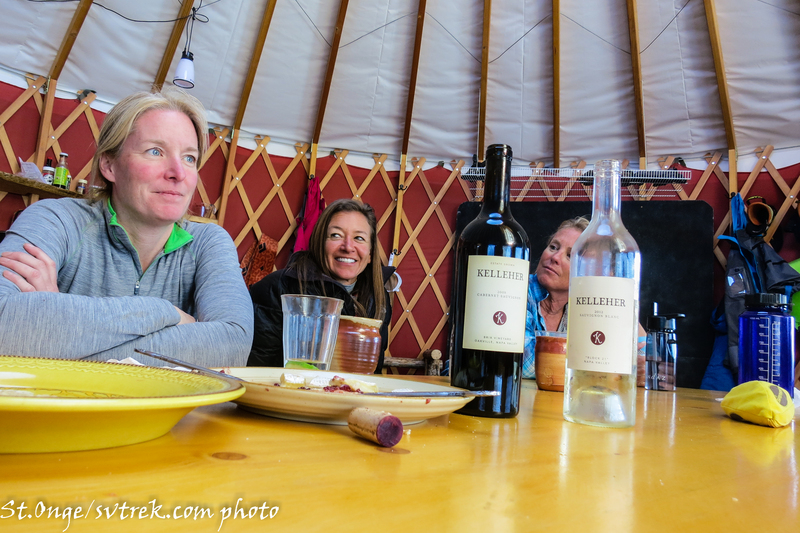 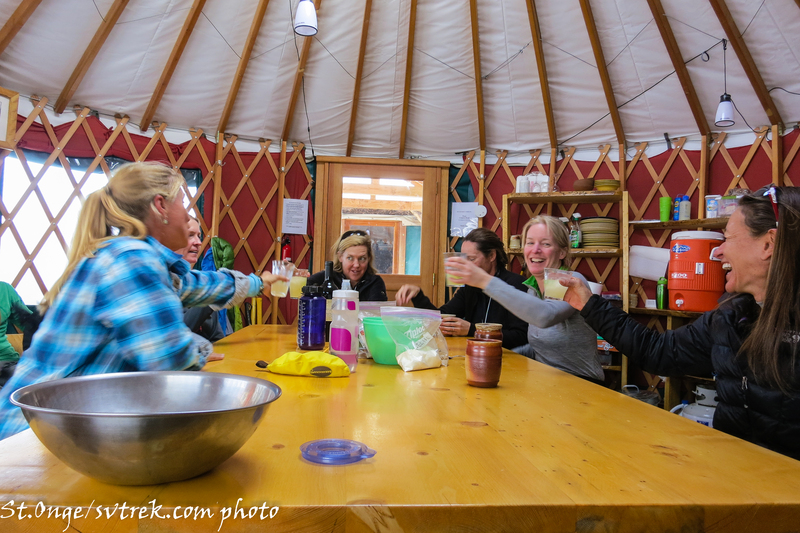 The kitchen yurt is a spectacular place to be, the window views are awesome! 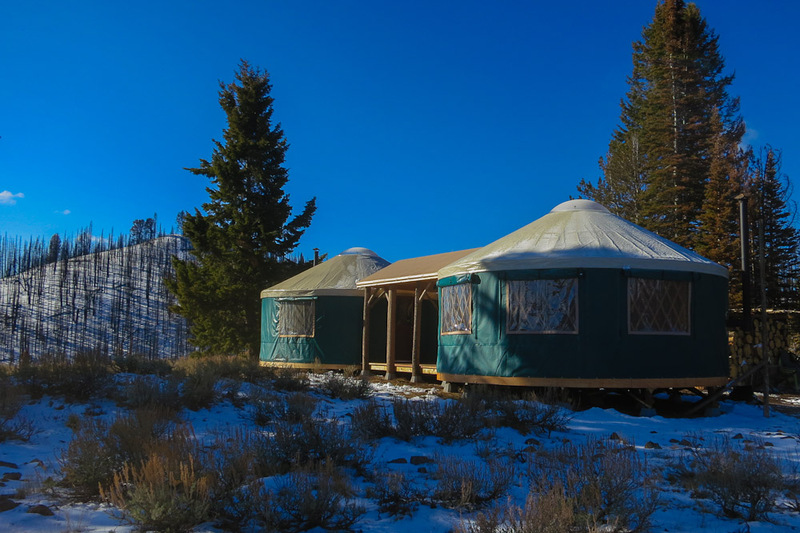 The new sleeping yurt sleeps as many as 16! 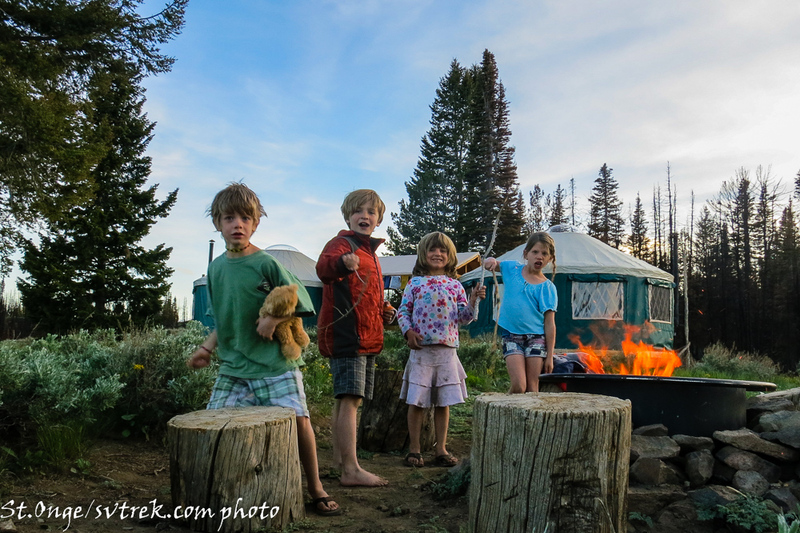 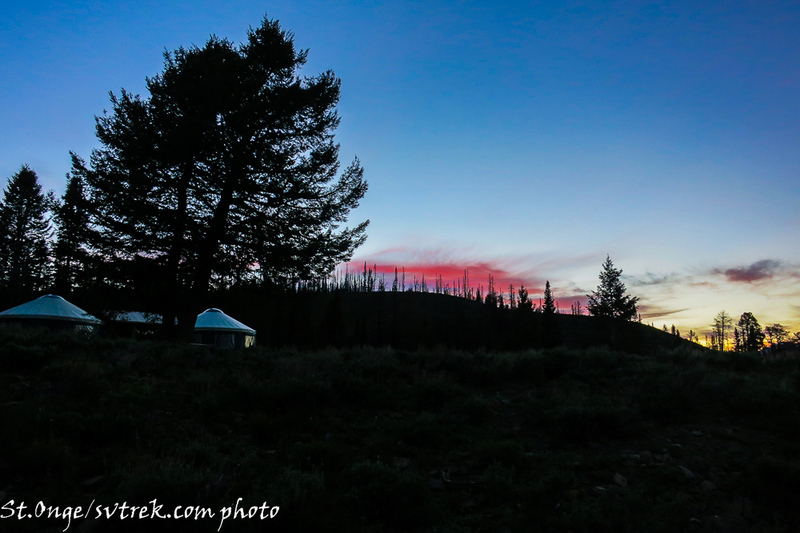 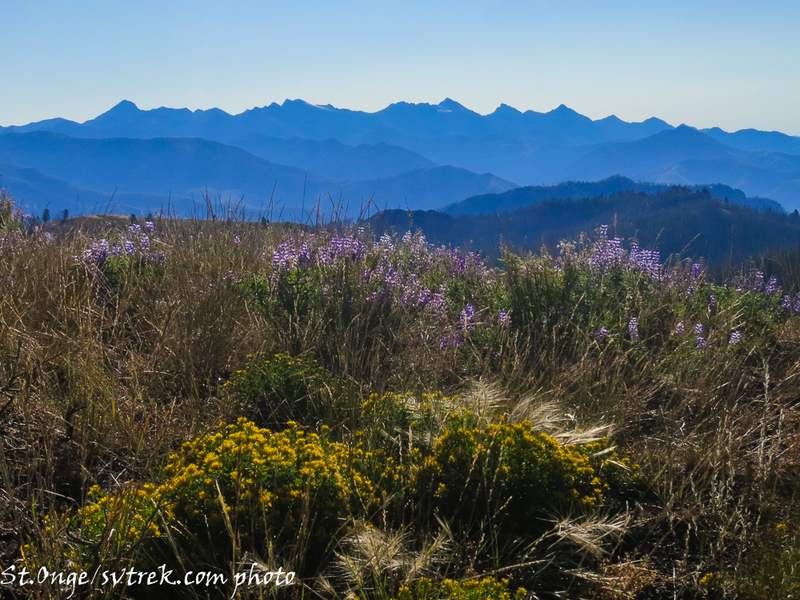 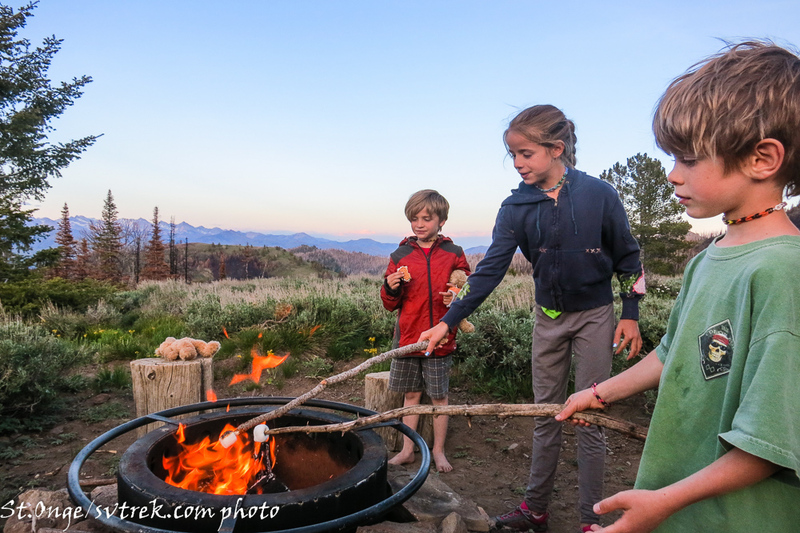 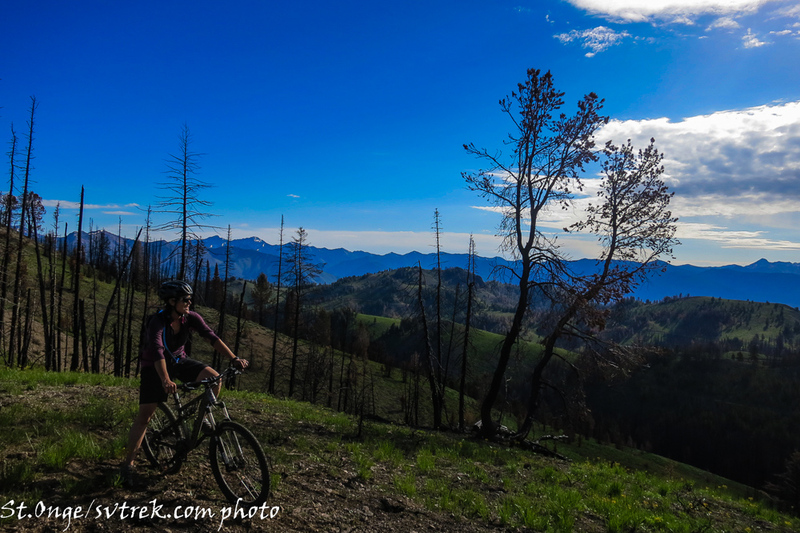 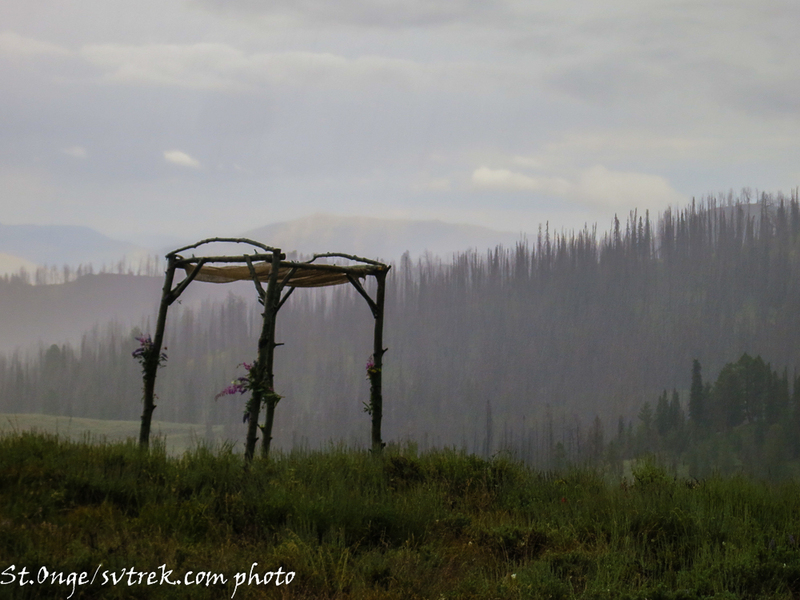 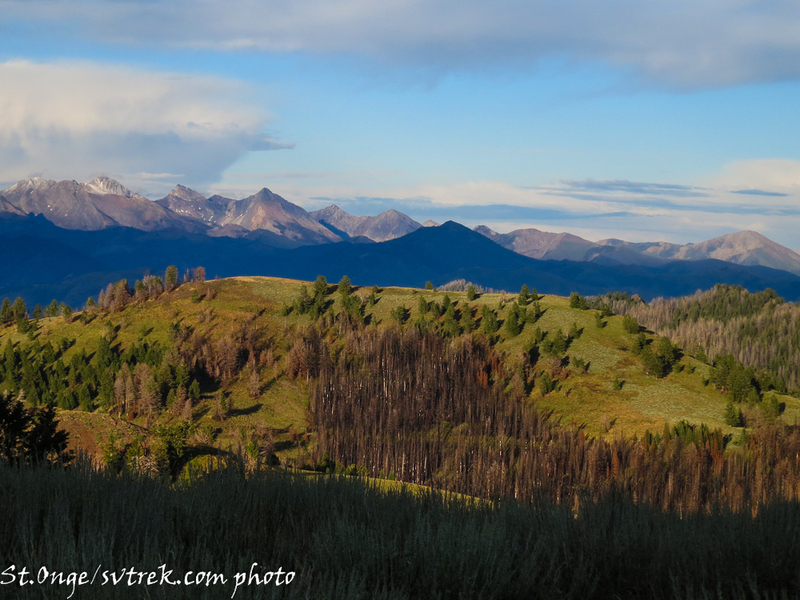 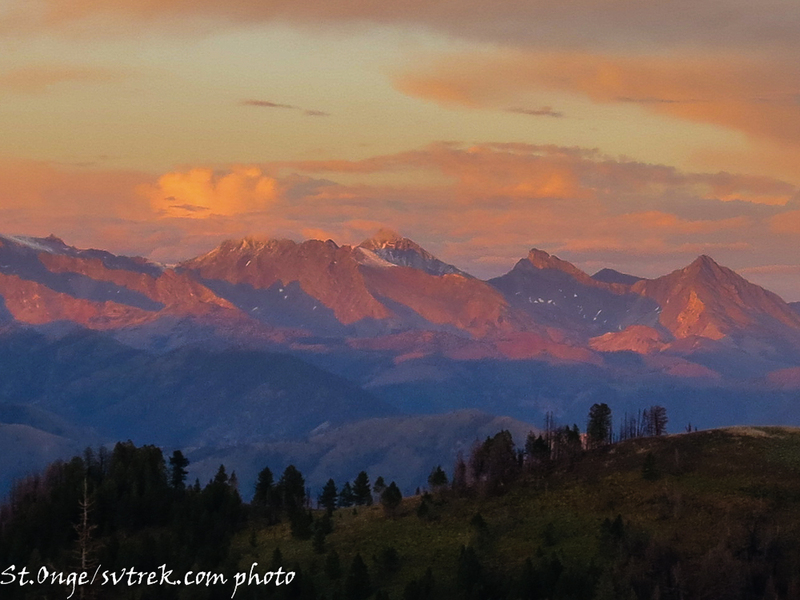 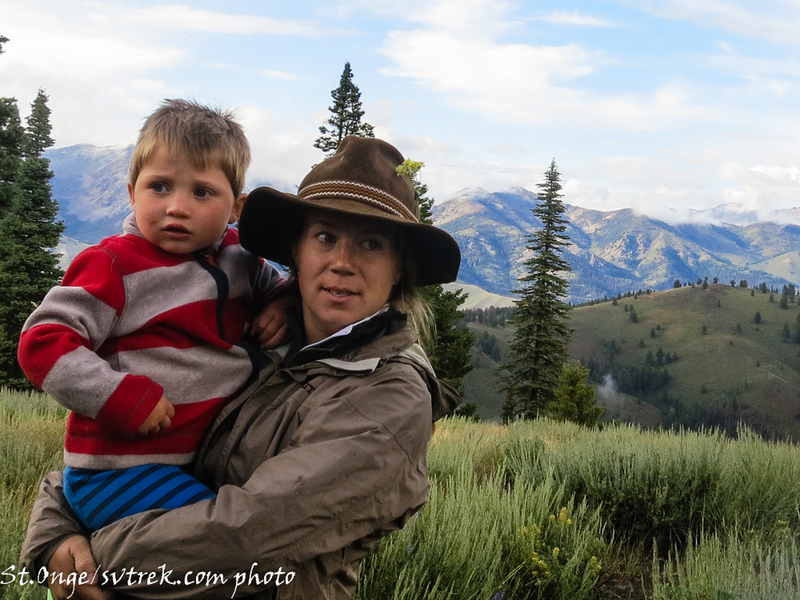 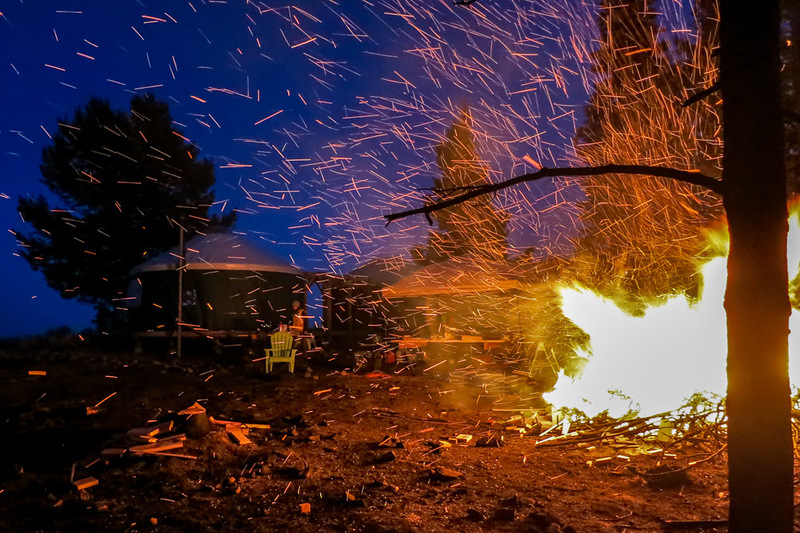 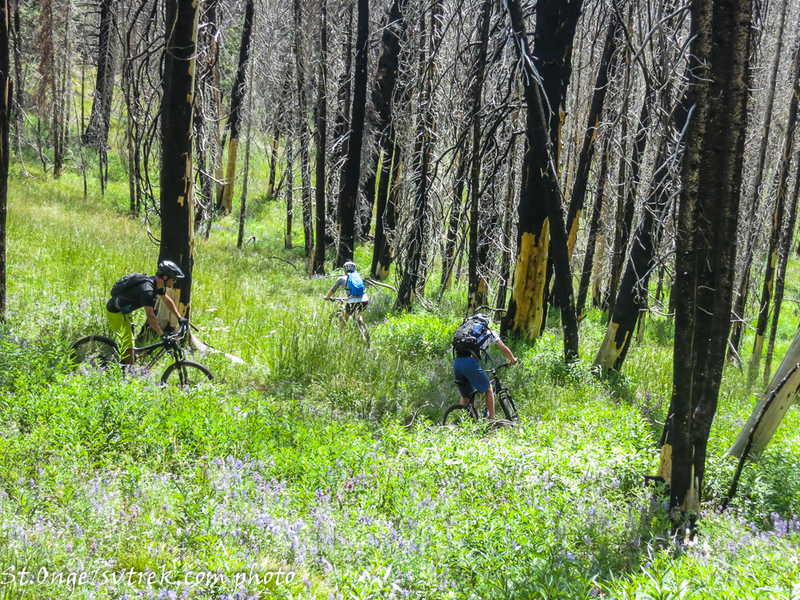 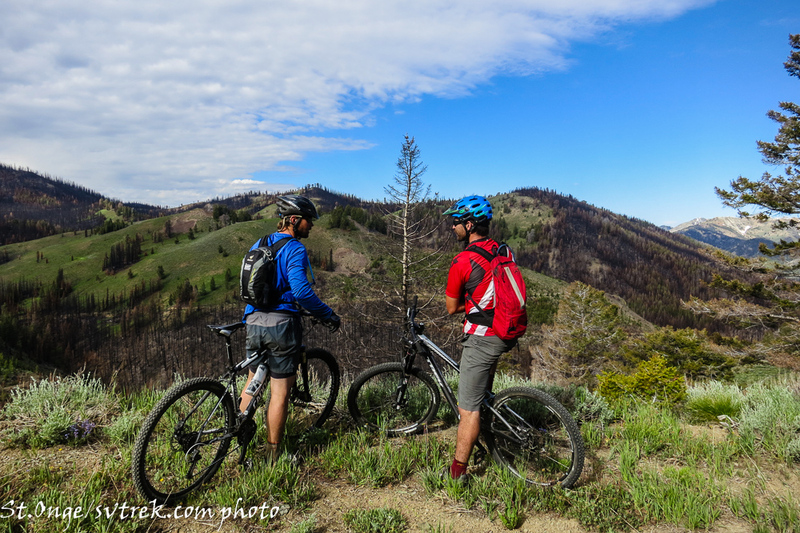 On August 20th, the Beaver Creek wild fire consumed the Coyote Yurts. 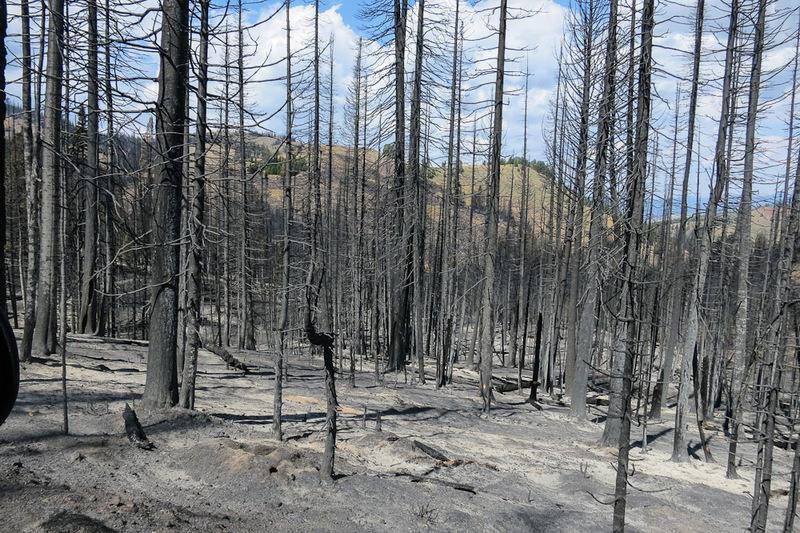 This massive wild fire began as a lightening strike on August 7th in a remote drainage on the south west corner of the Smokey Mountains. 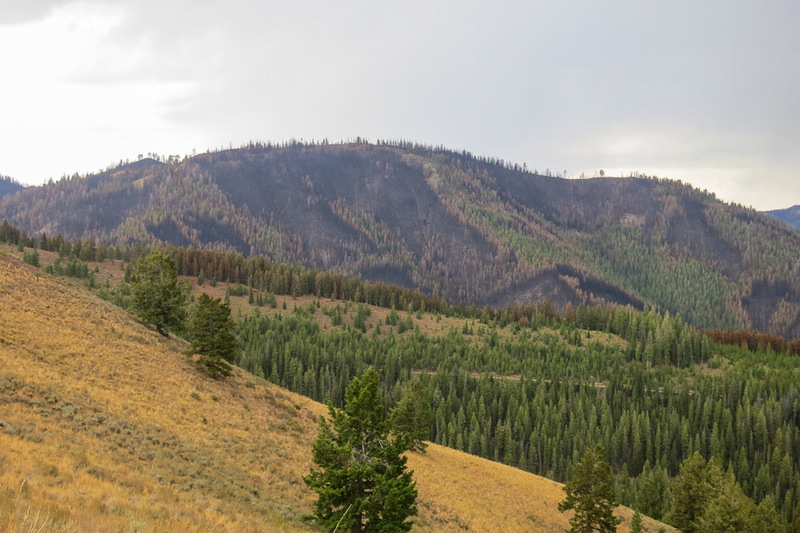 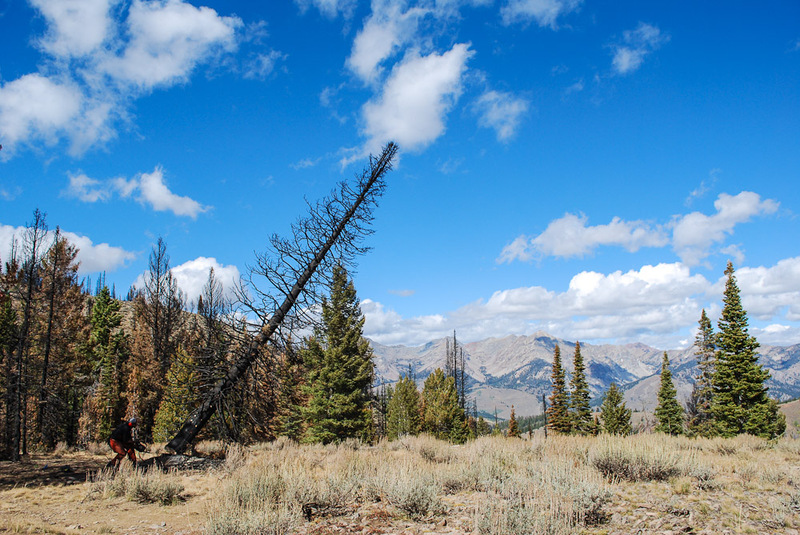 Over a period of a couple weeks, the Beaver Creek Fire grew and spread to cover over 100,000 acres and directly threatened the town of Hailey on the southern boundary and burned much of Baker Creek on it’s northern edge. 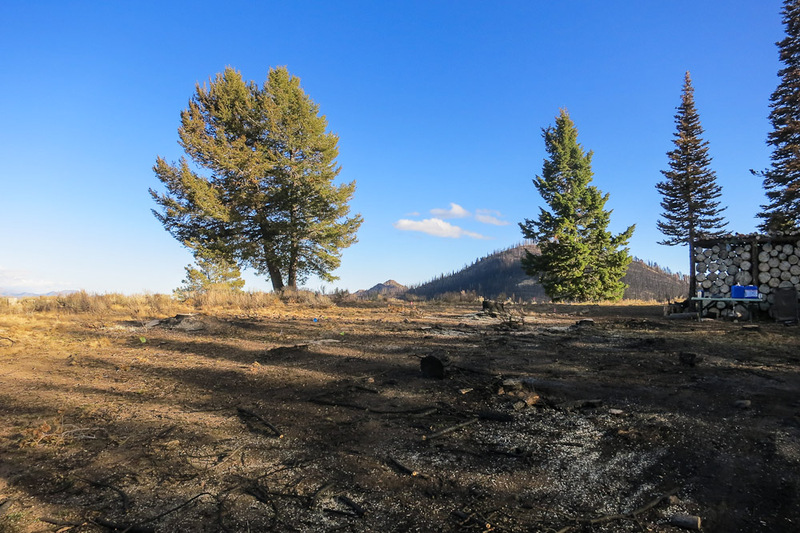 The fire basically ringed the outer boundary of the Castle Rock Fire of 2007. 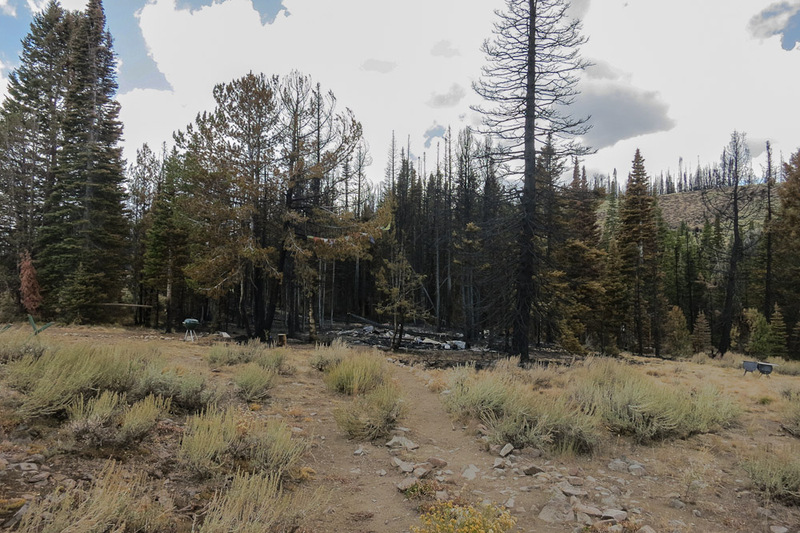 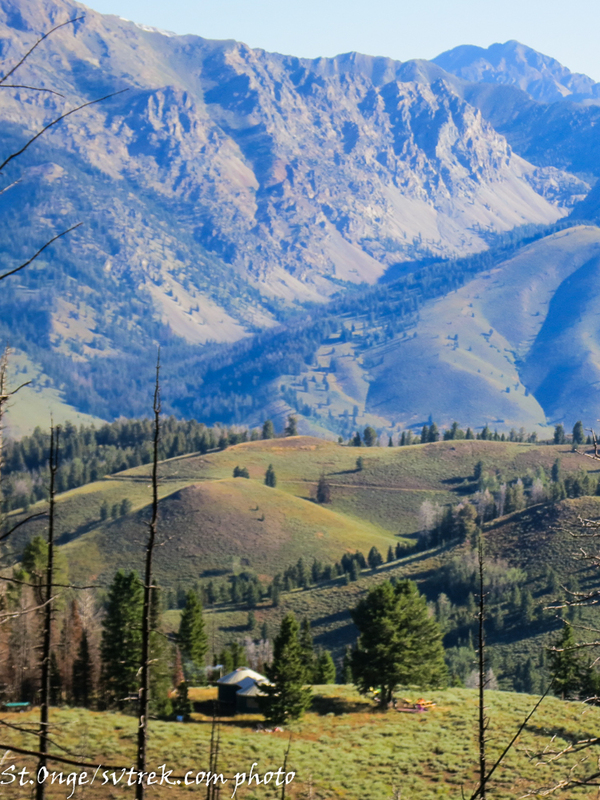 When the fire spread into the East Fork of Baker Creek there was a valiant fire fighting effort to protect both Coyote and Tornak Huts, but despite these efforts Coyote Yurts were completely destroyed. 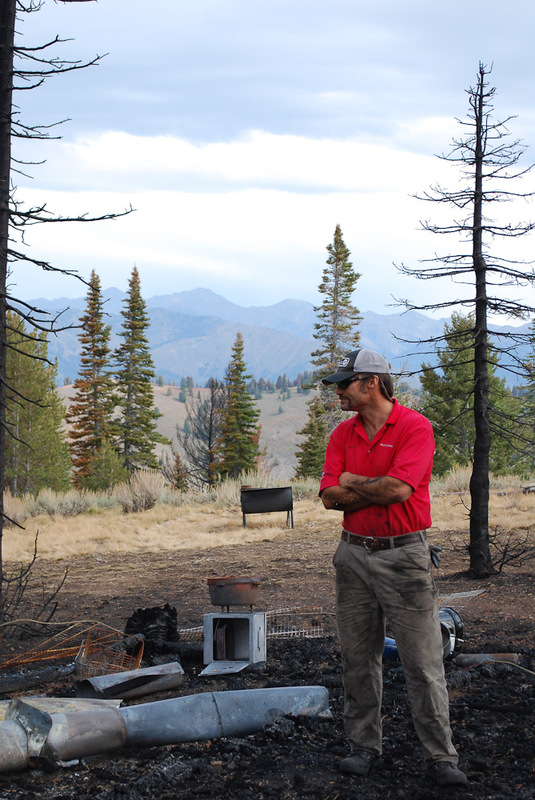 While the fire came relatively close to Tornak Hut, this beloved hut was fortunately spared. 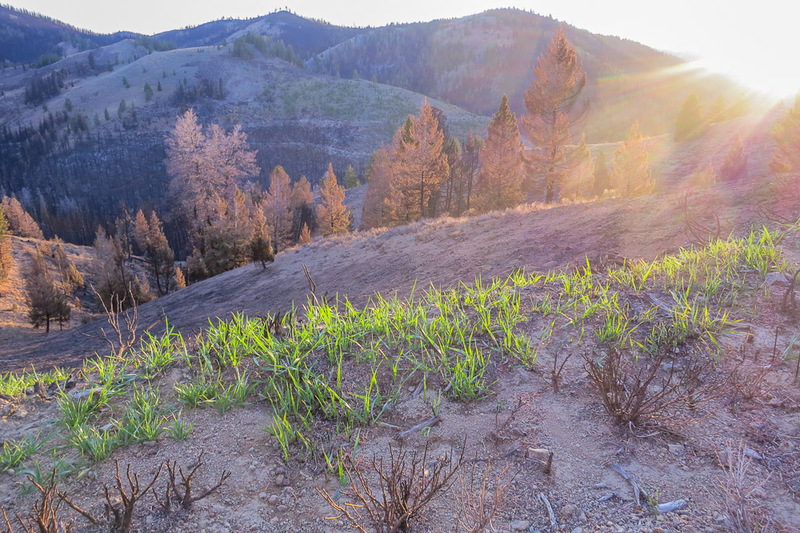 In fact, much of the area around Tornak show no sign of fire and is generally as beautiful as it always is. 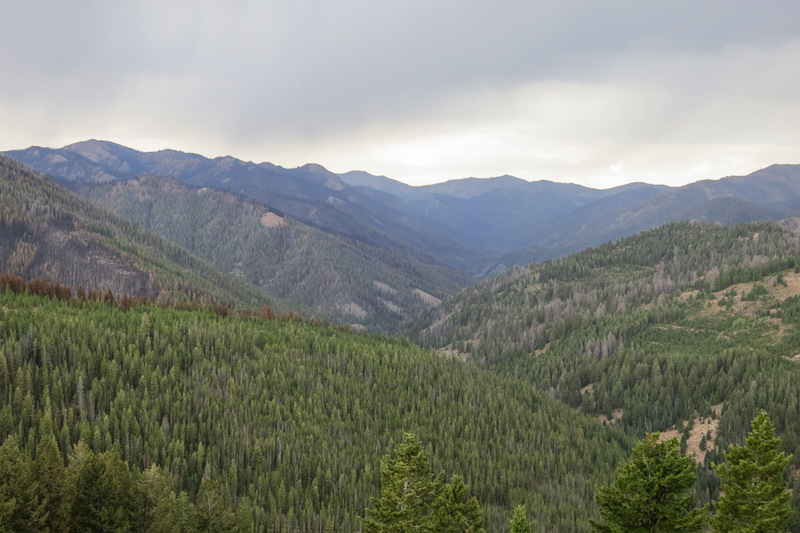 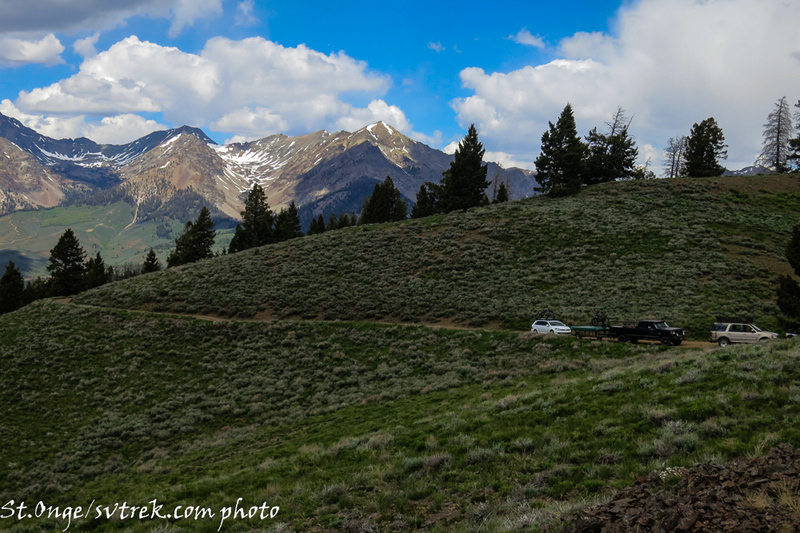 Passing Tornak and entering the top of the East Fork drainage, there is significant signs of fire and much of the north facing timber in this drainage burned hot. 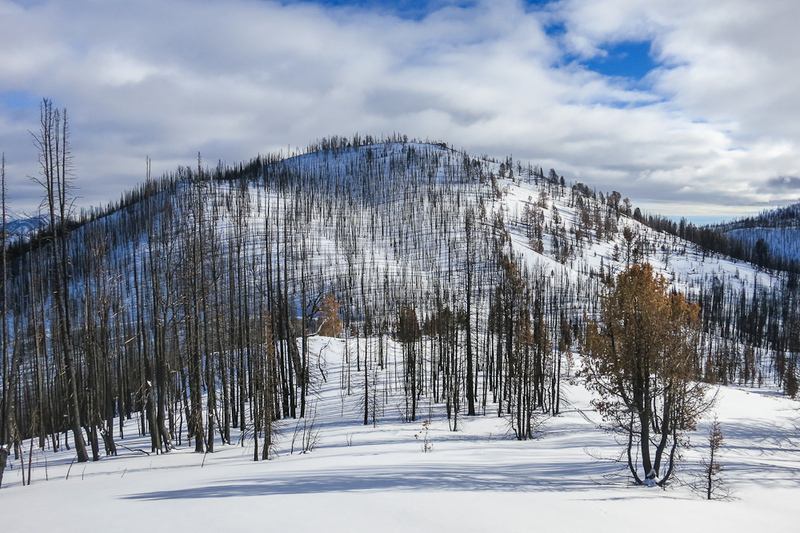 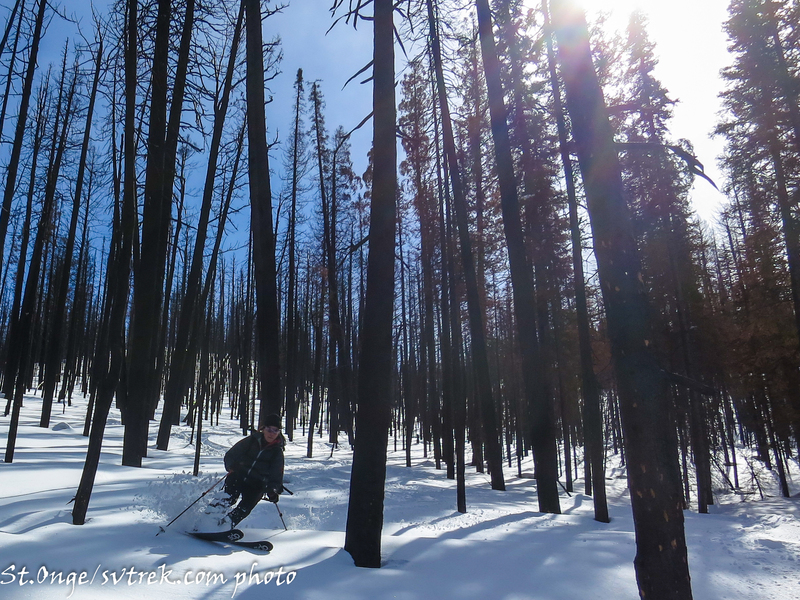 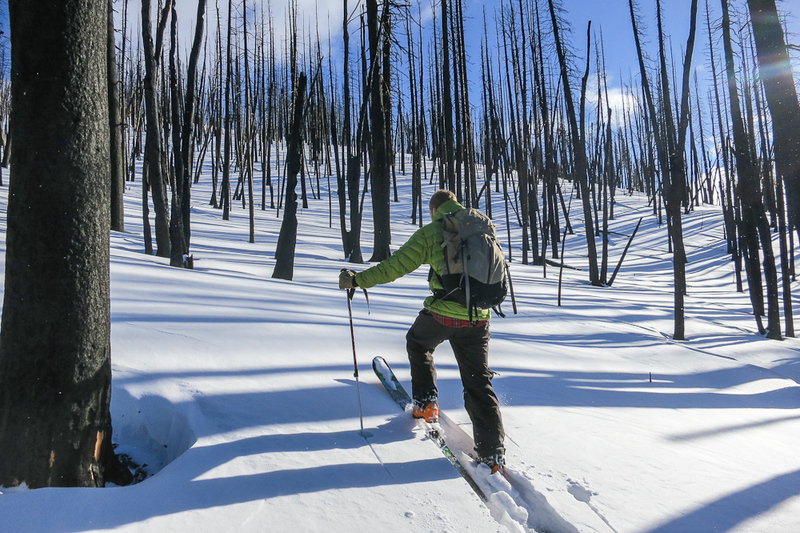 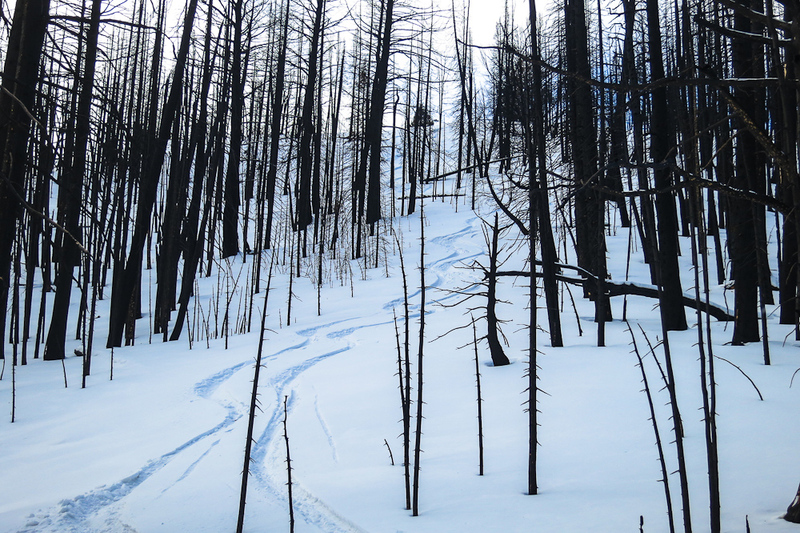 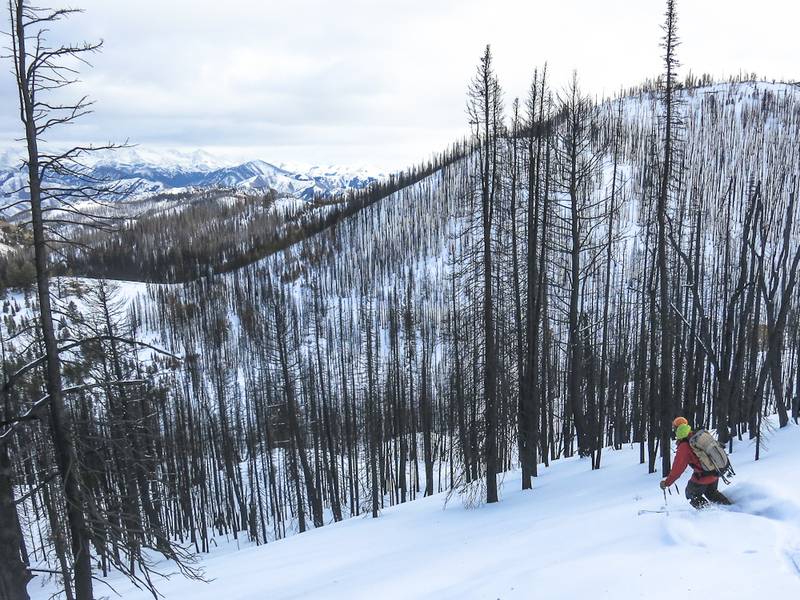 The good news is that these burned timber slopes have opened up some amazing new ski lines, some of which are long (1500’+), due north and fall line. 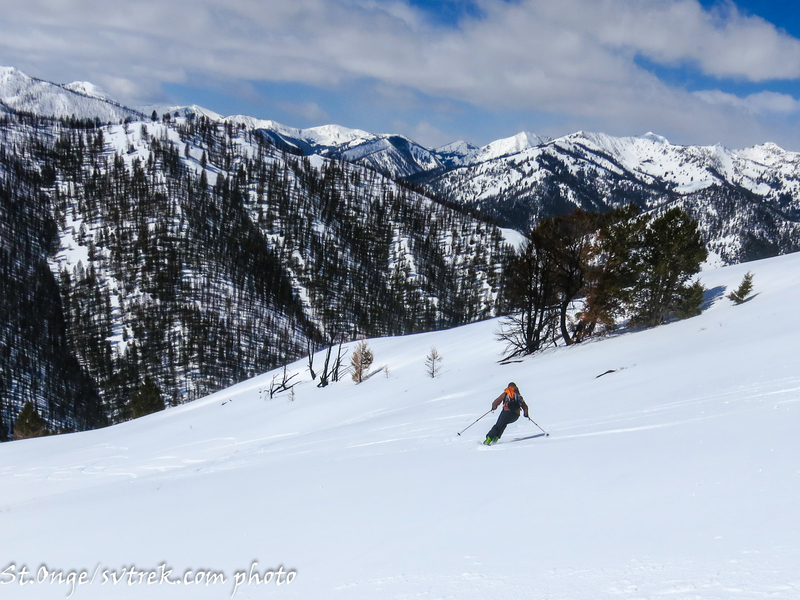 For those planning on skiing here this winter, start thinking of run names, because we will have a lot of great new lines to ski and name! 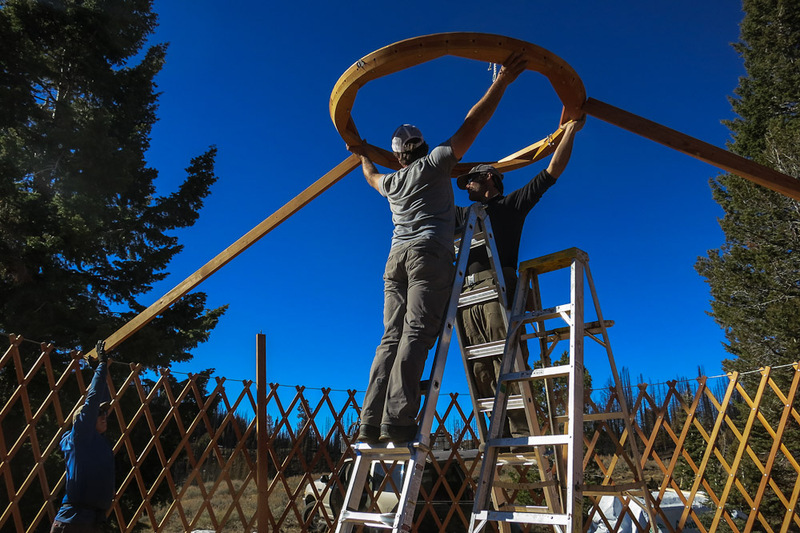 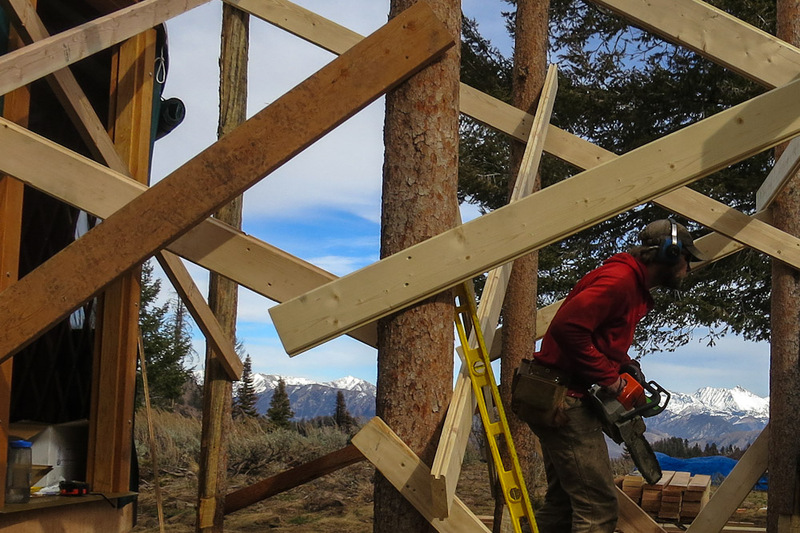 We are rebuilding the Coyote Yurts! 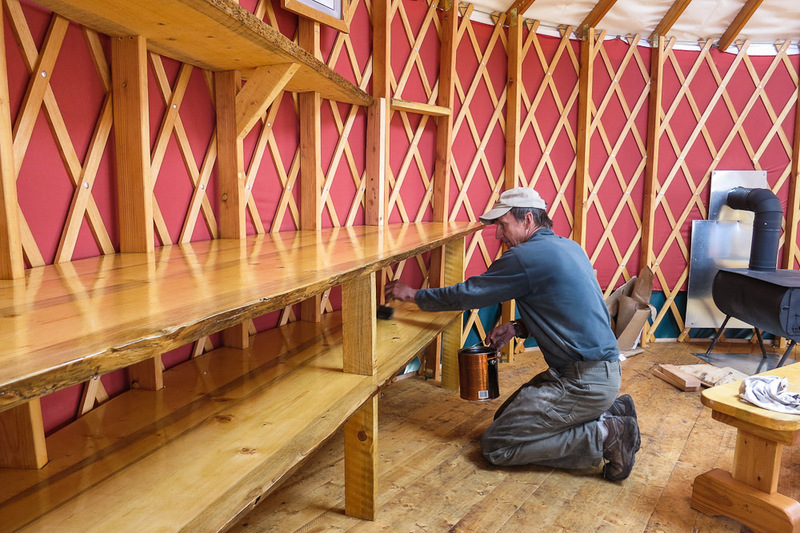 We have been working non-stop since we got news of the loss of the yurts to plan, gather materials and start the rebuild. 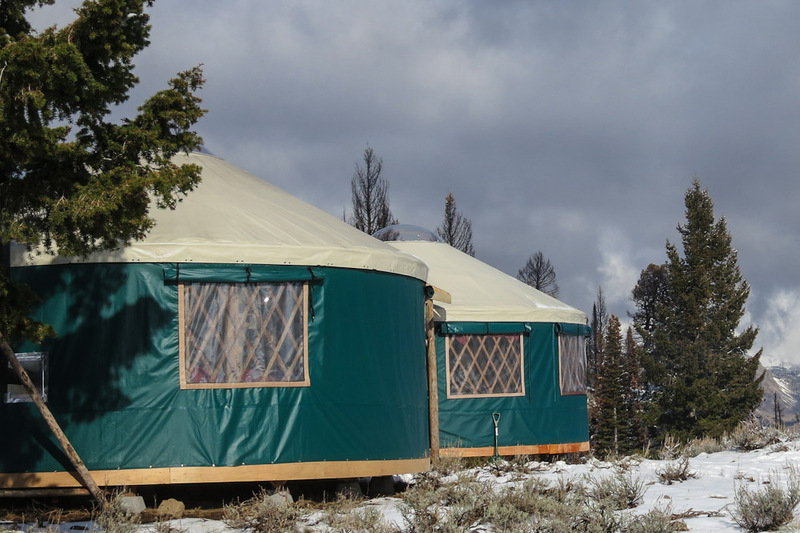 Our goal is to have the new yurts up and ready for the 1st winter snows. 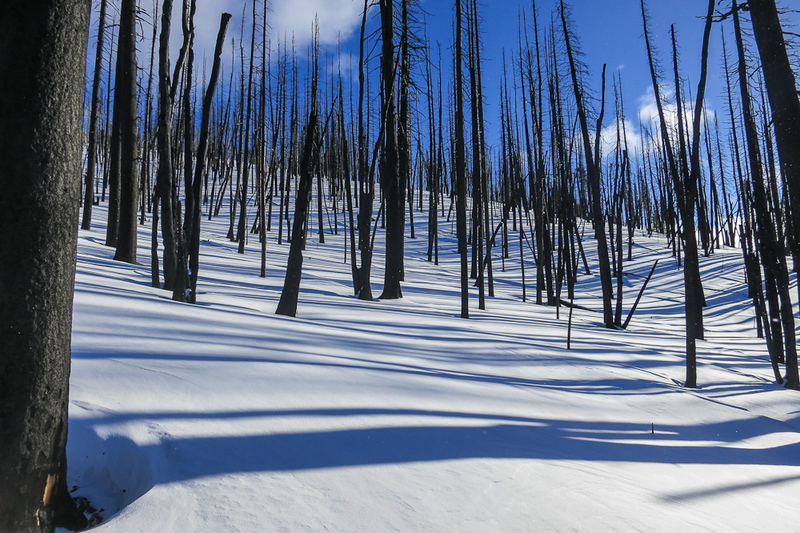 Typically, these snow can begin in late October in this zone, so we have limited time to do a lot of work. 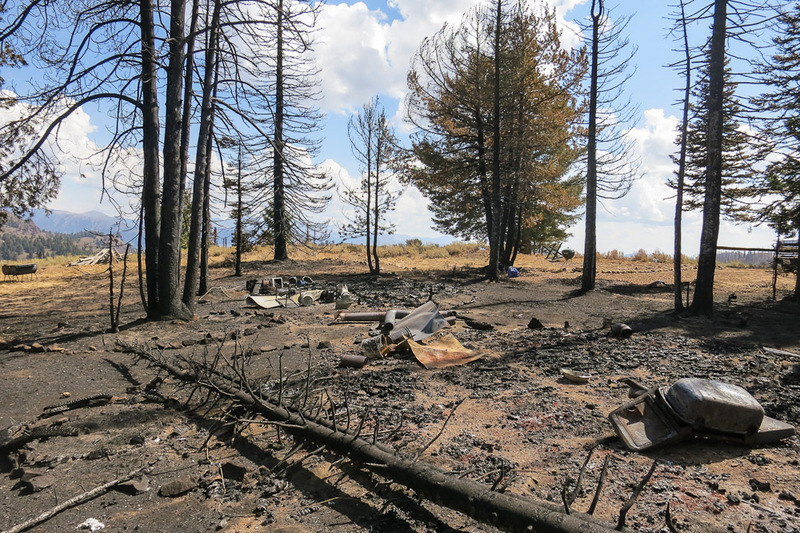 We have already been on site to clean up the burned debris, take away dangerous trees and recut the 5 cords of winter fire wood (and build a new wood shed). 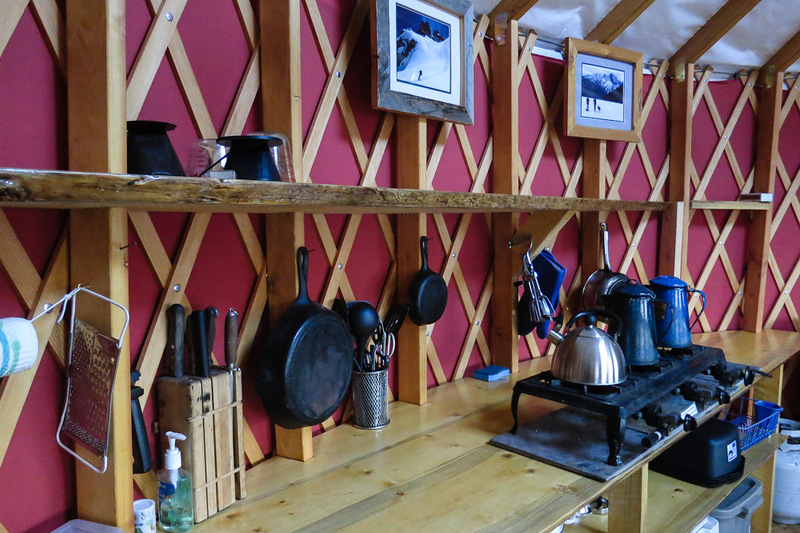 We have built beautiful new bunks, couches and are working on a custom kitchen and large dining table made of rough sawn pine boards. 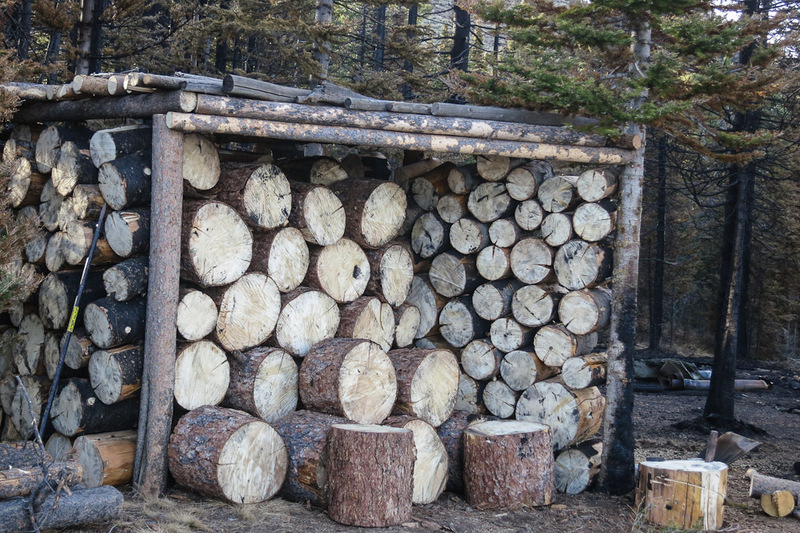 We will build a sauna in town and transport it on site. 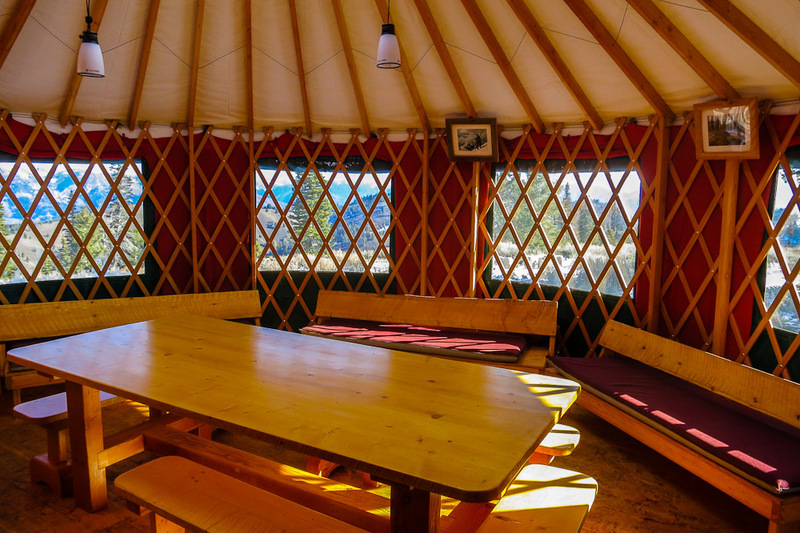 We have received one slightly used Yurt and have another new one arriving next week. 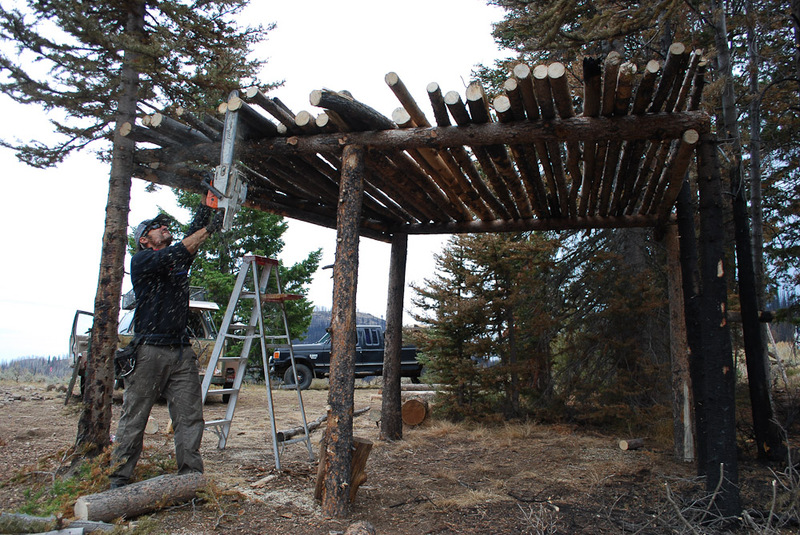 We will be building the decks and yurts the 1st couple weeks of October on site. 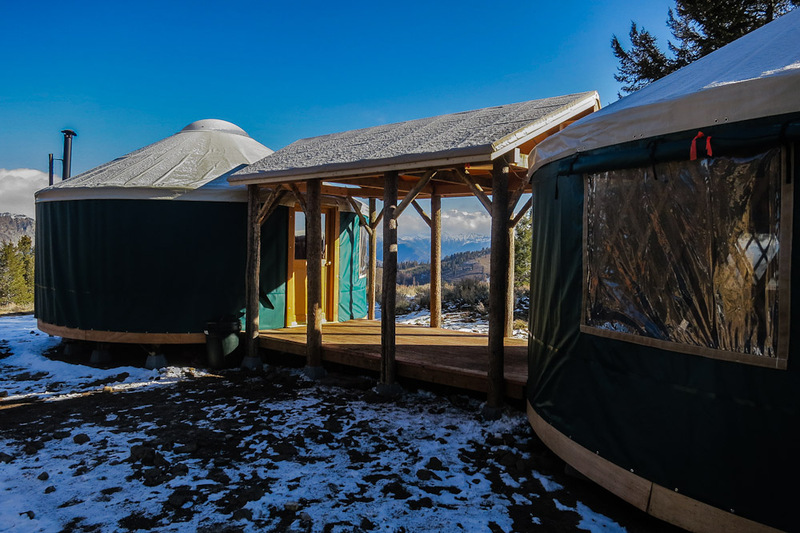 The end result should be a beautiful array of two yurts connected by a covered deck. 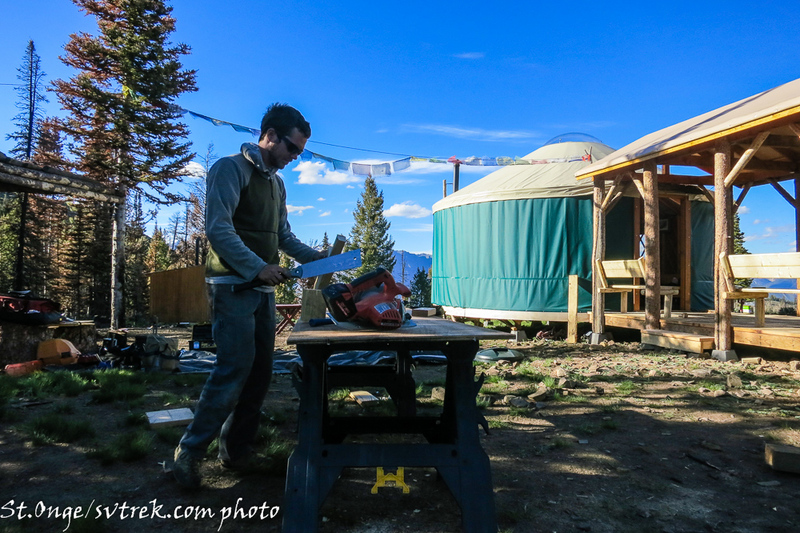 We are moving the yurt site a little bit to get it off of the burned ground and let it come back. 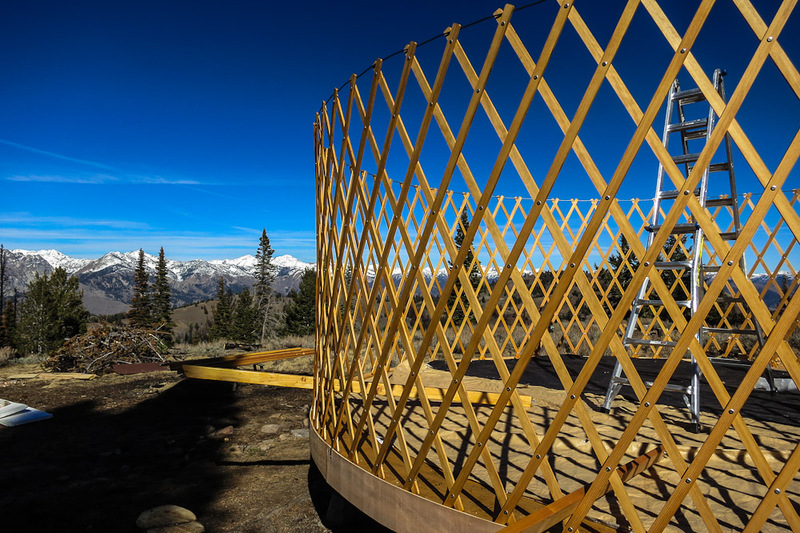 The views will be stunning from the new yurts and the area in front of the yurts and on the point is unaffected by the fire and is as phenomenally beautiful as it always was. 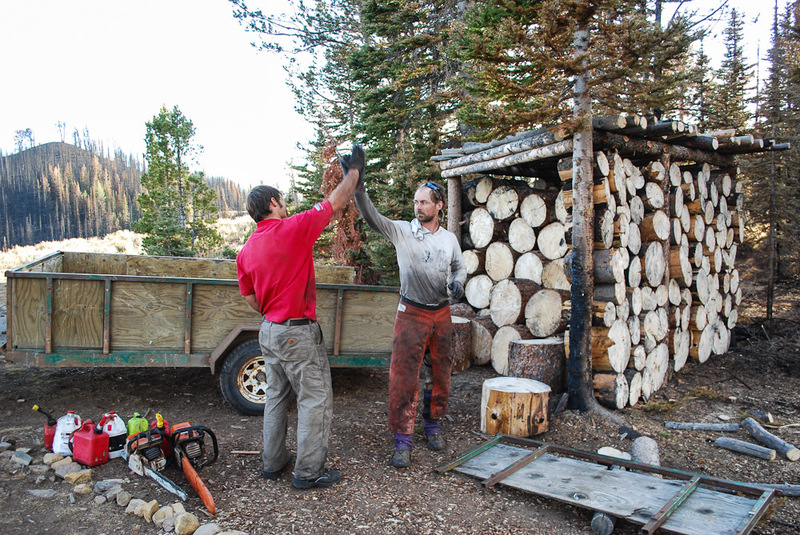 This is a fairly monumental effort that we are engaged in. 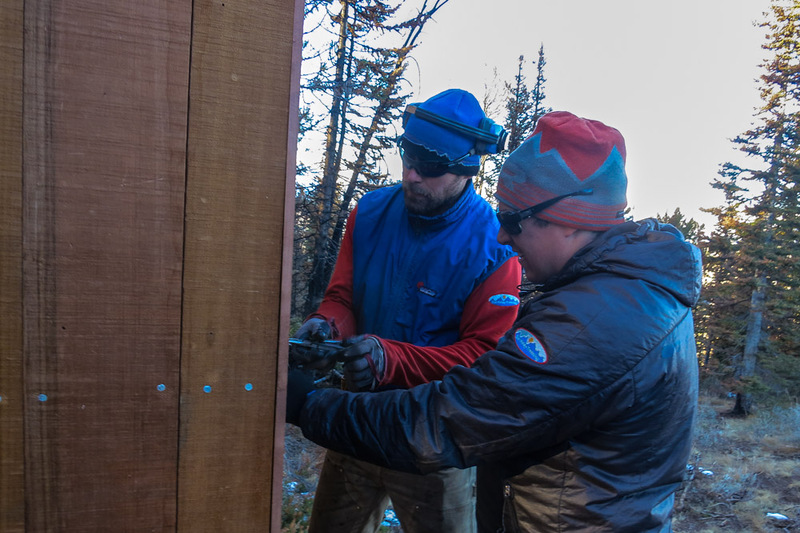 We are dedicated to have this well-loved hut back in the hands of the backcountry community for this upcoming winter and future years. 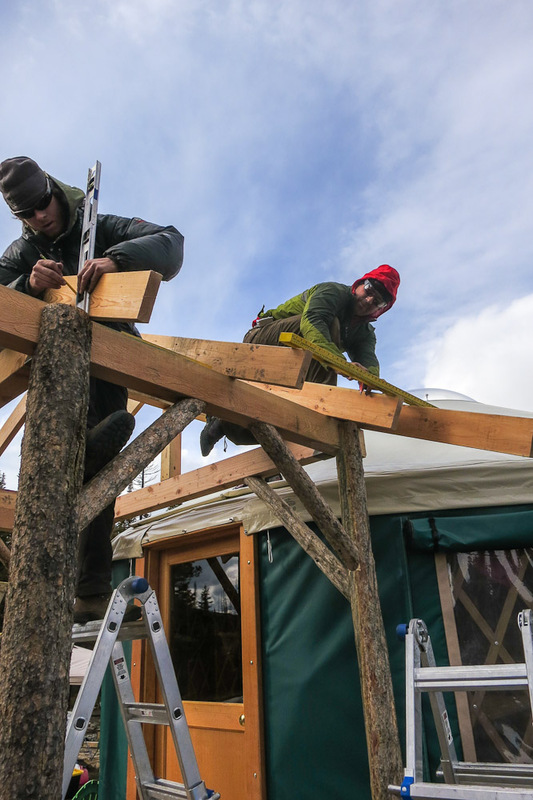 But we could use some help! 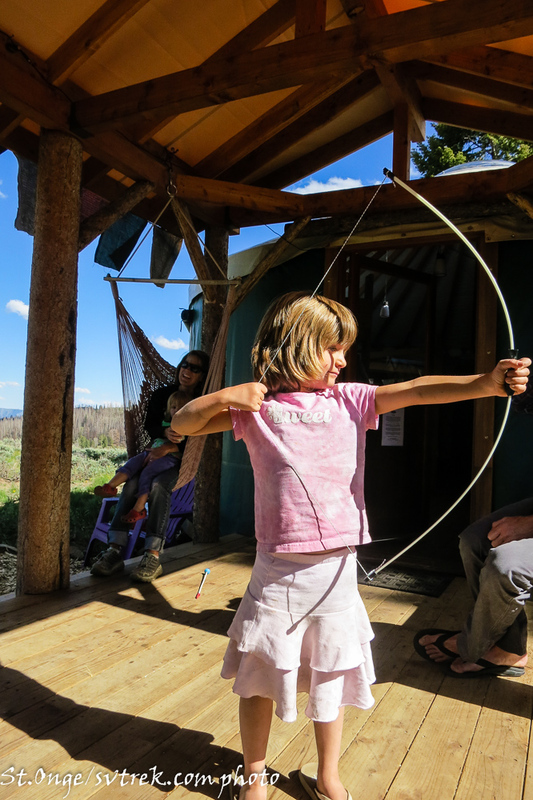 We have set up an “Indiegogo Campaign” to facilitate those that are interested in helping financially. 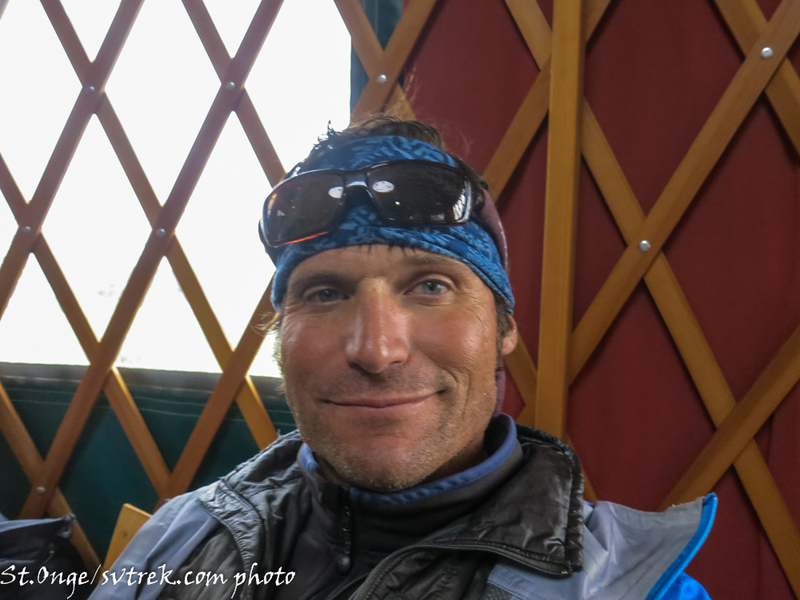 Please check it out and pass this link along to those that may be interested. 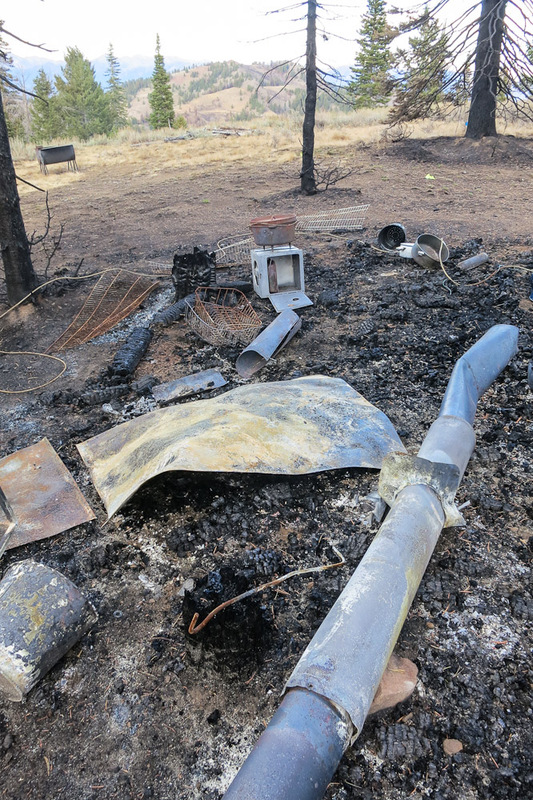 We are also looking for help in the field with the building. 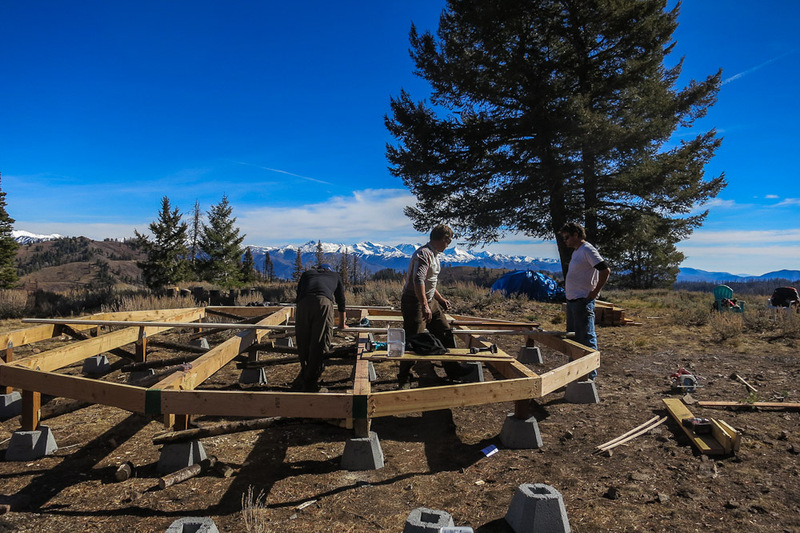 We are planning on building on site October 3-8th and could use some extra hands, especially those with carpentry experience. 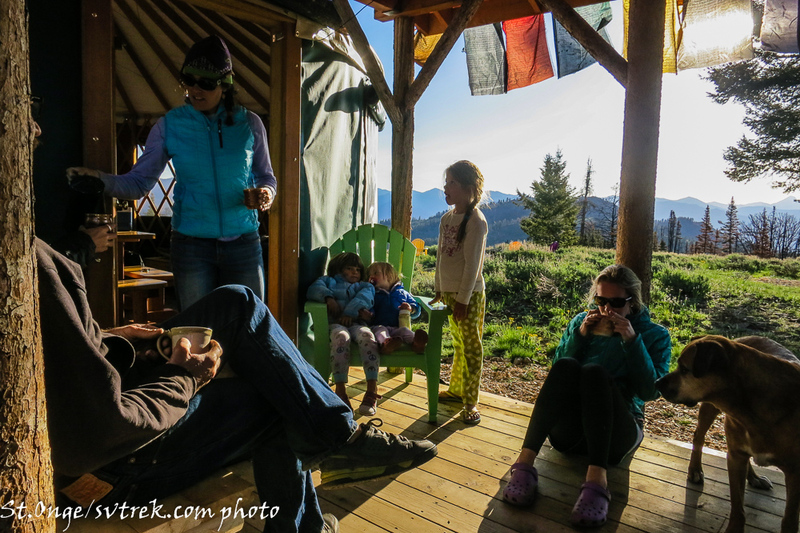 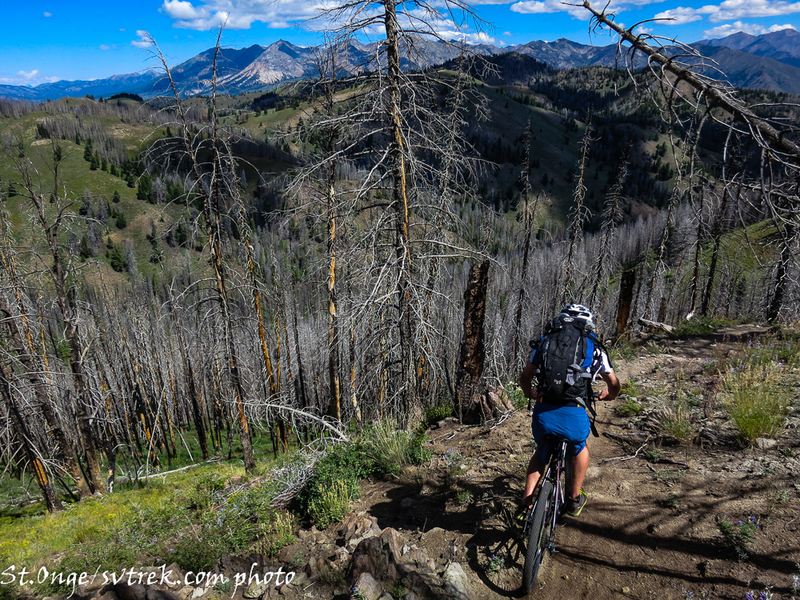 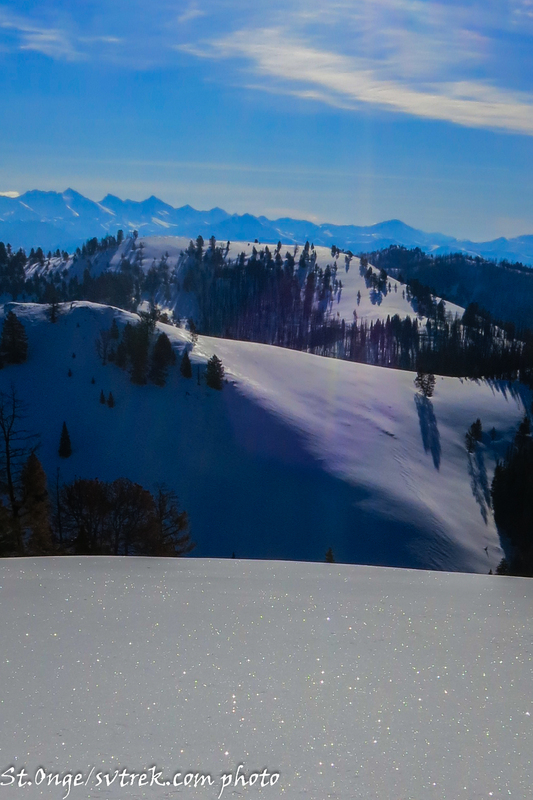 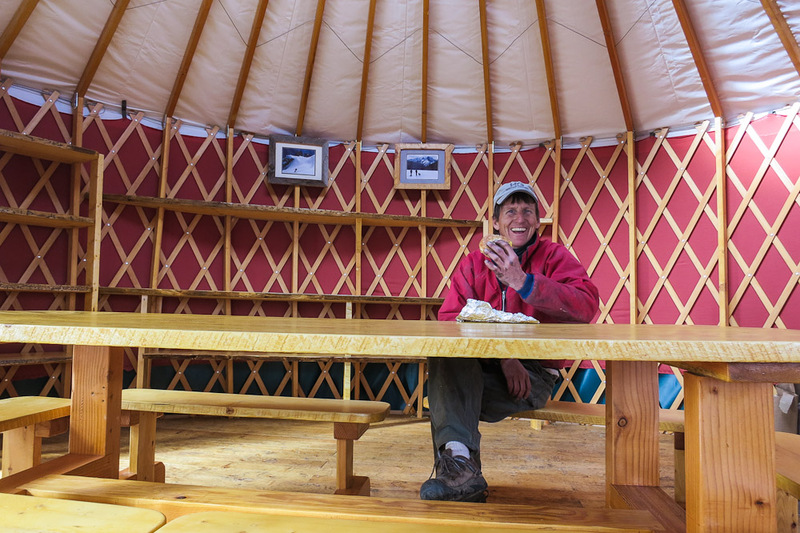 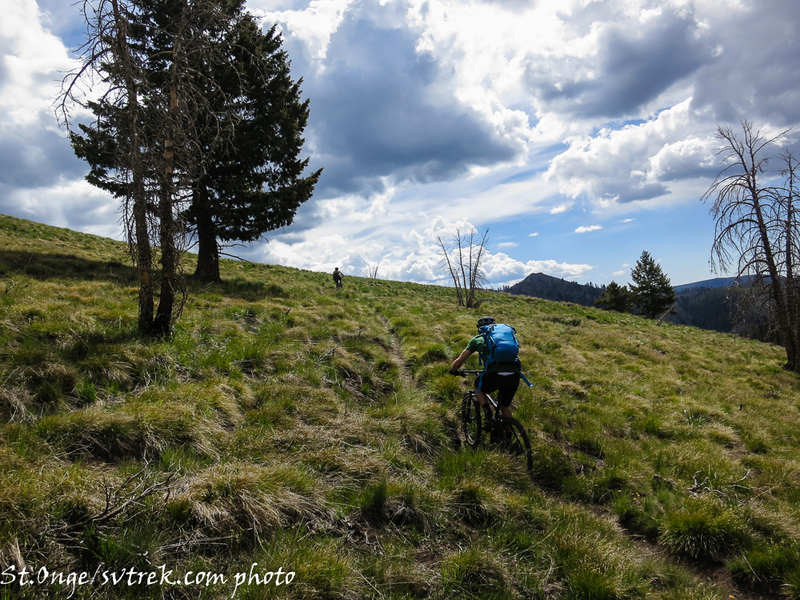 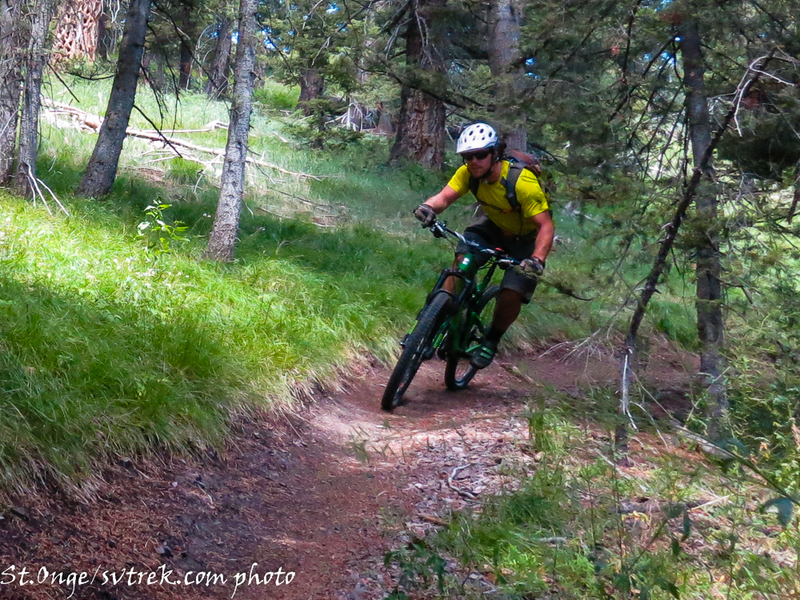 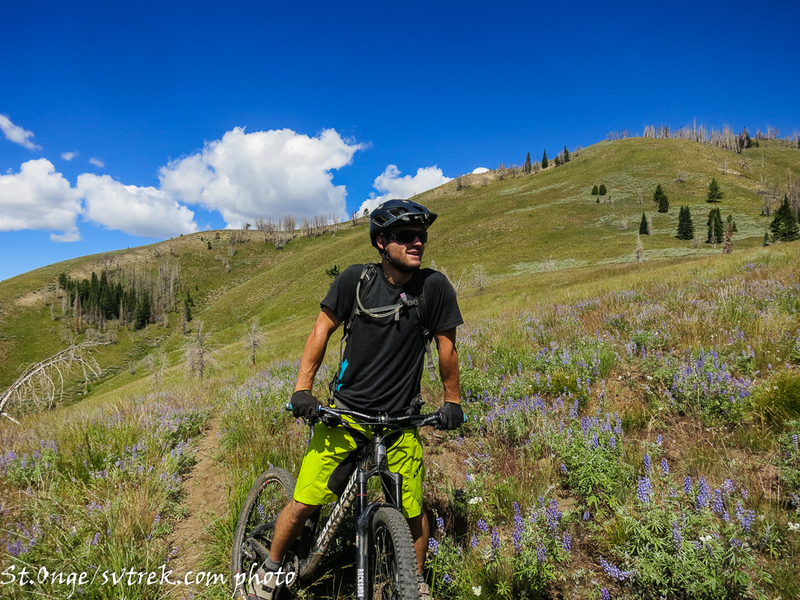 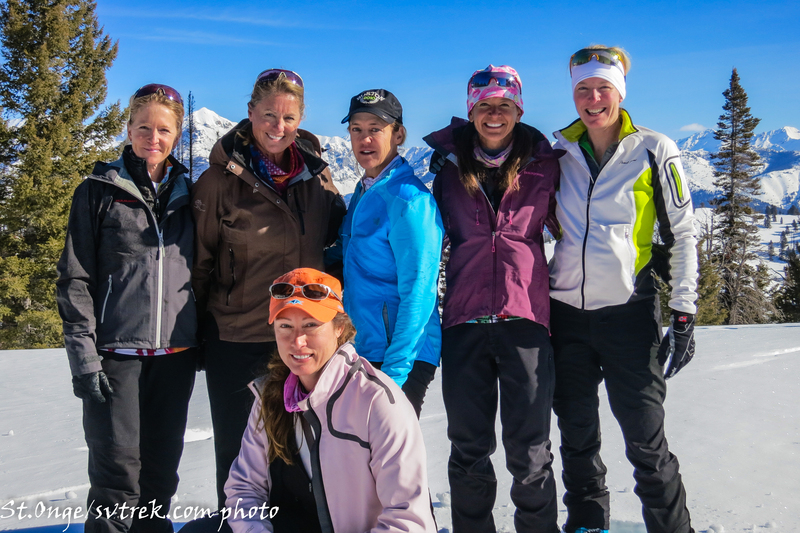 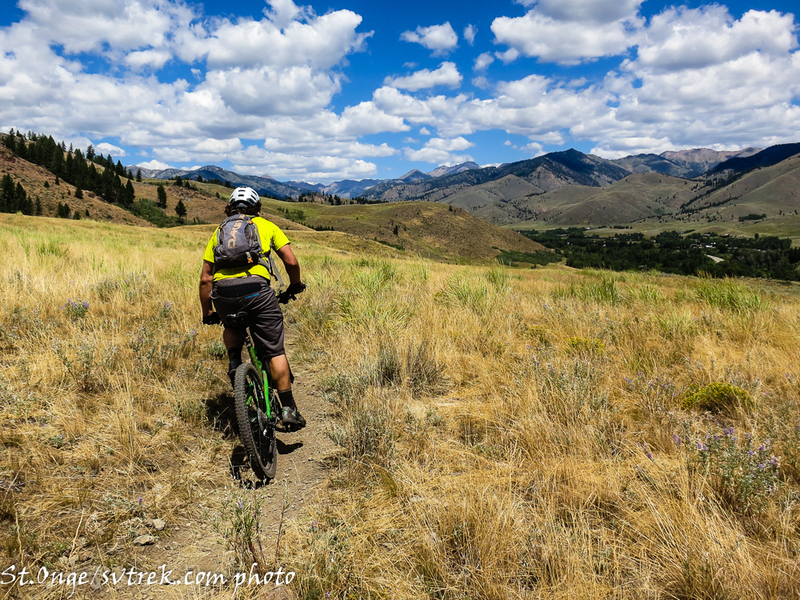 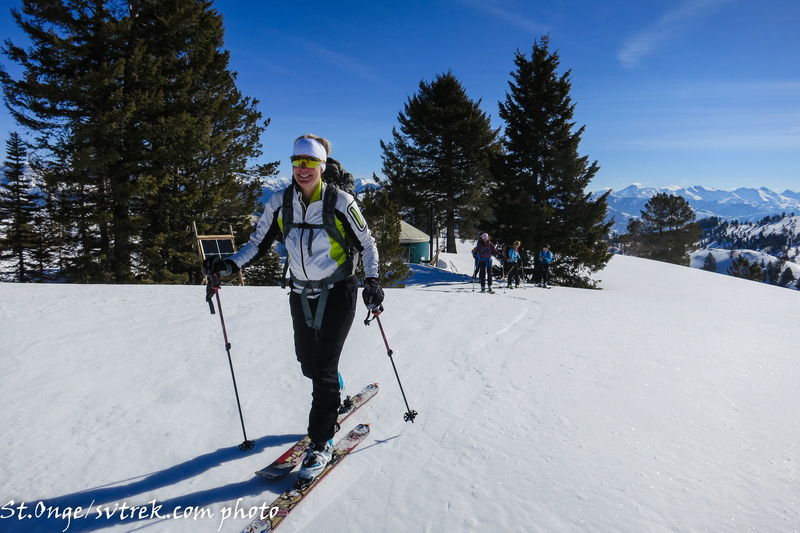 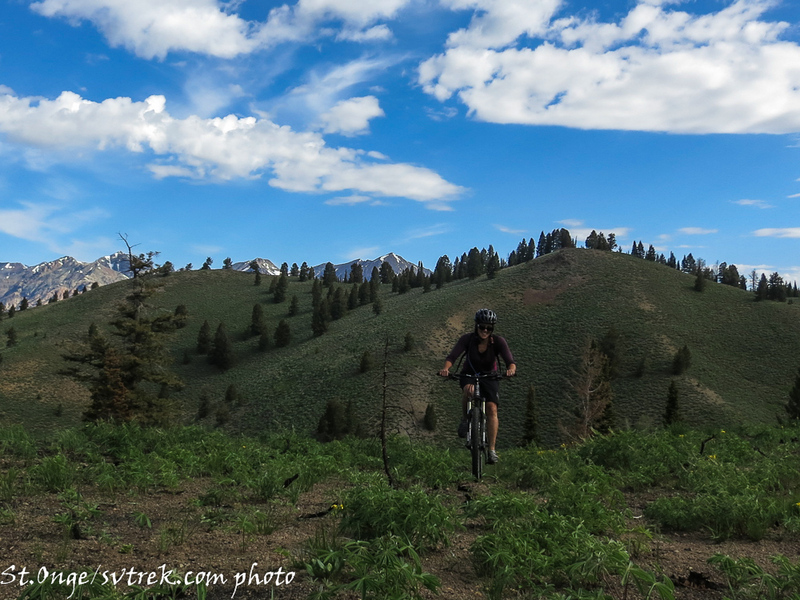 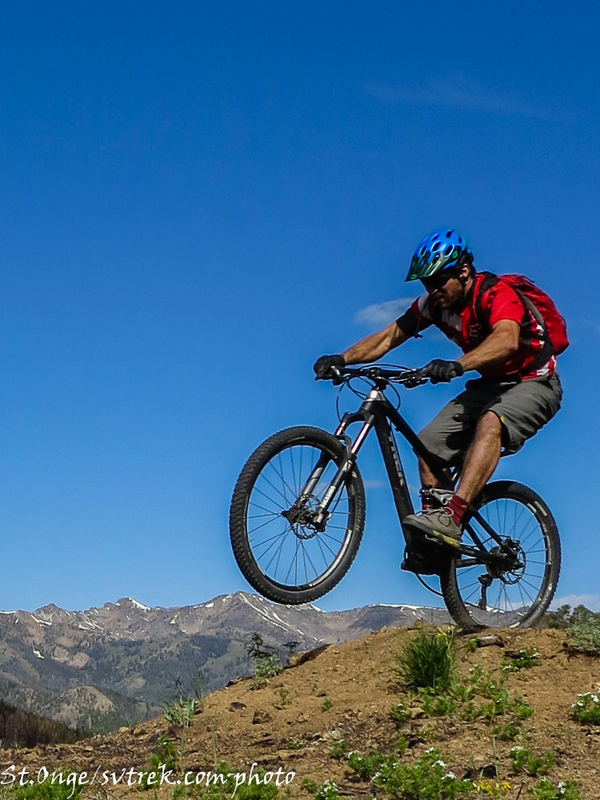 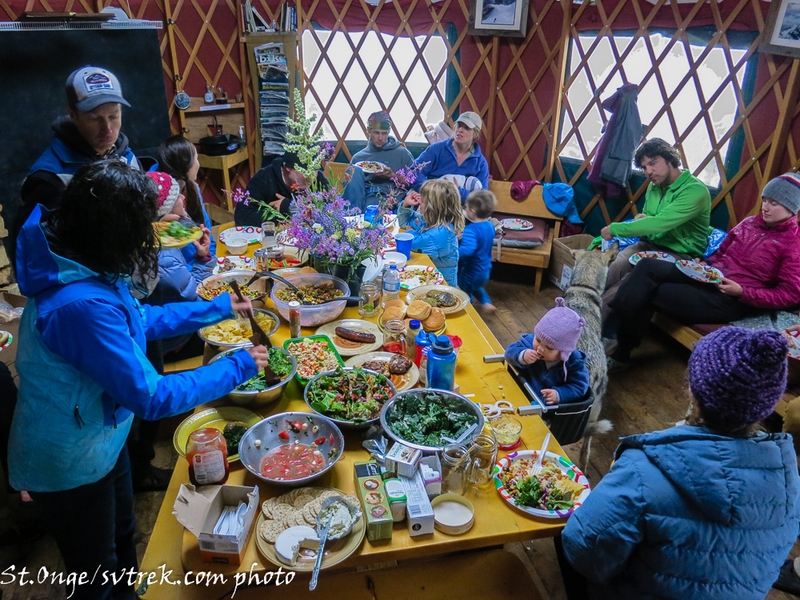 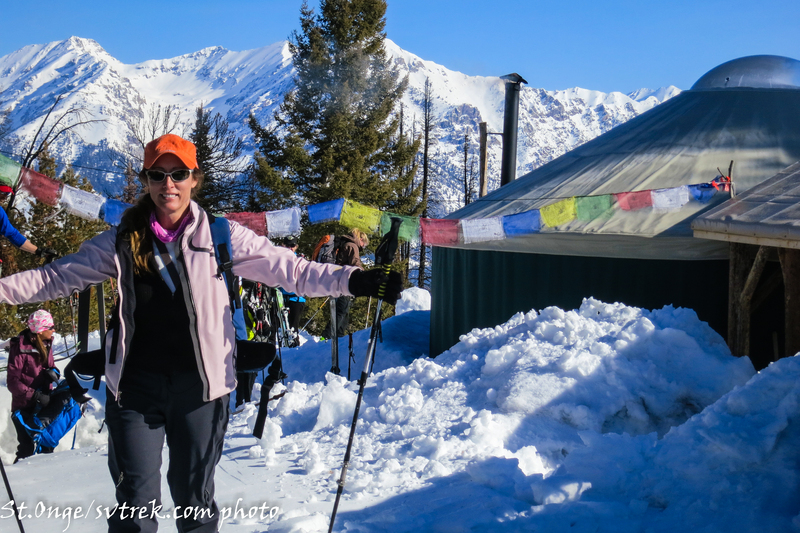 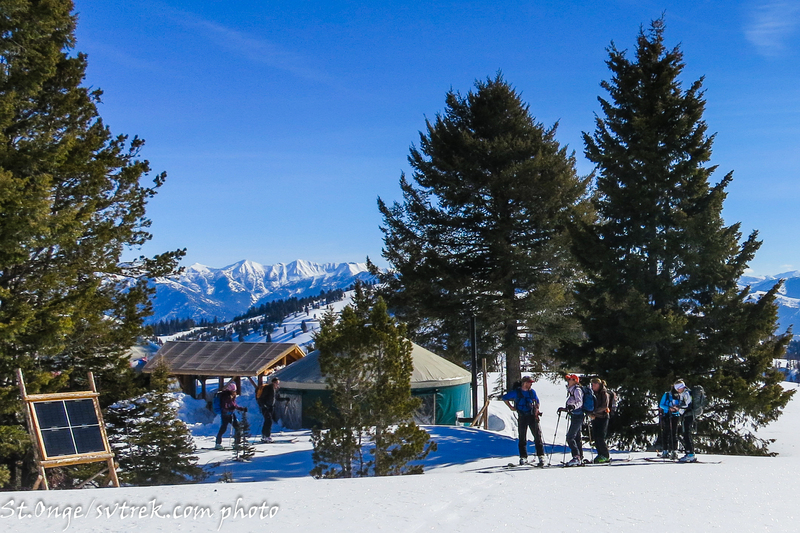 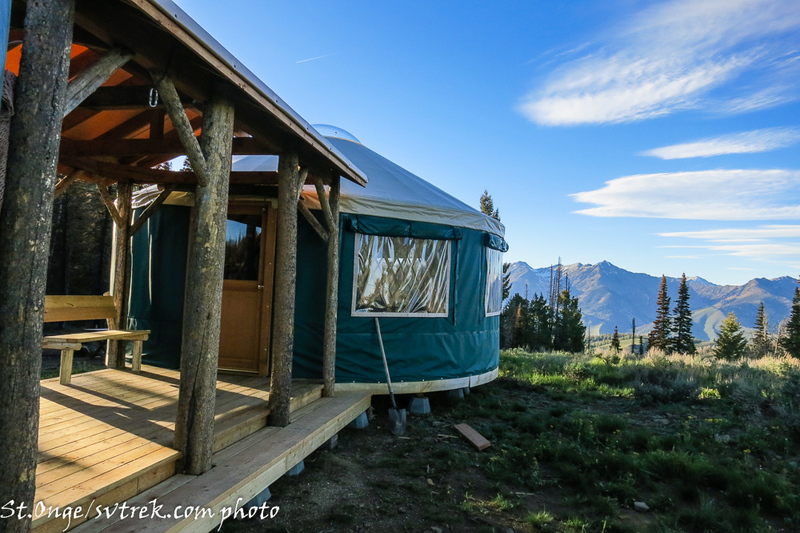 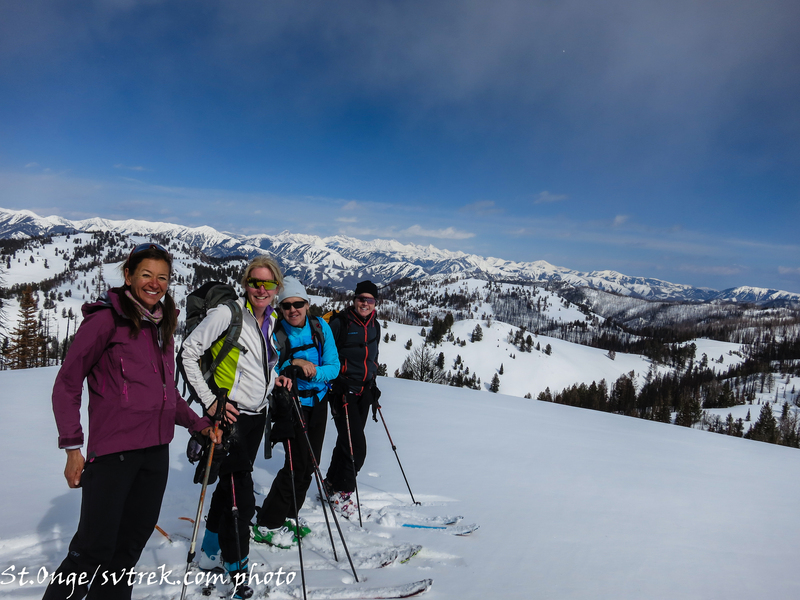 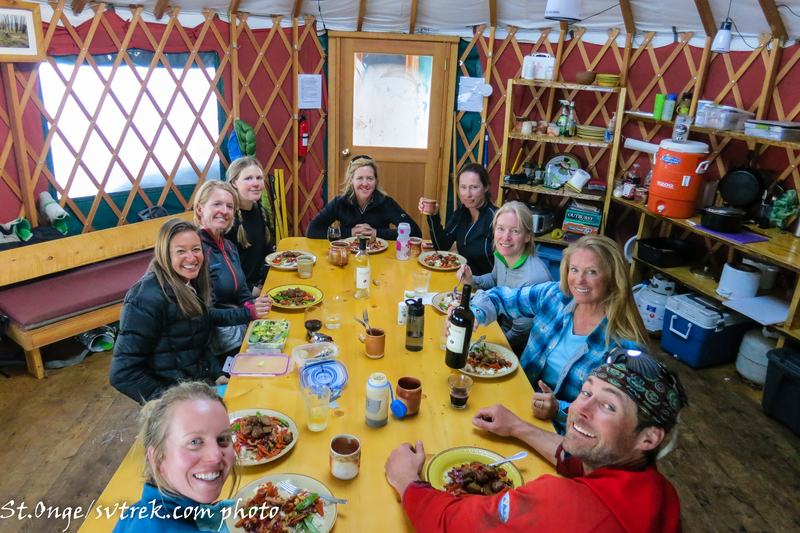 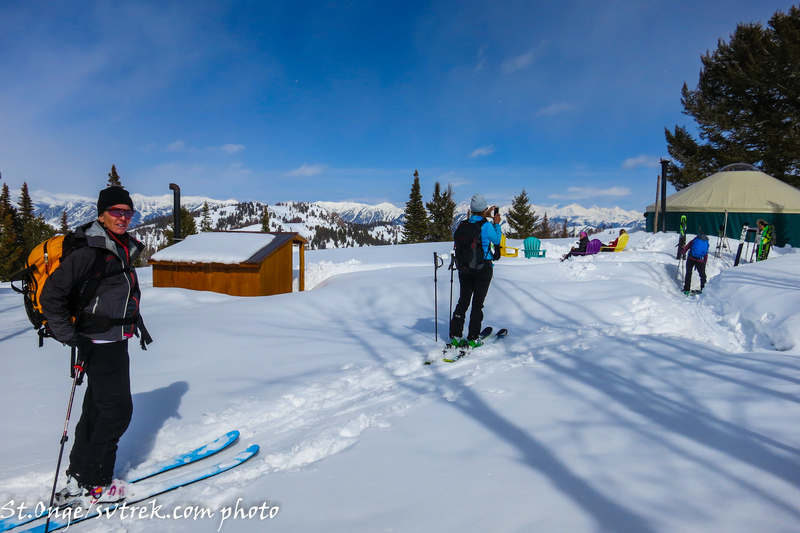 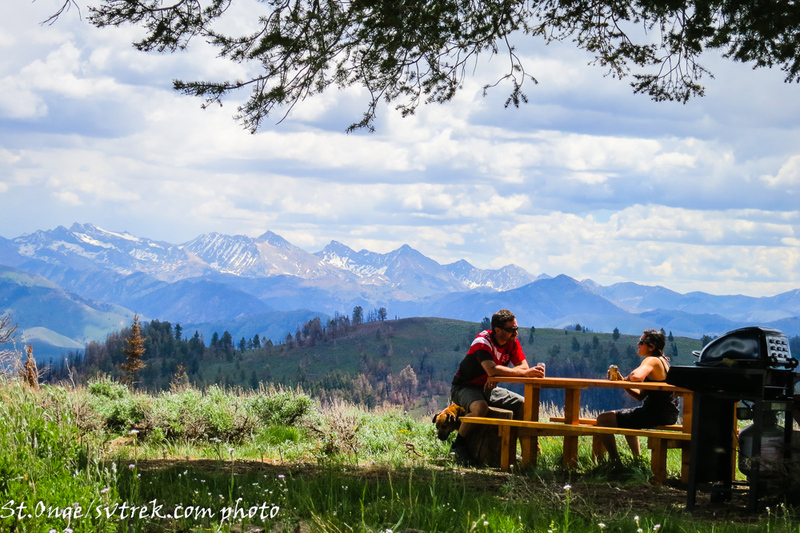 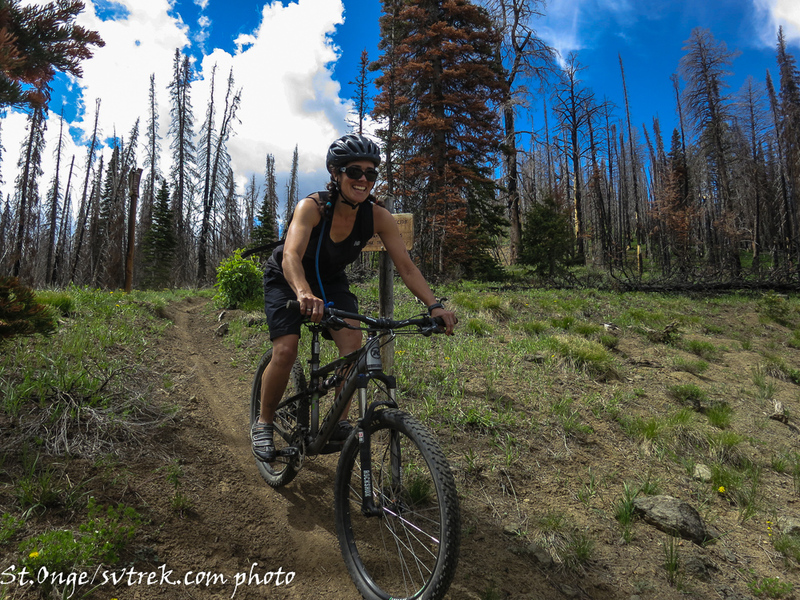 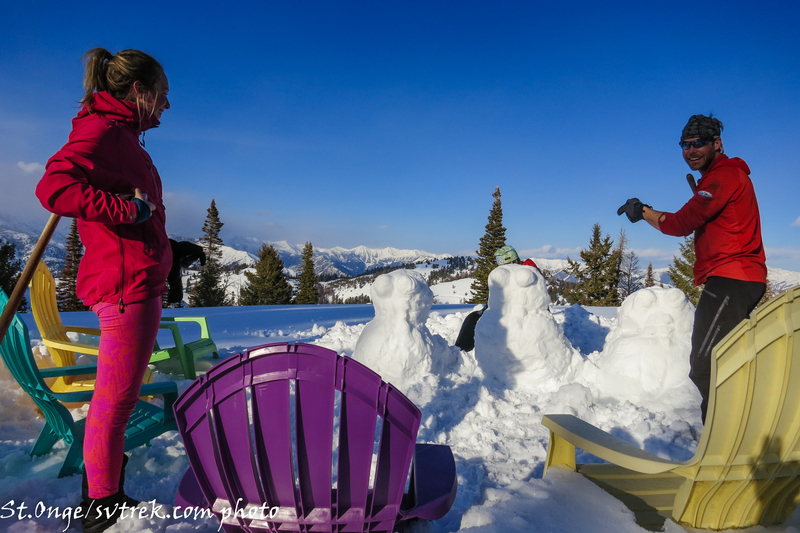 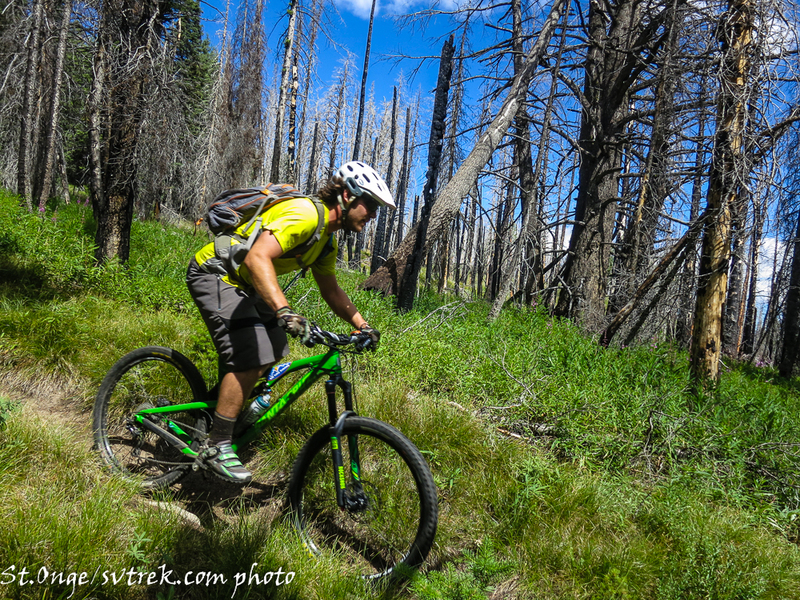 Please email us if you are interested: info@svtrek.com And you can also help by booking some nights at the new Coyote Yurts for this upcoming winter or summer and enjoying a awesome new hut with superb skiing and biking! 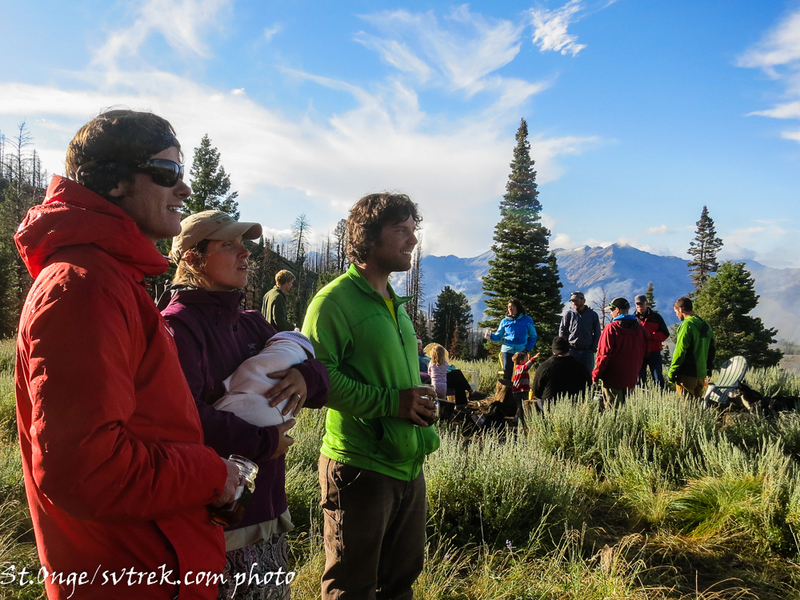 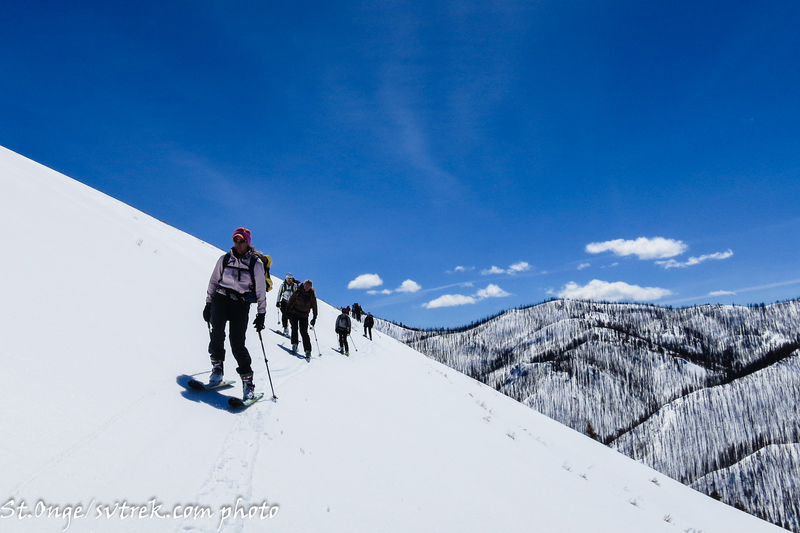 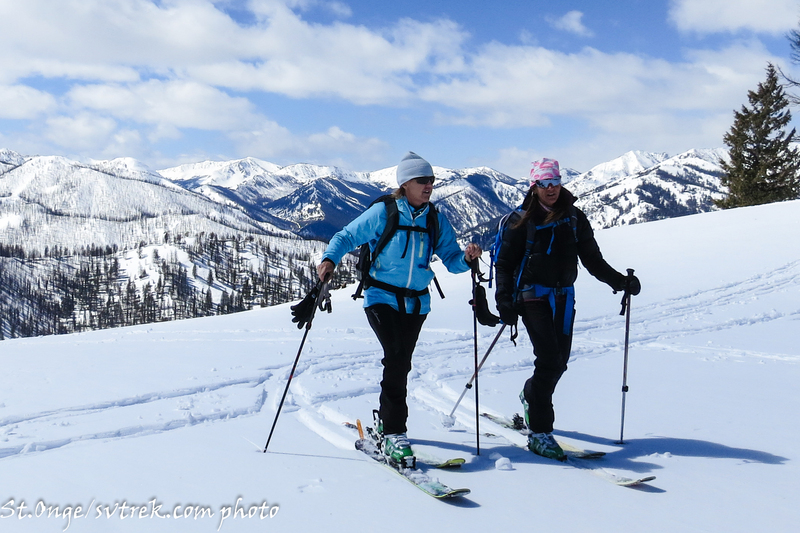 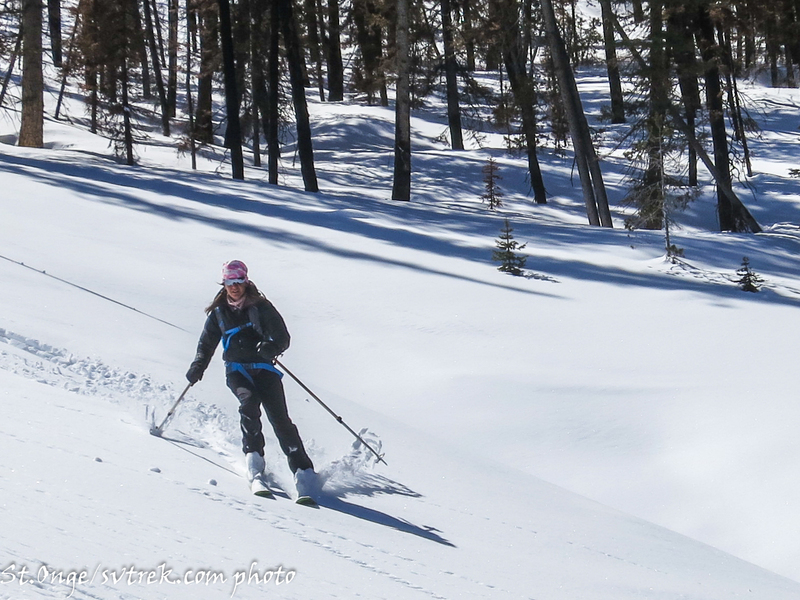 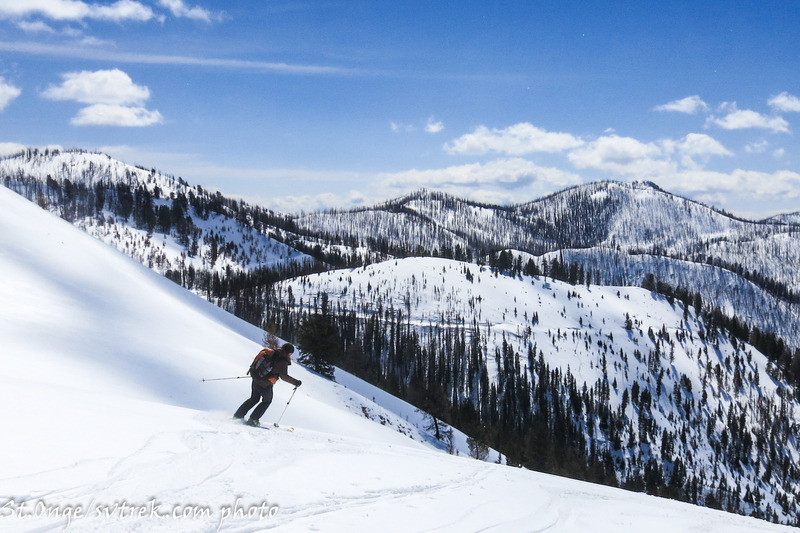 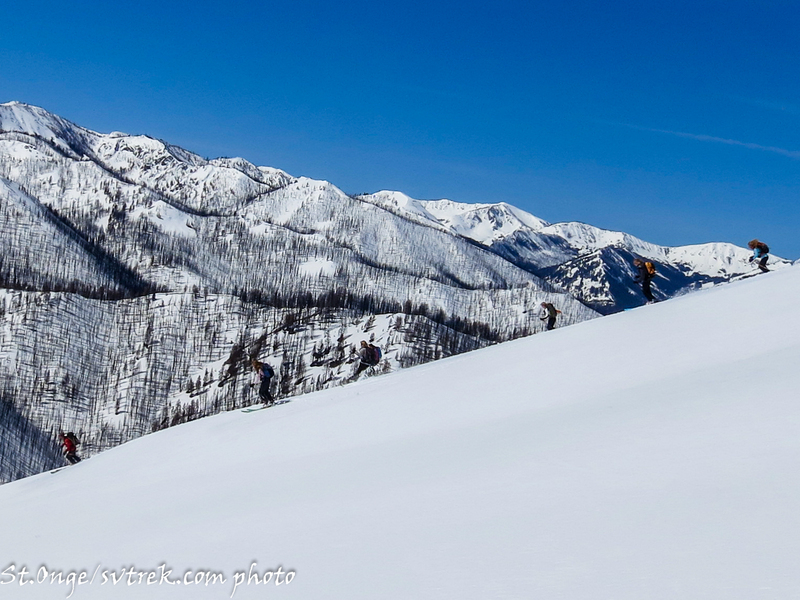 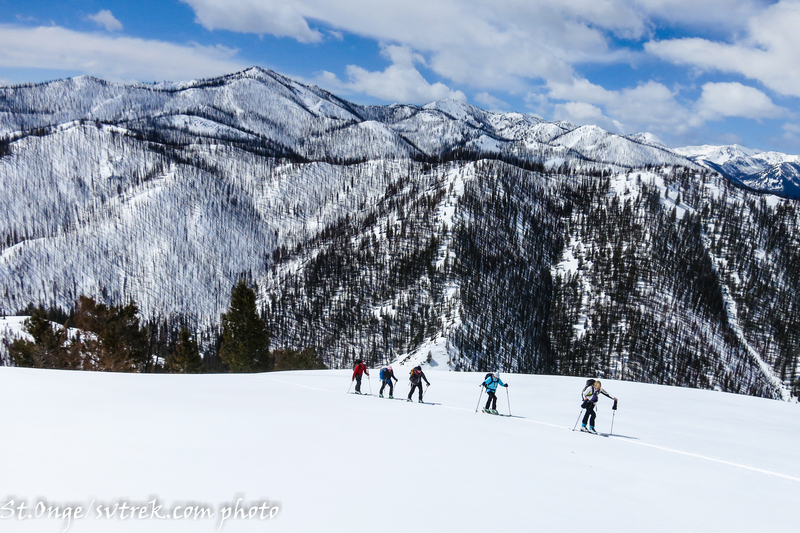 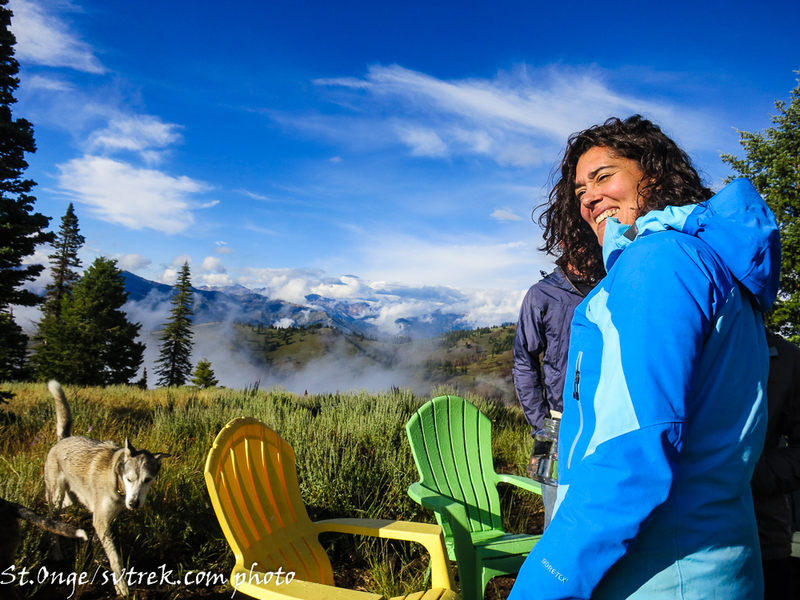 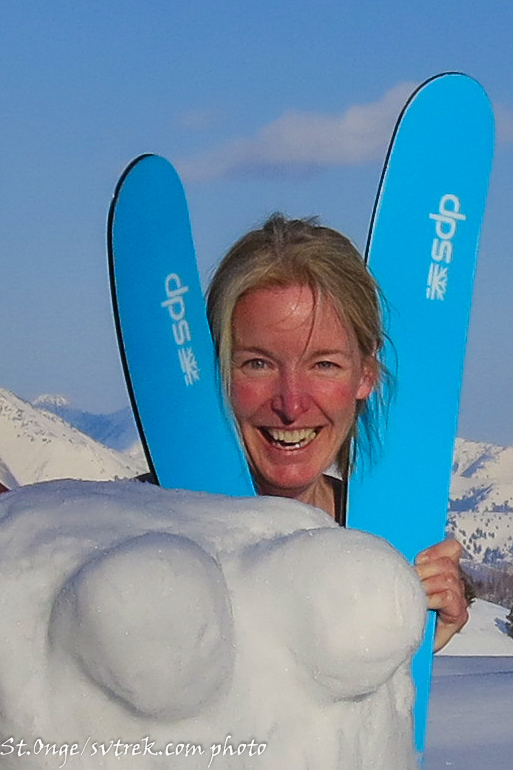 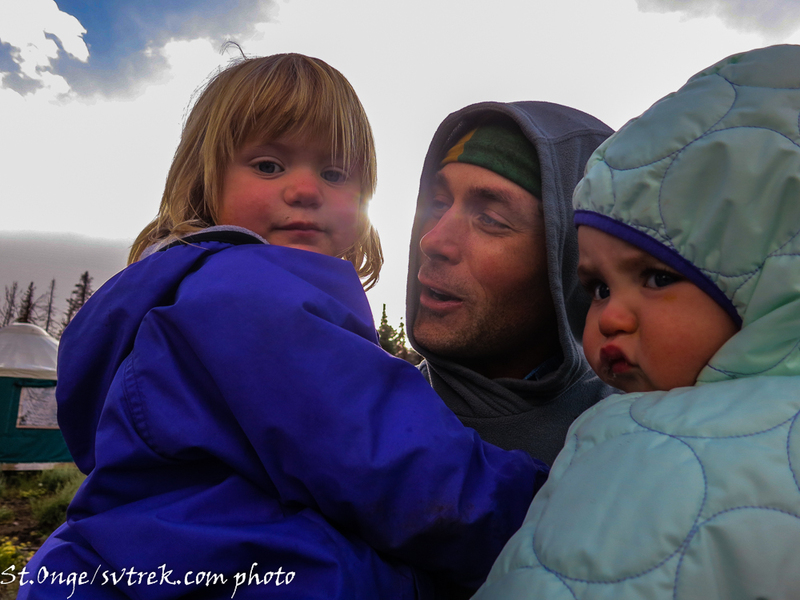 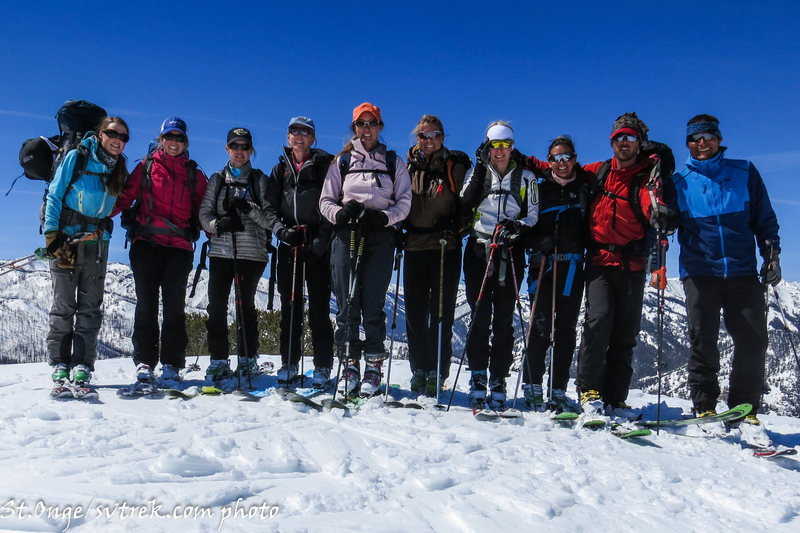 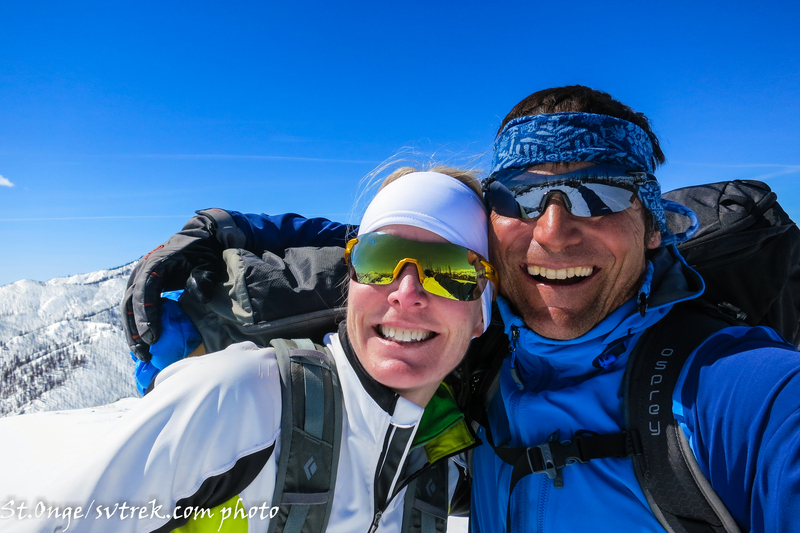 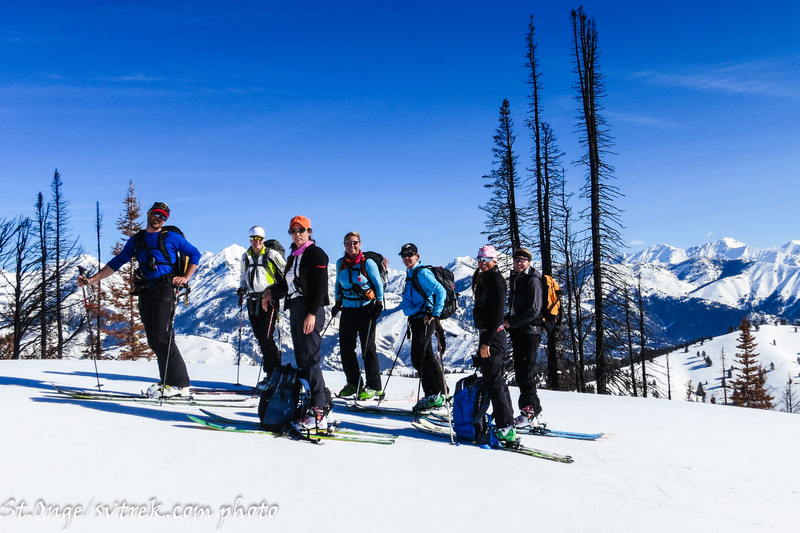 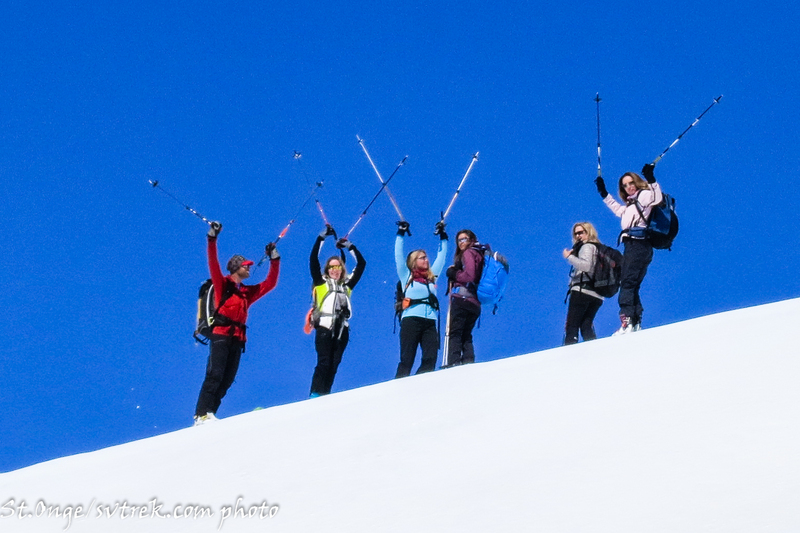 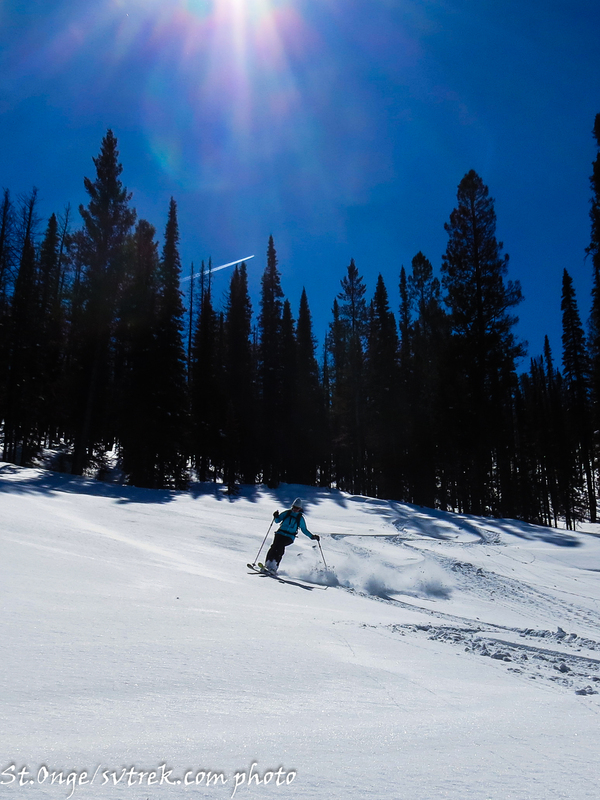 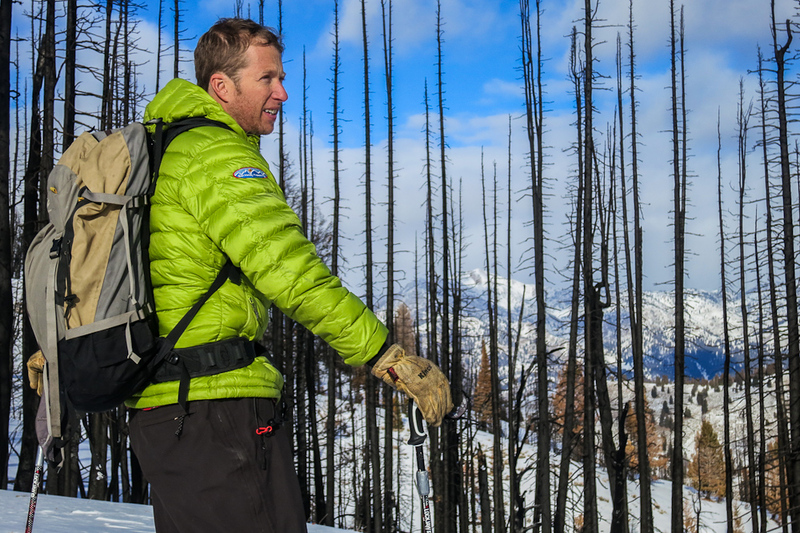 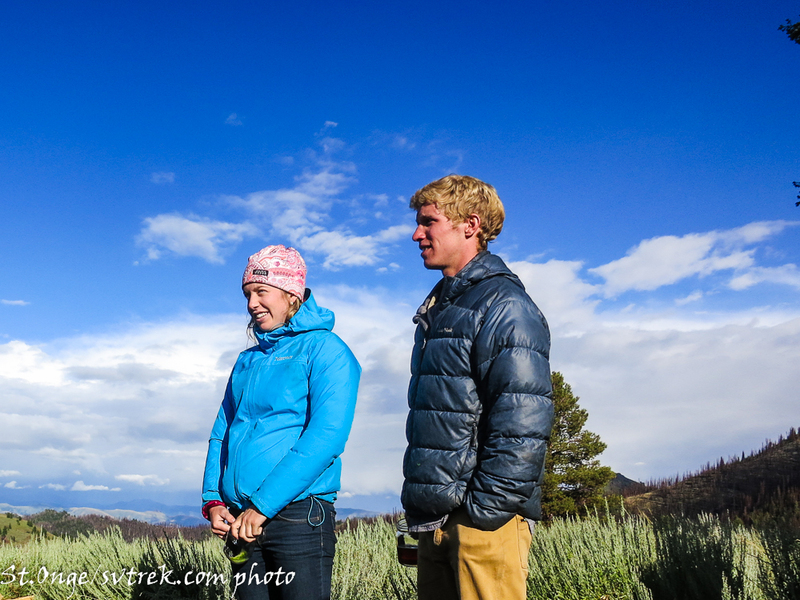 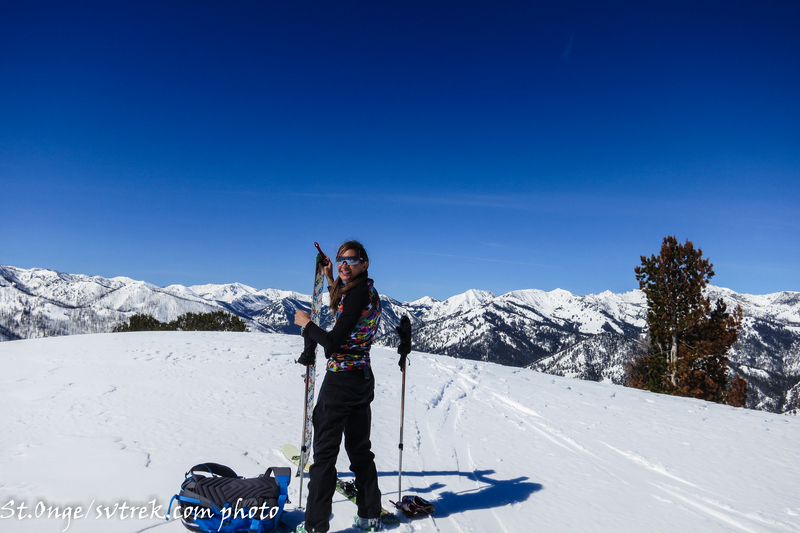 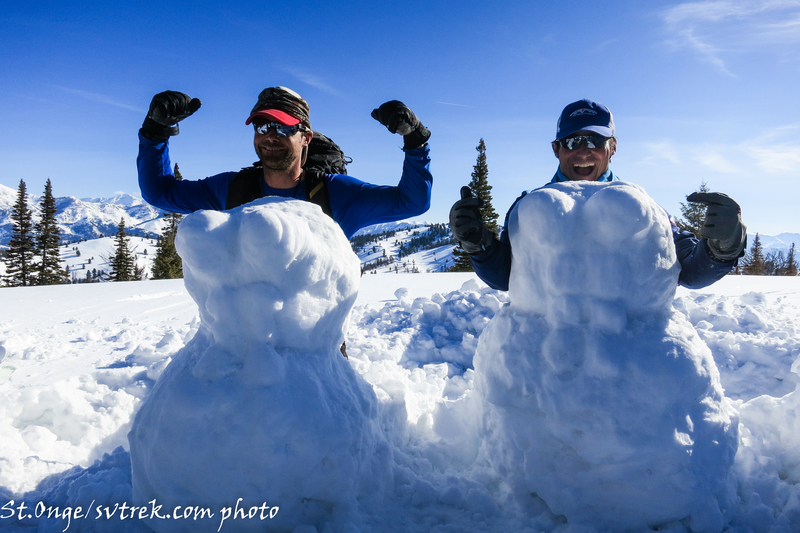 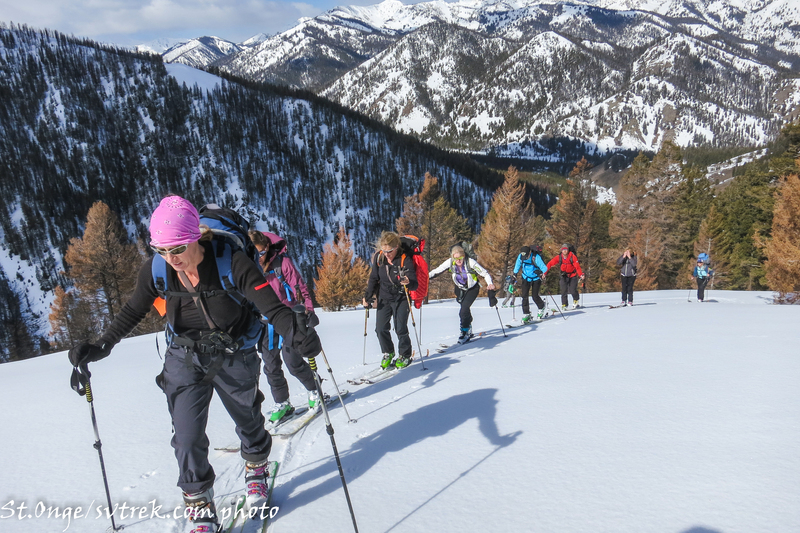 Thanks to you all for being such a supportive backcountry community! 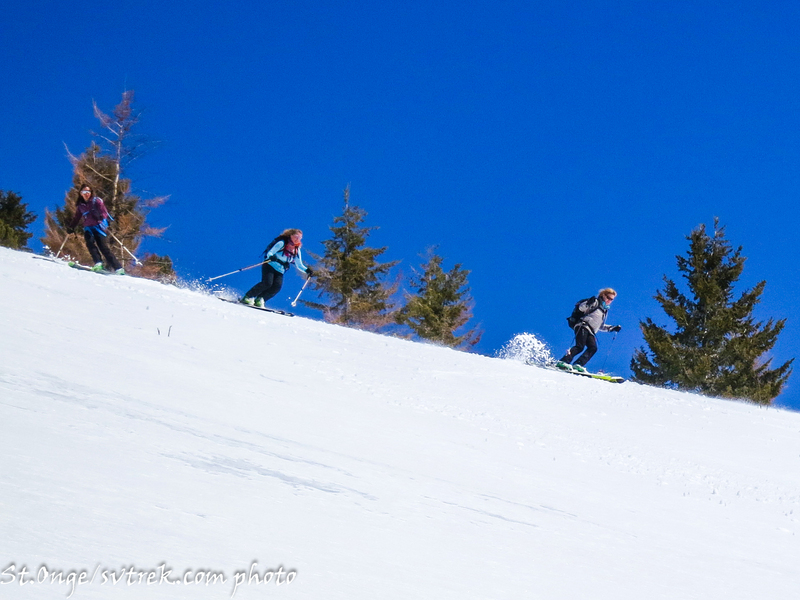 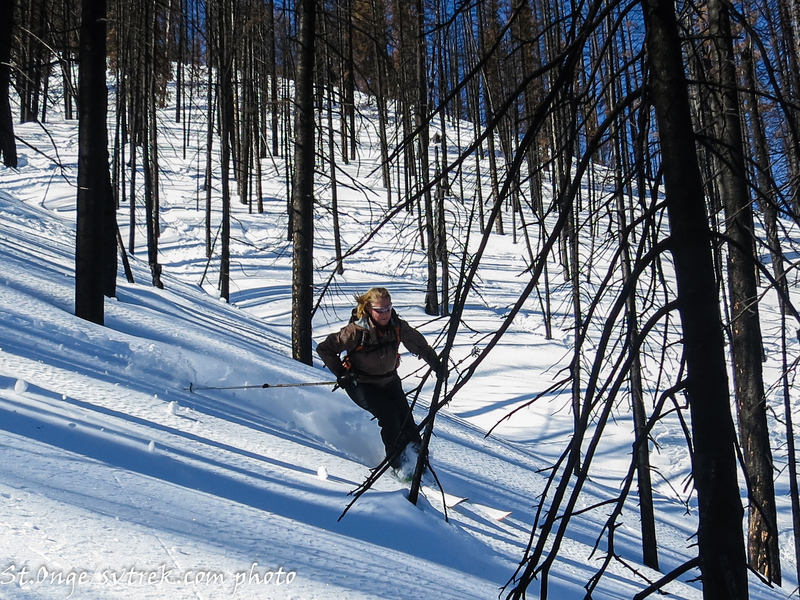 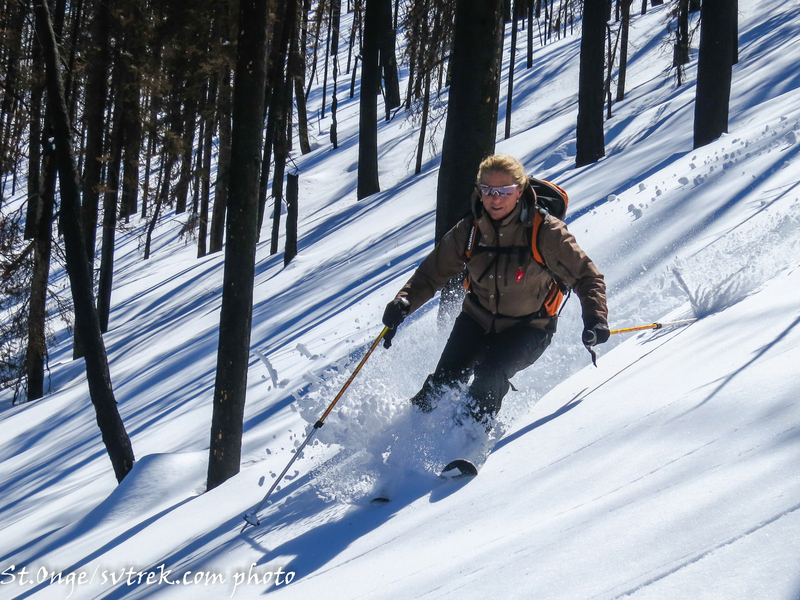 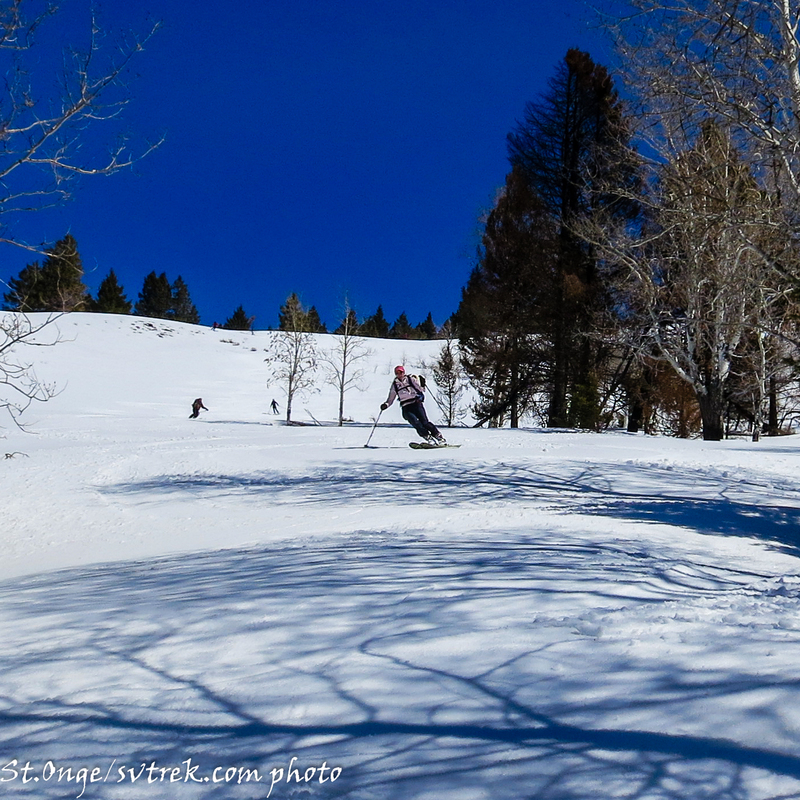 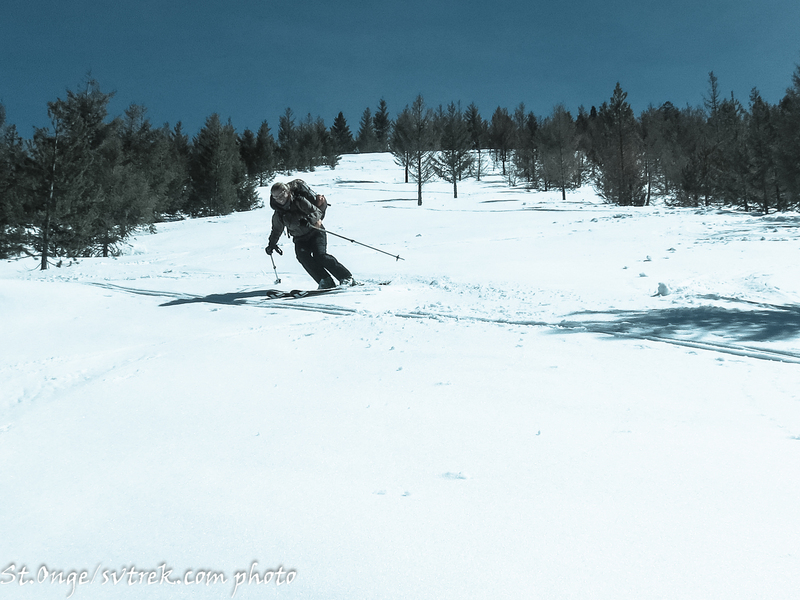 The new burn skiing on Little Round Top, next to Coyote Yurts! 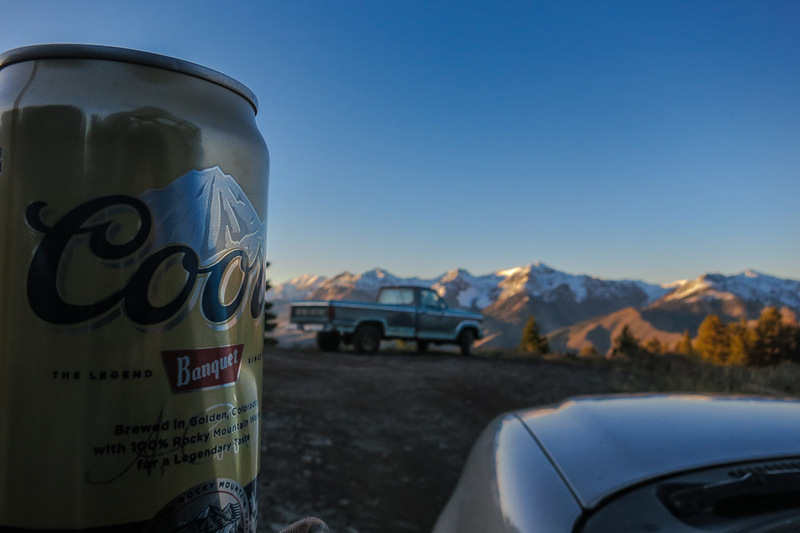 Long dirty days make cold beer taste really good.